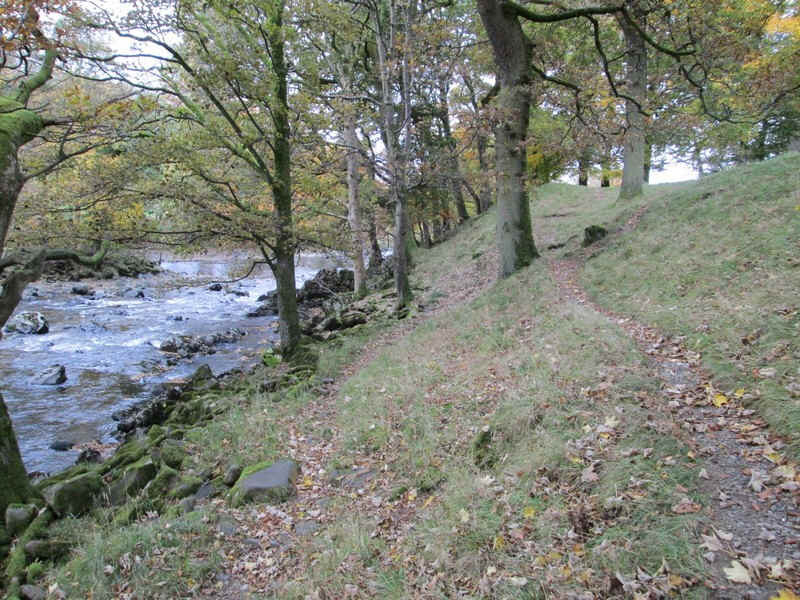 The final day of my coast to coast walk was another long day and about 20 miles in length. 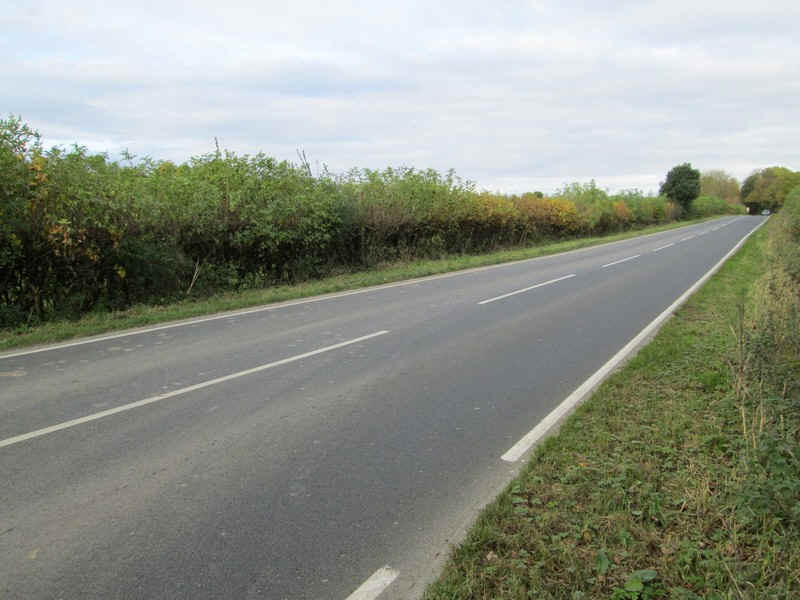 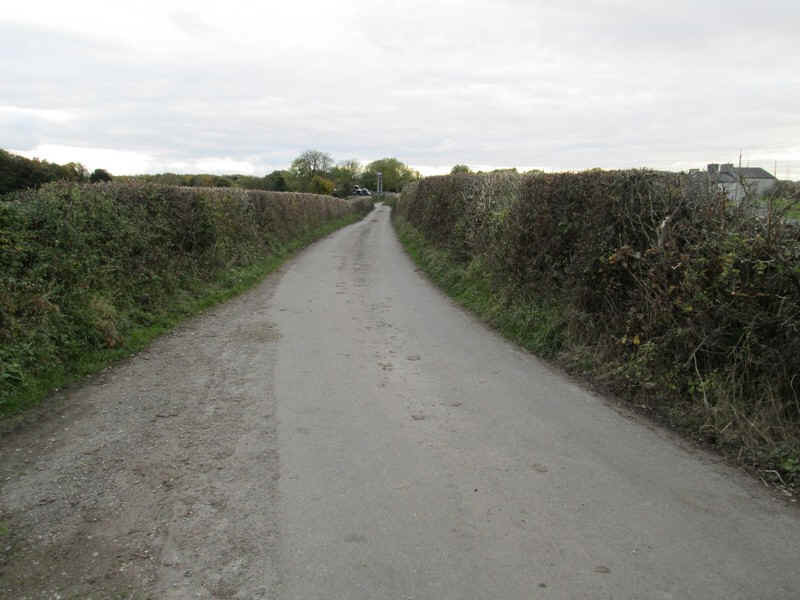 In contrast to the previous eight days much of this was along narrow country lanes linked together with footpaths across fields. 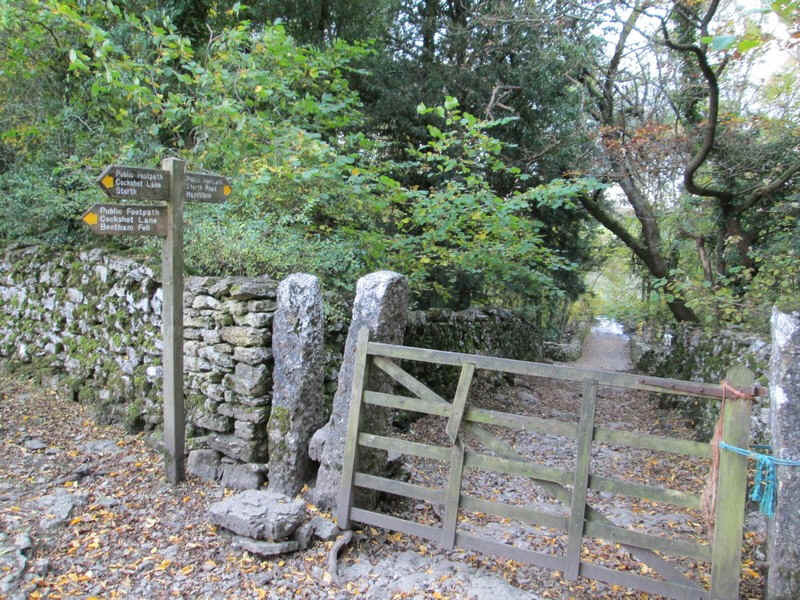 This required accurate map reading - fortunately with only a couple of exceptions the paths were clearly signposted. 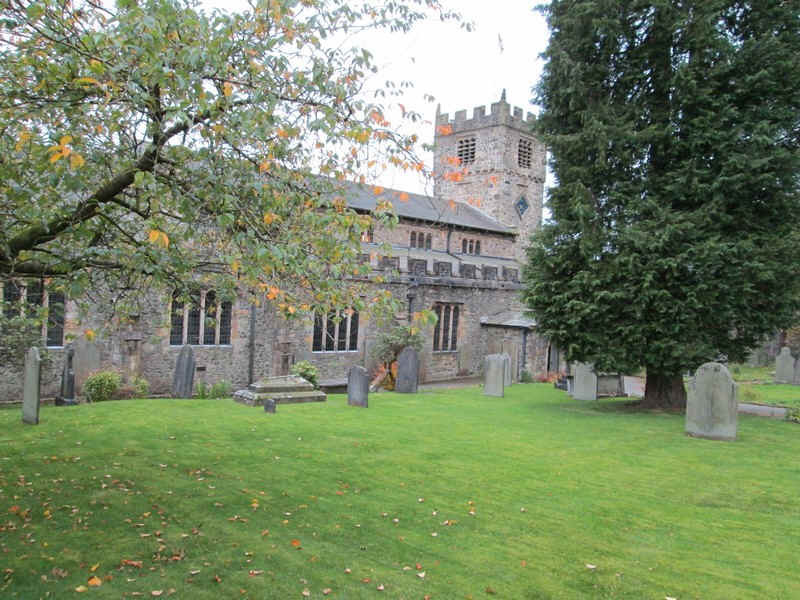 Leaving Sedbergh I headed down the Dent road past..
.....the parish church of St Andrews, which dates back to 1130 although restored in the 19th century. 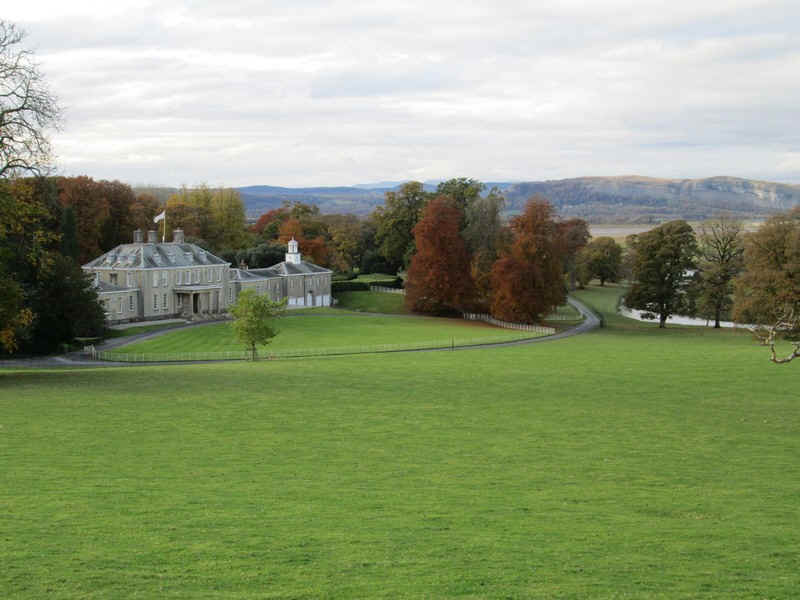 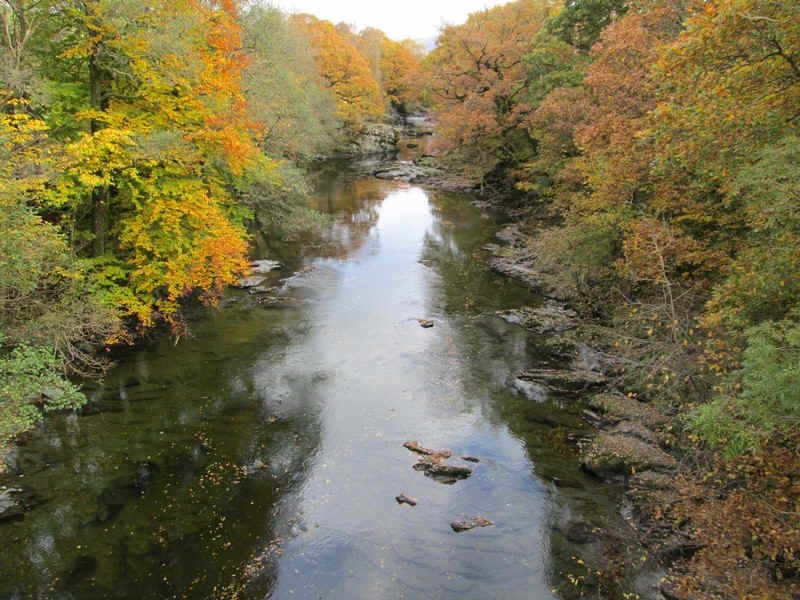 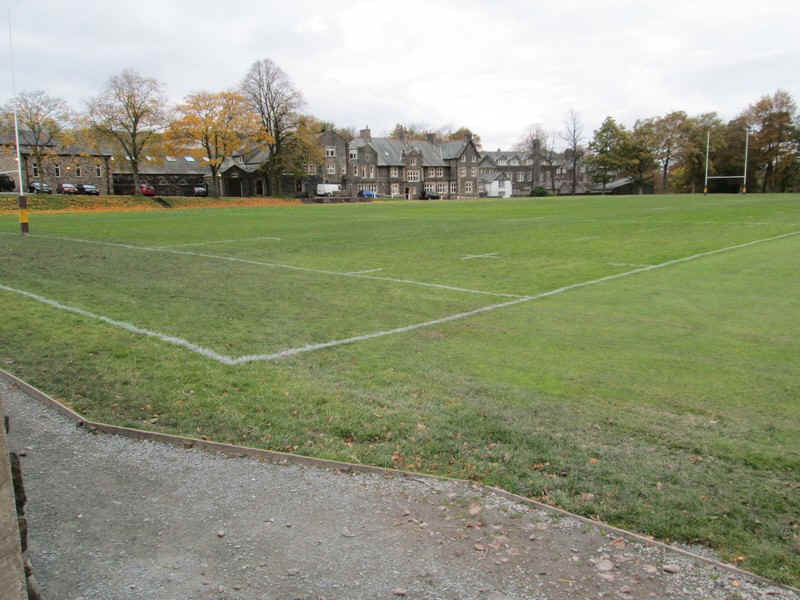 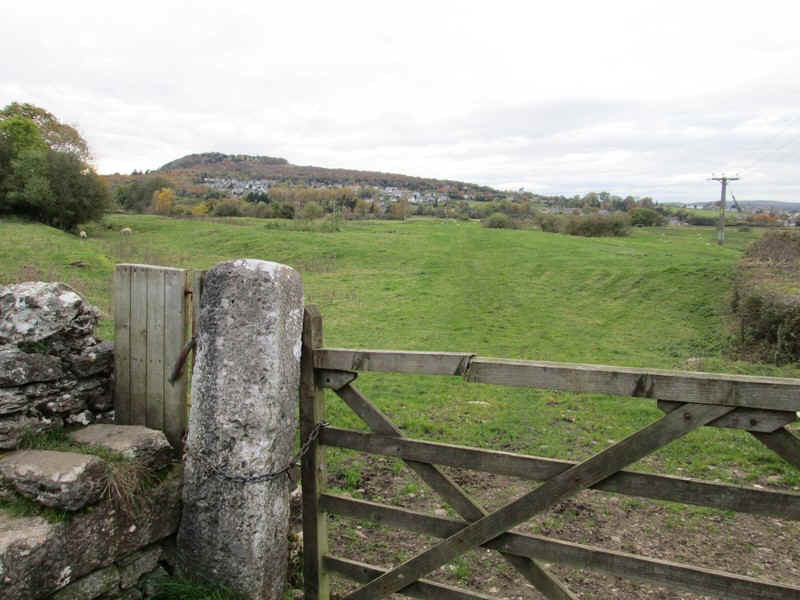 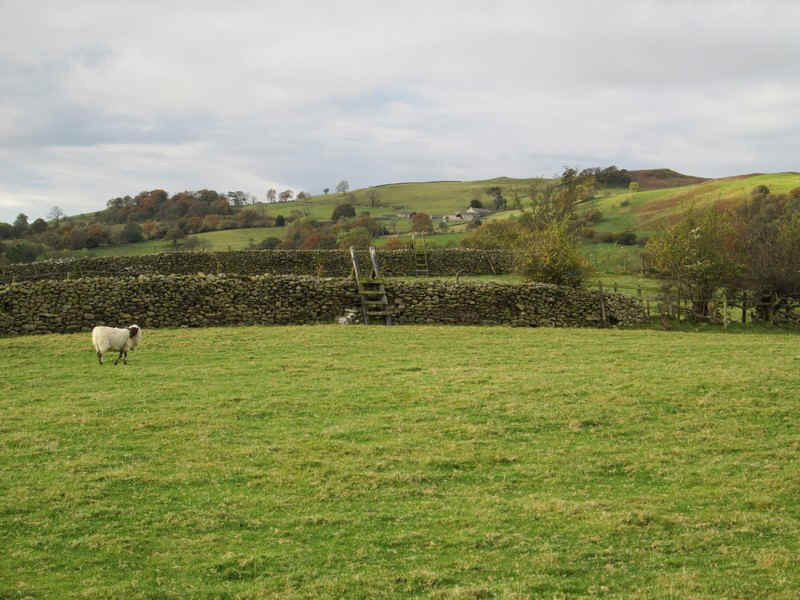 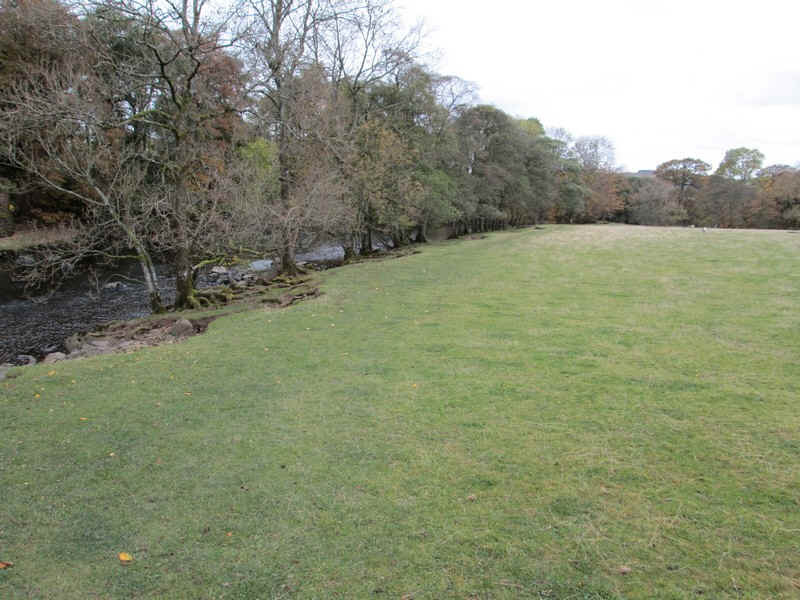 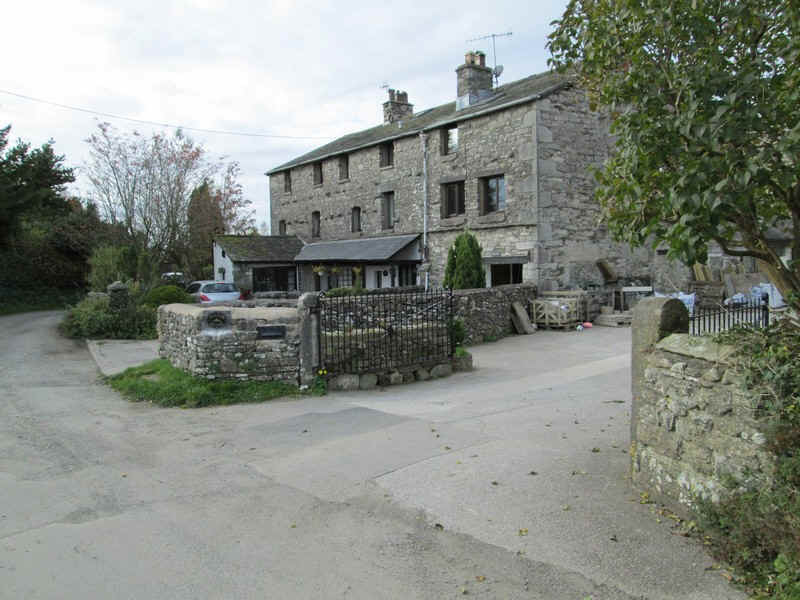 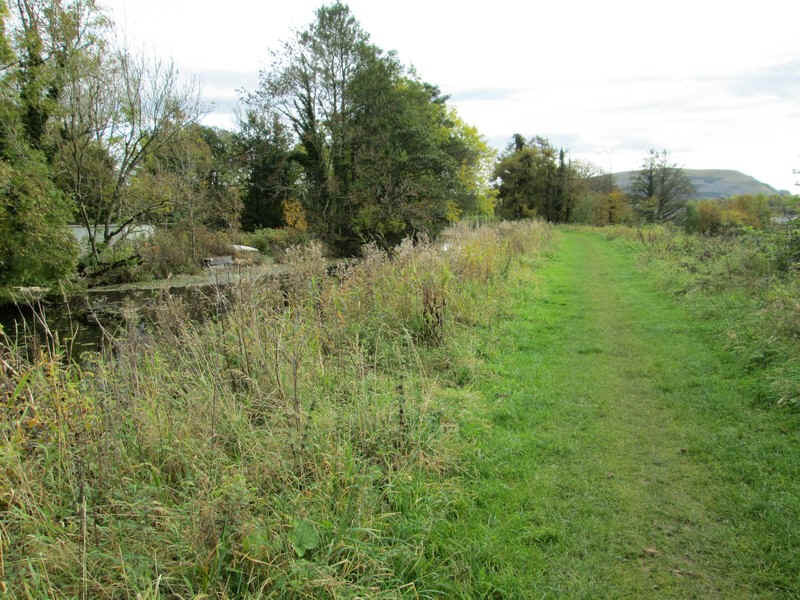 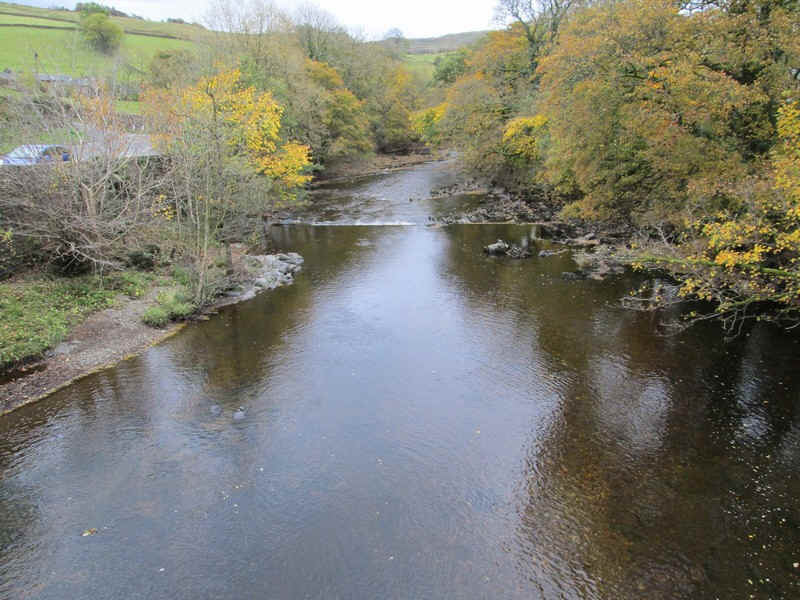 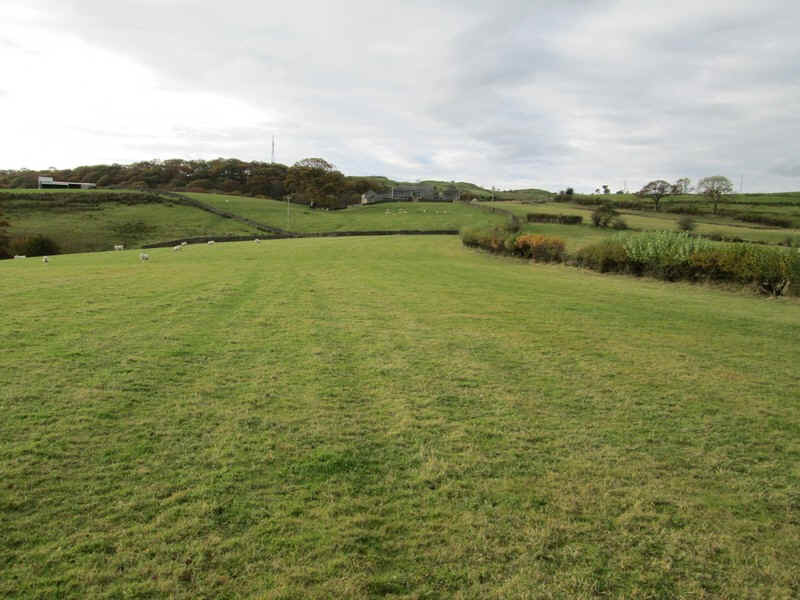 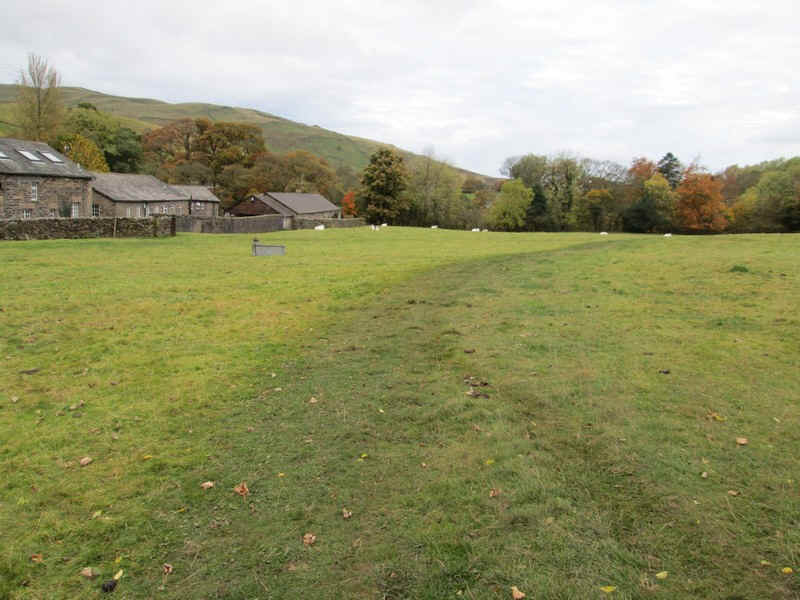 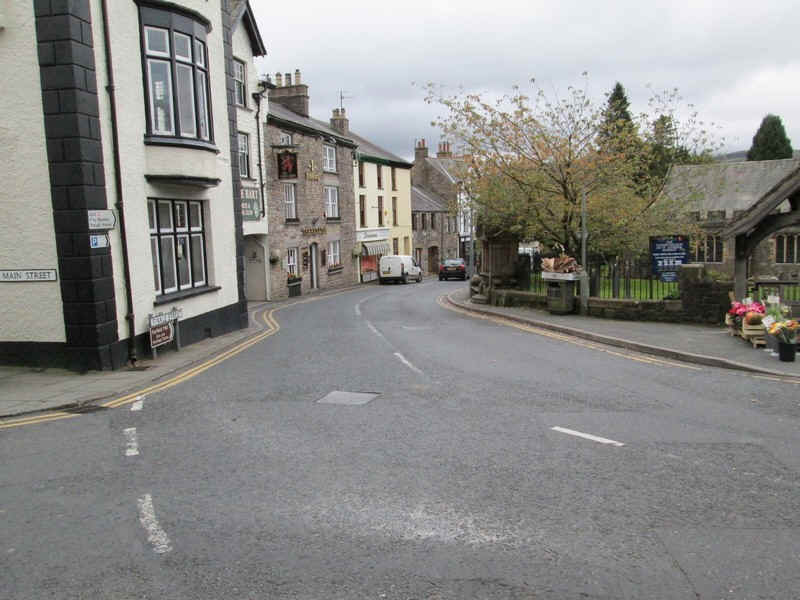 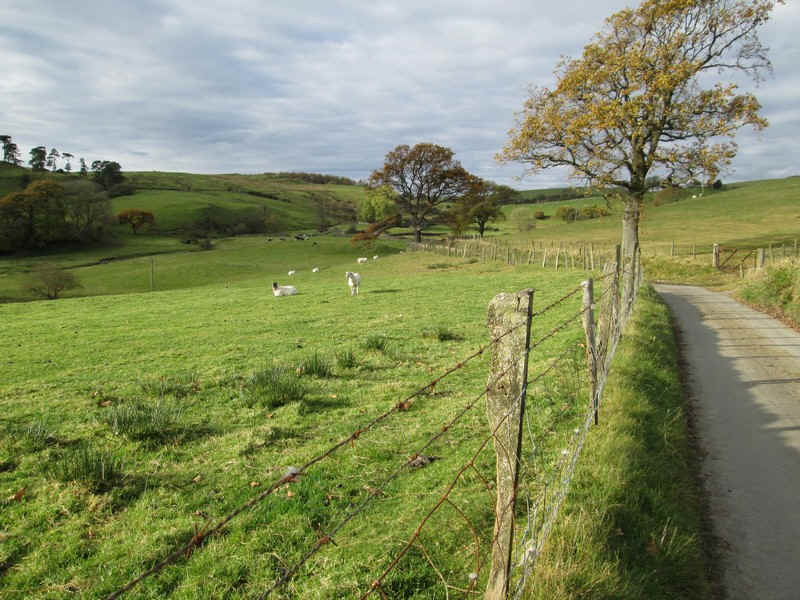 On the outskirts of the town lies Sedbergh School (founded in 1525) and its extensive playing fields that spread across the lower part of Sedbergh. 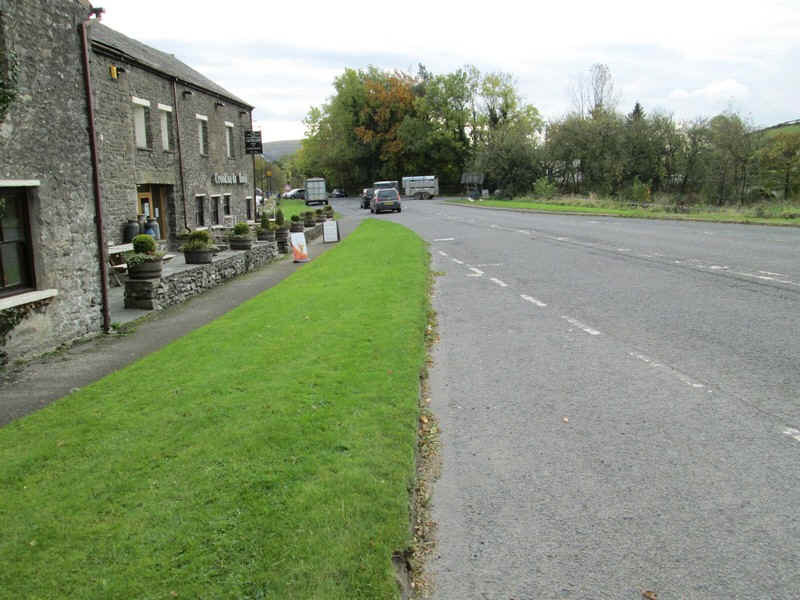 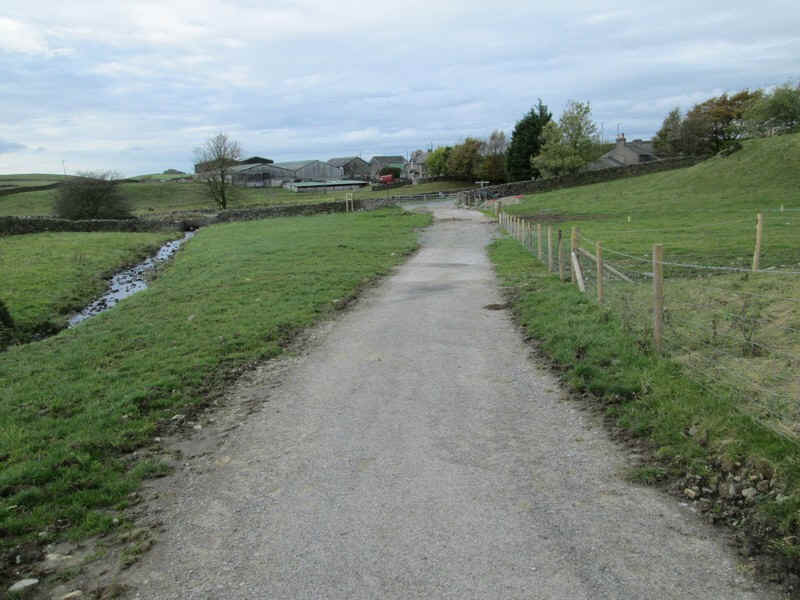 ....where my route joined the Dales Way for the next few miles. 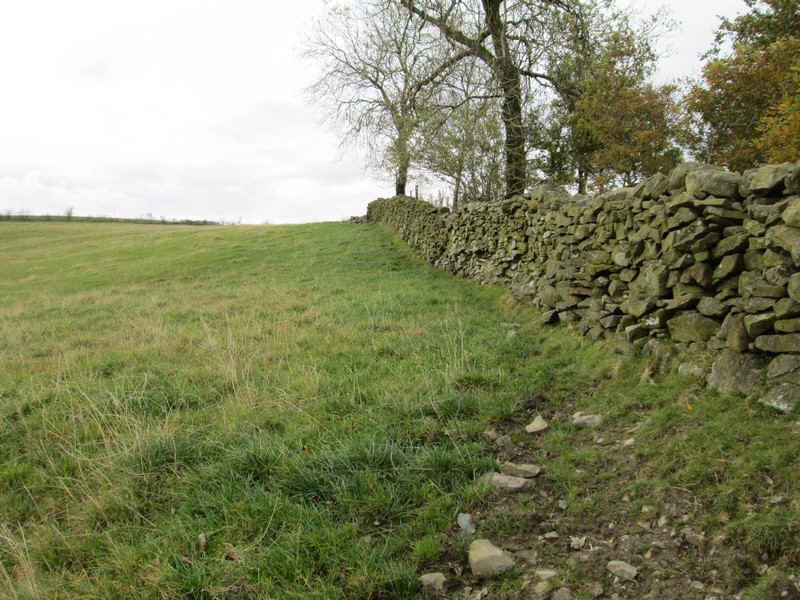 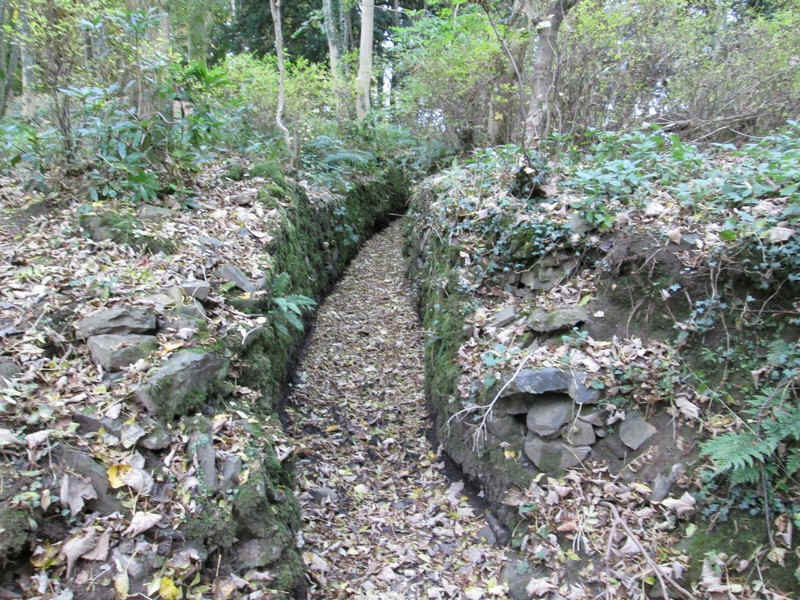 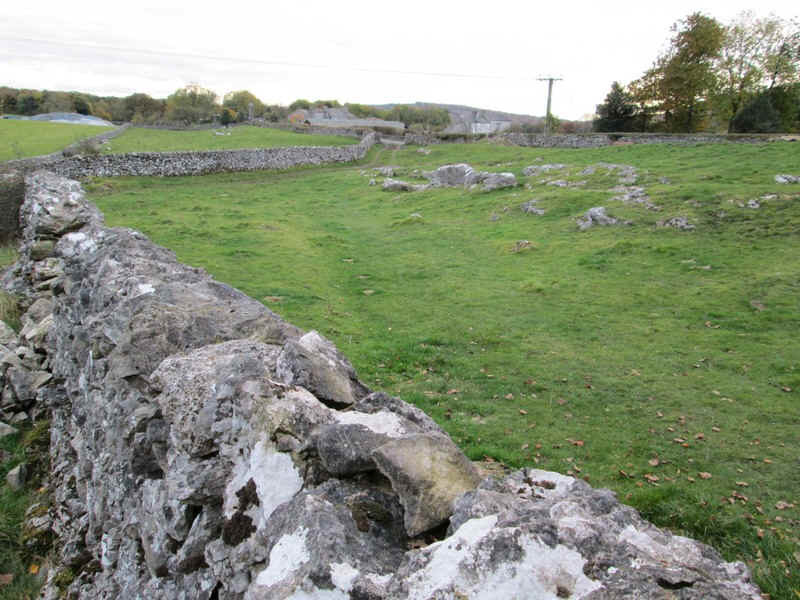 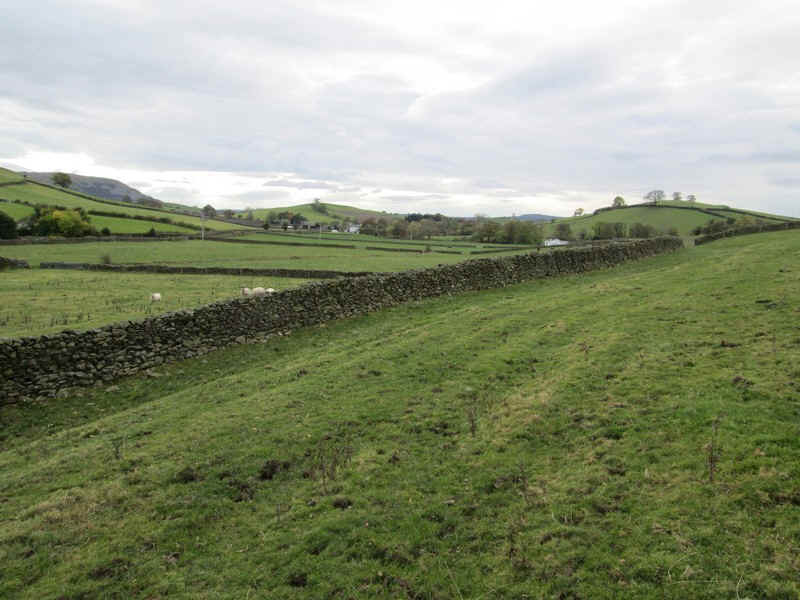 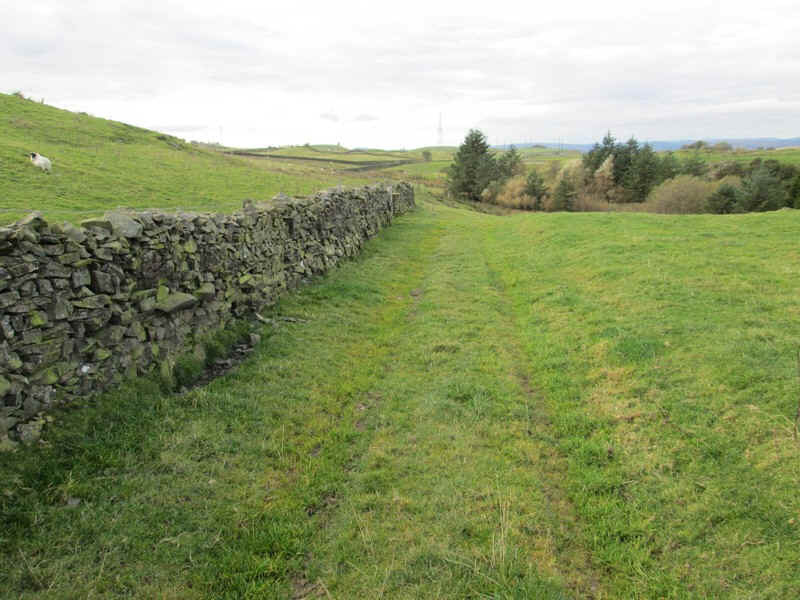 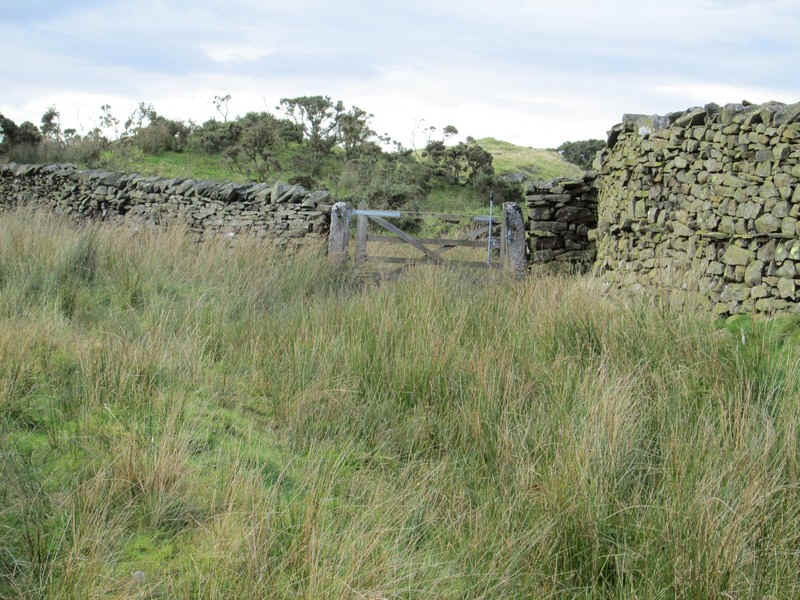 At first the Dales Way heads across meadows and then..
.....with this curious sunken section between stone walls. 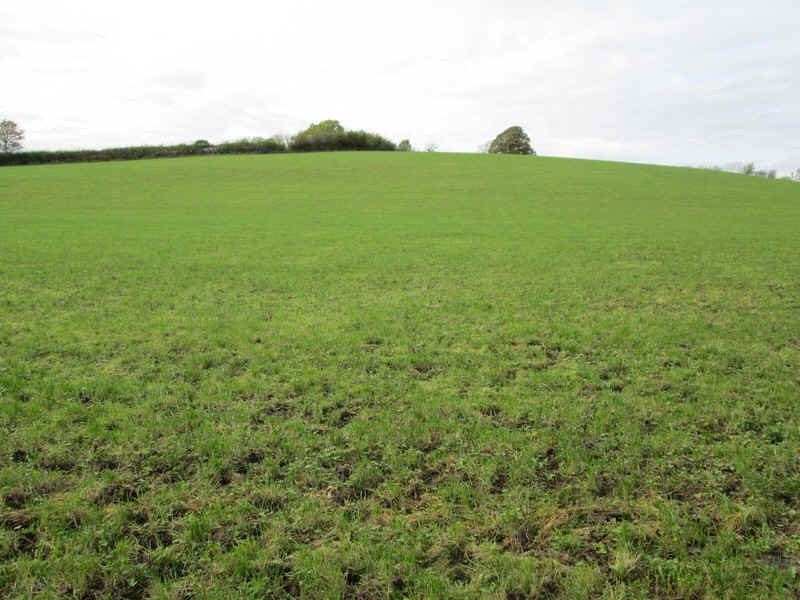 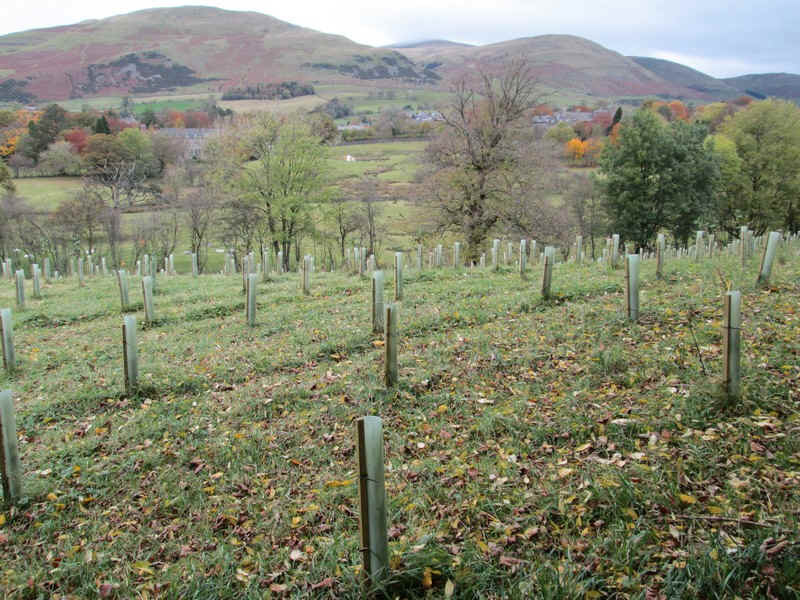 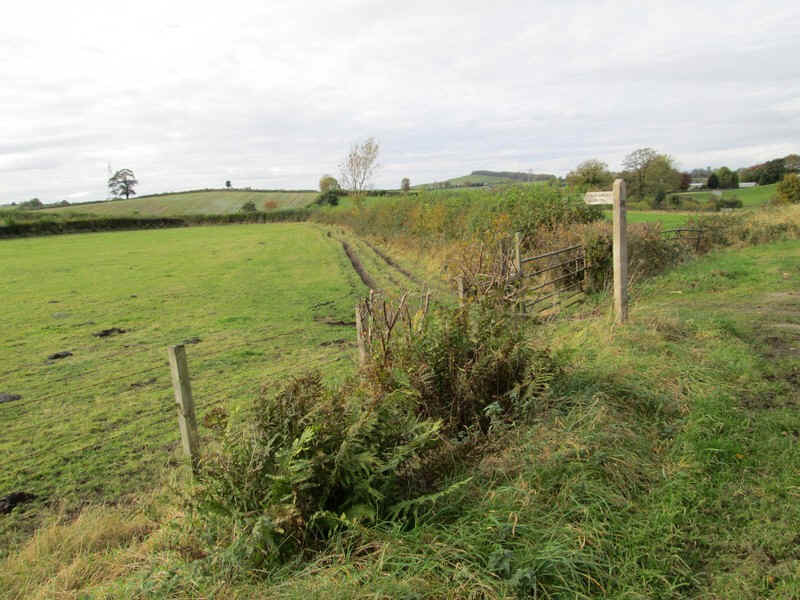 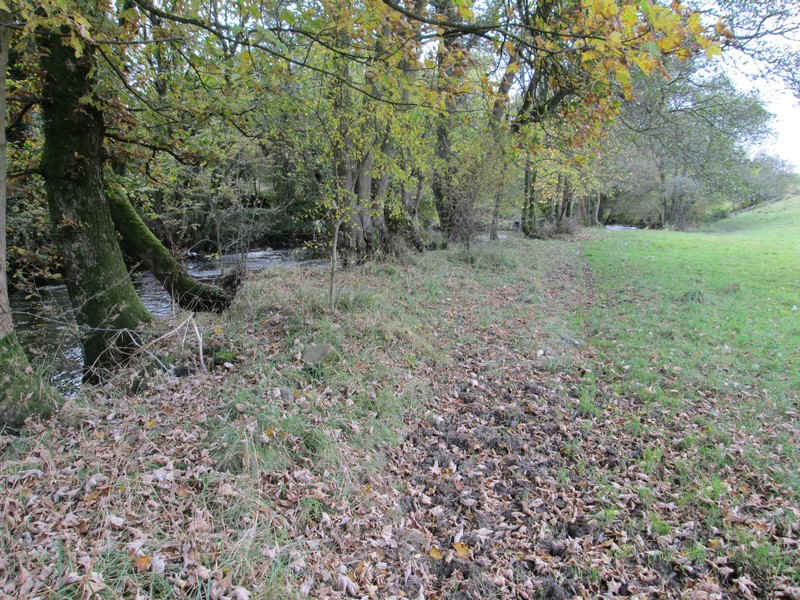 ....planting of a wood which stretches across a field - this is just a small part of it. 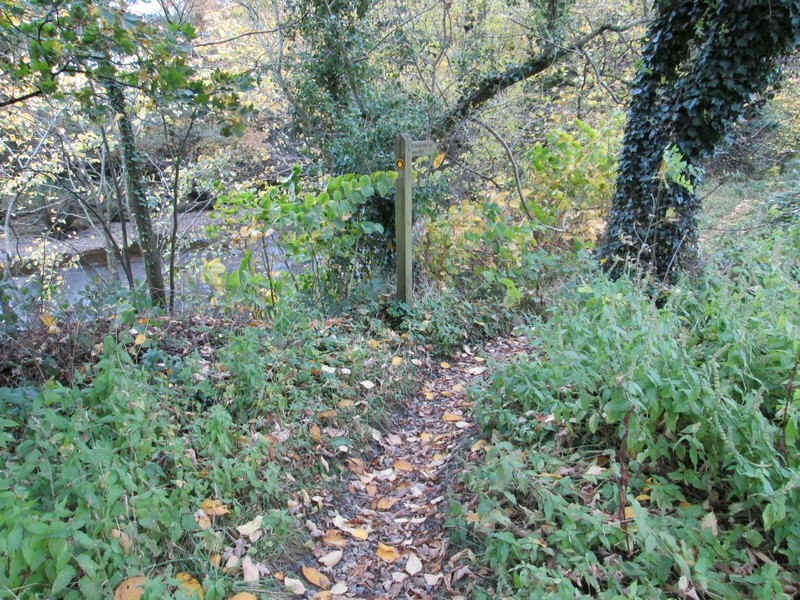 Beyond, the path falls down to the river..
.....to an old mill is followed. 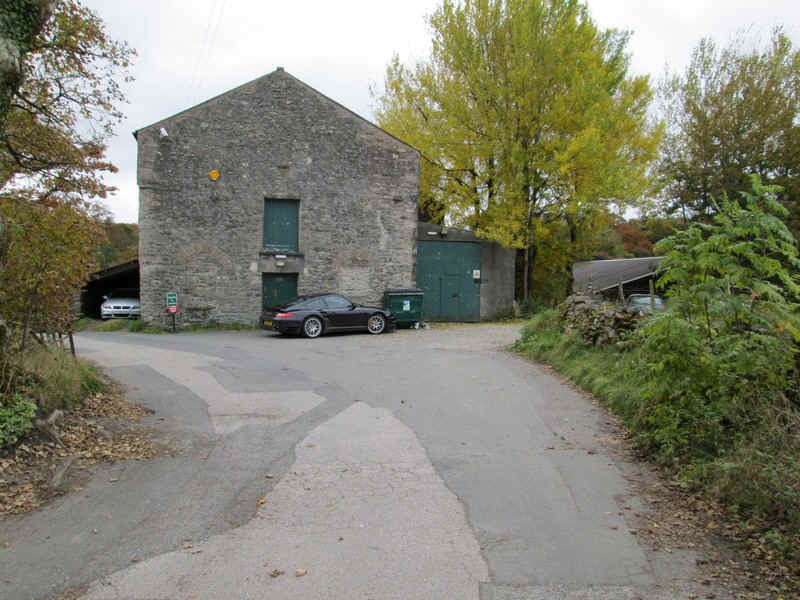 This is now used as a warehouse and I had to wait whilst several articulated lorries passed along the narrow lane. 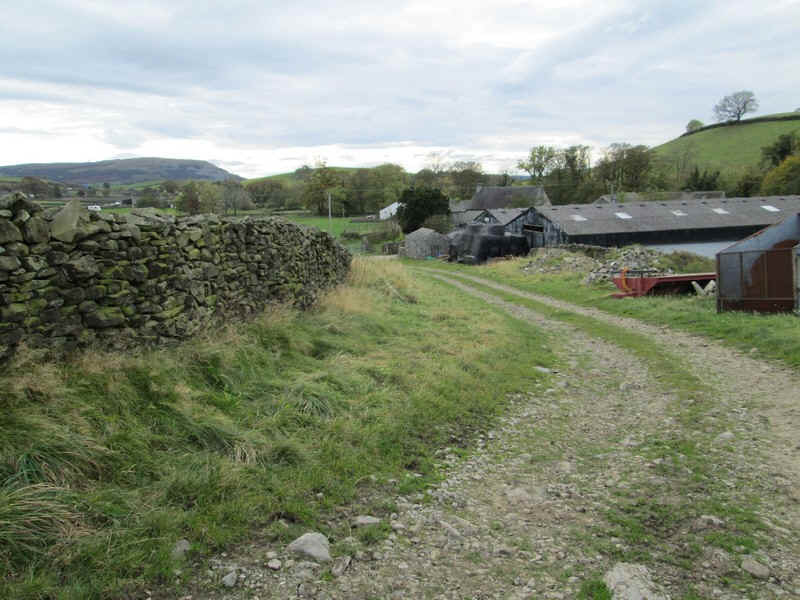 The Dales Way sign is hidden behind the warehouse..
.....then down the embankment of the old railway line. 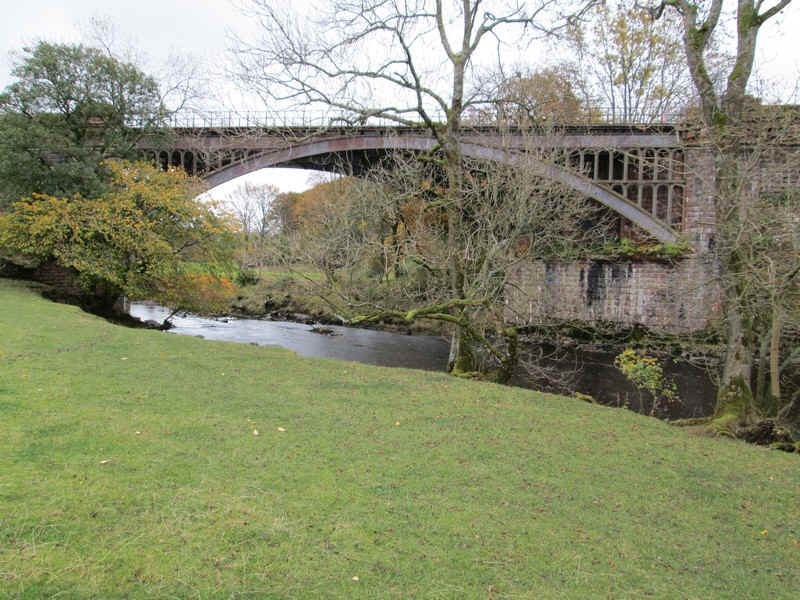 The iron railway bridge is still in place. 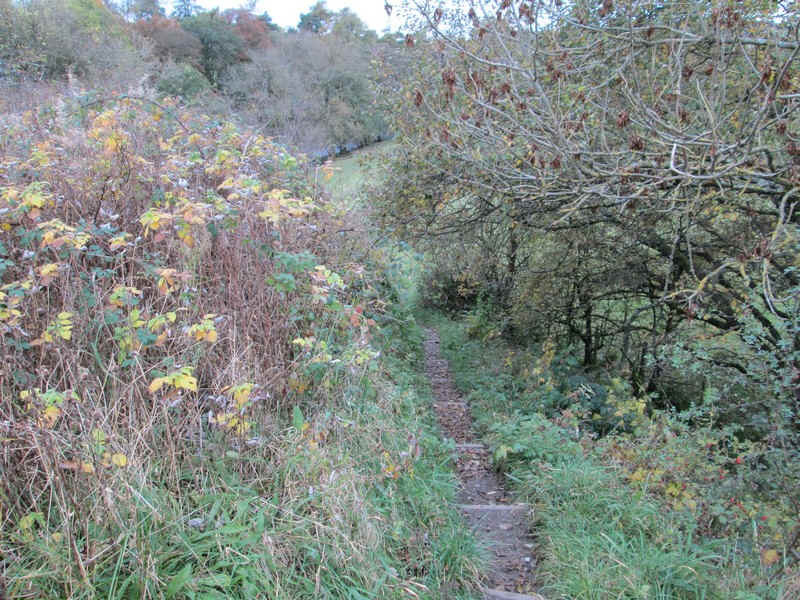 ...the path rises up near Brigflatts. 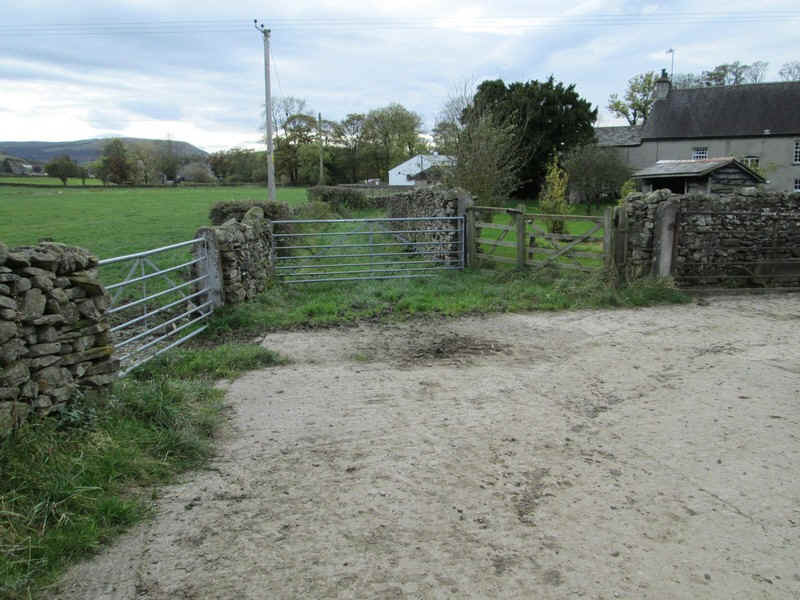 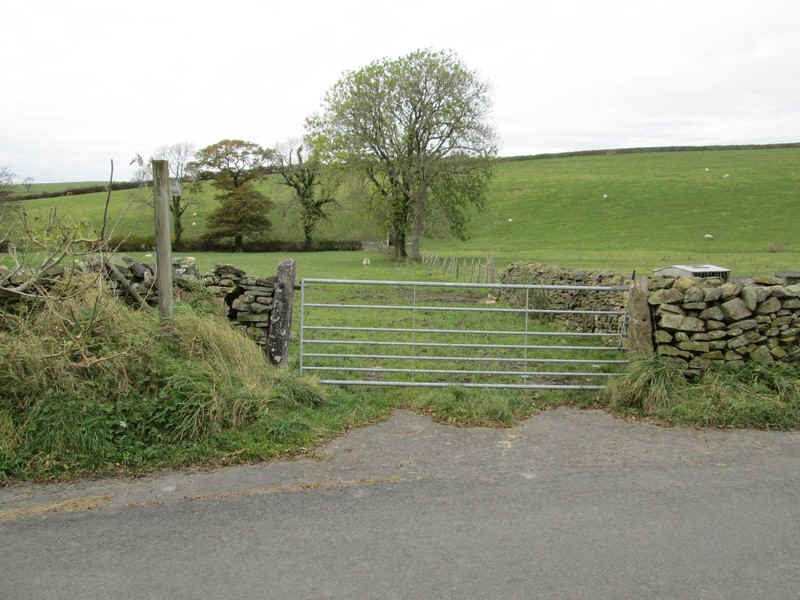 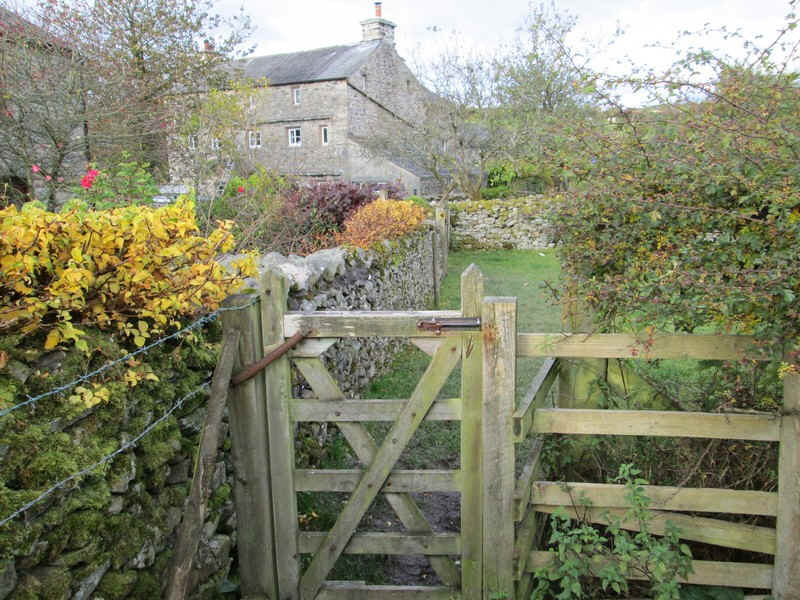 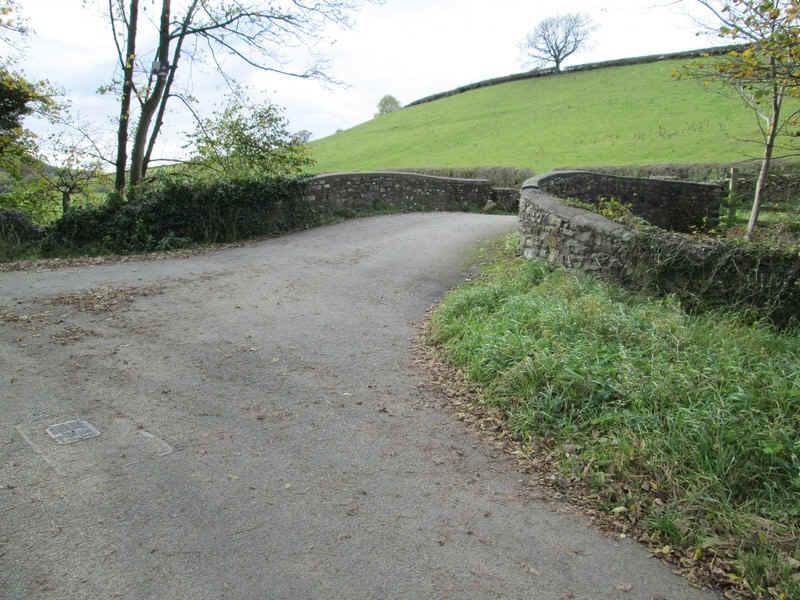 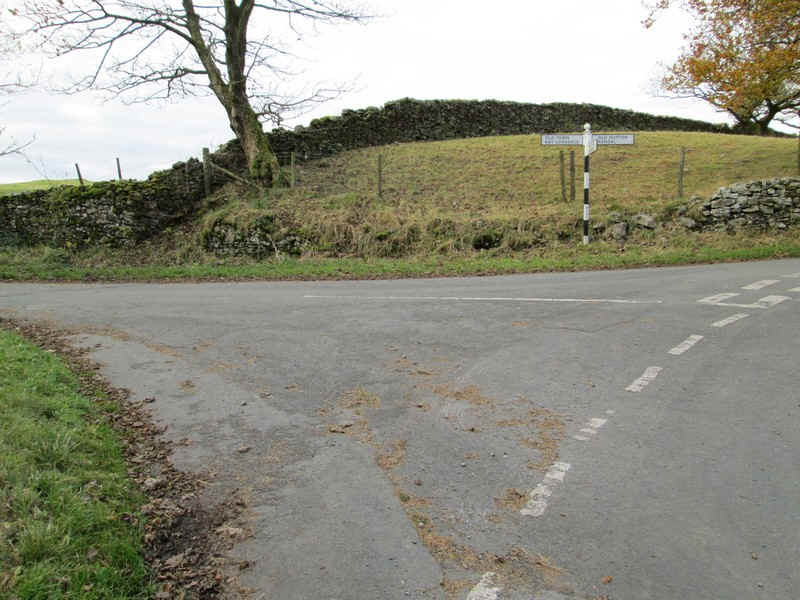 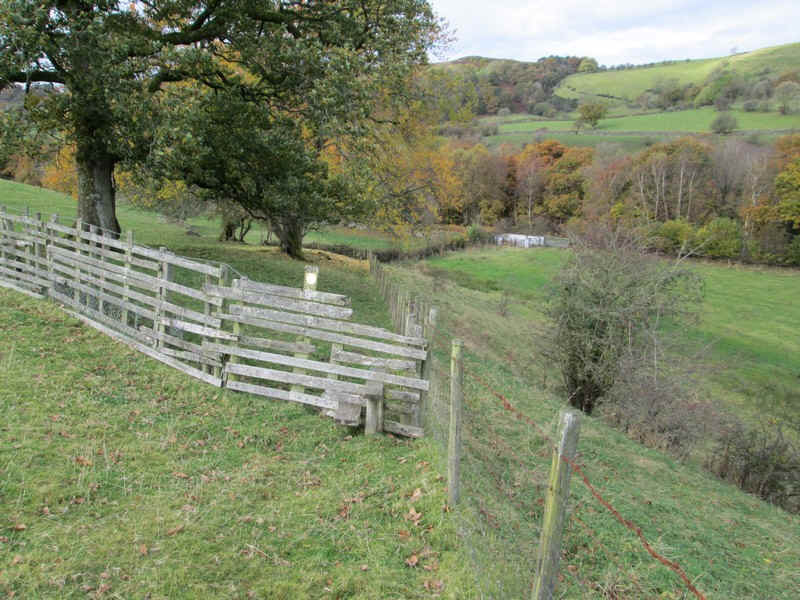 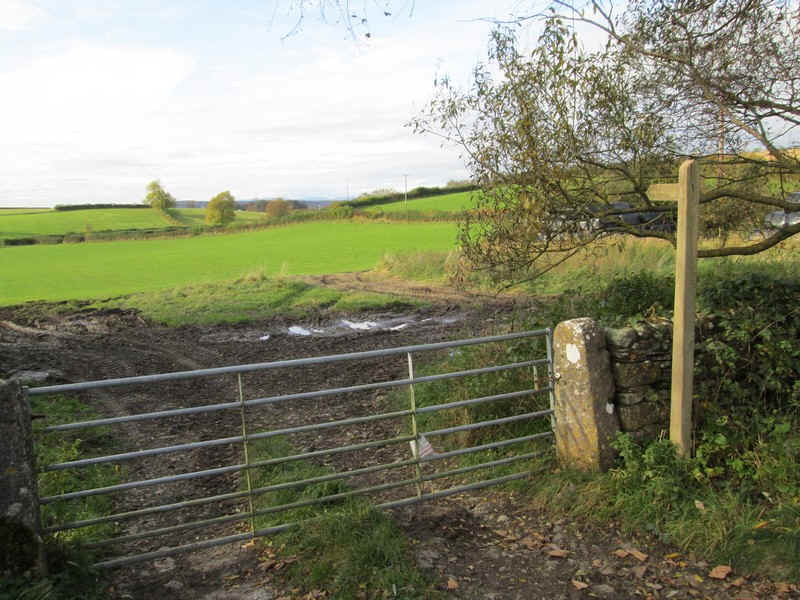 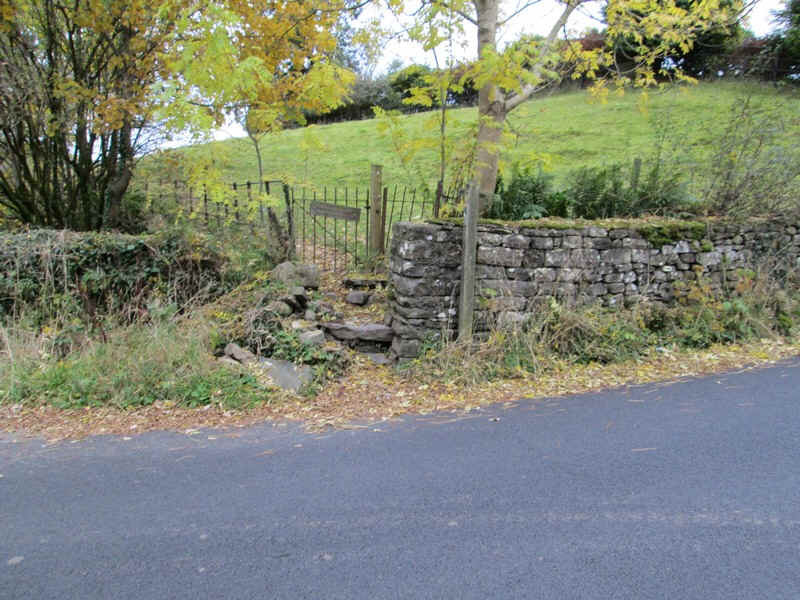 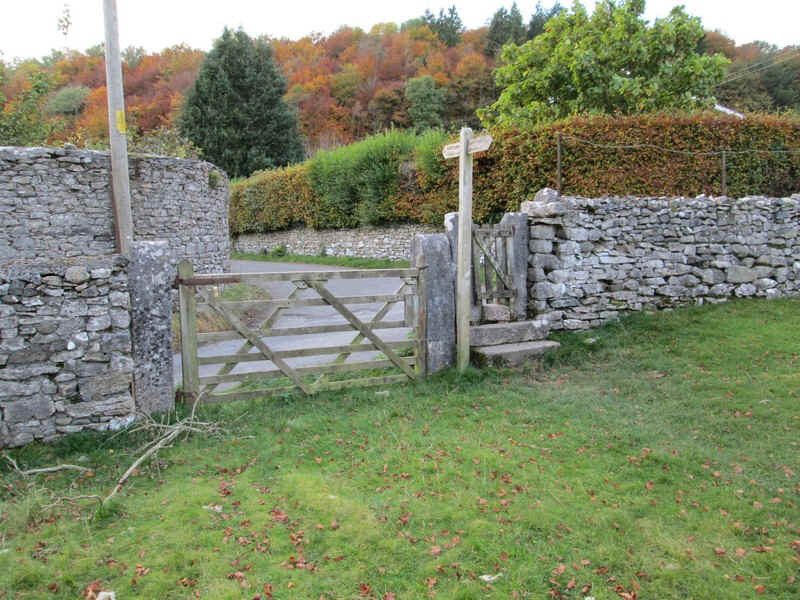 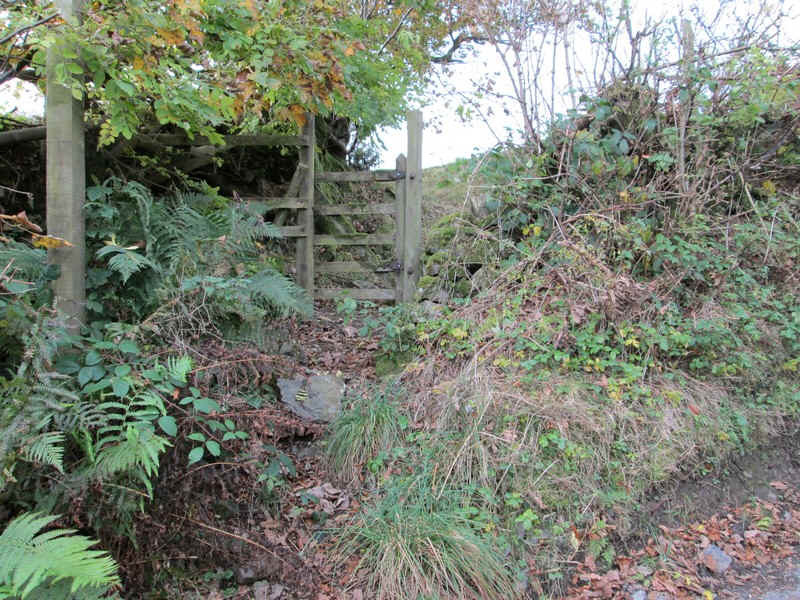 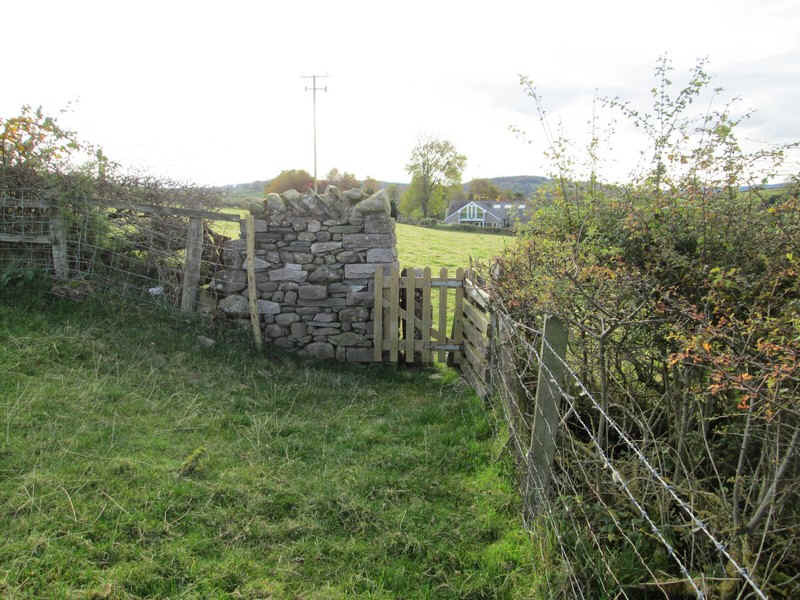 ...until this rather concealed stile is reached on a particularly winding section of the road - easy to miss. 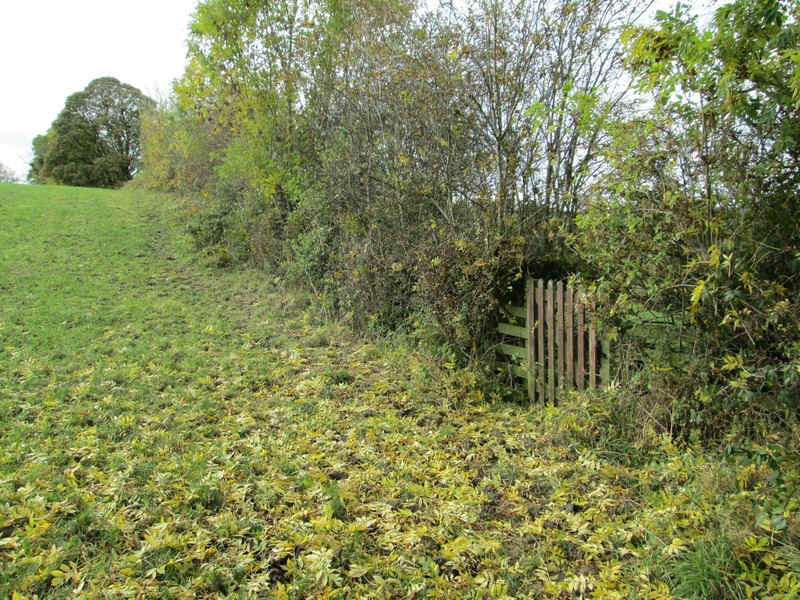 .....and then dropping down by a hedge to a gate at the bottom of the field. 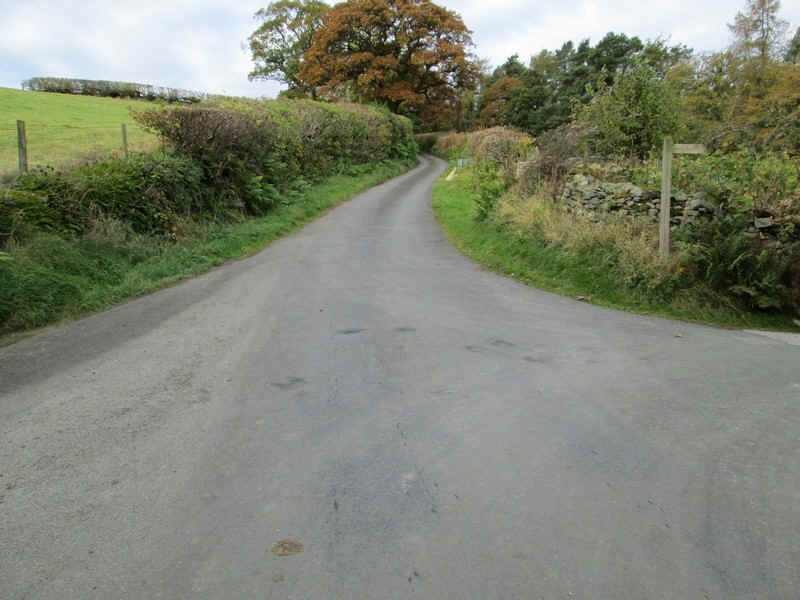 I succeeded in getting lost here as there's no clear way marking. 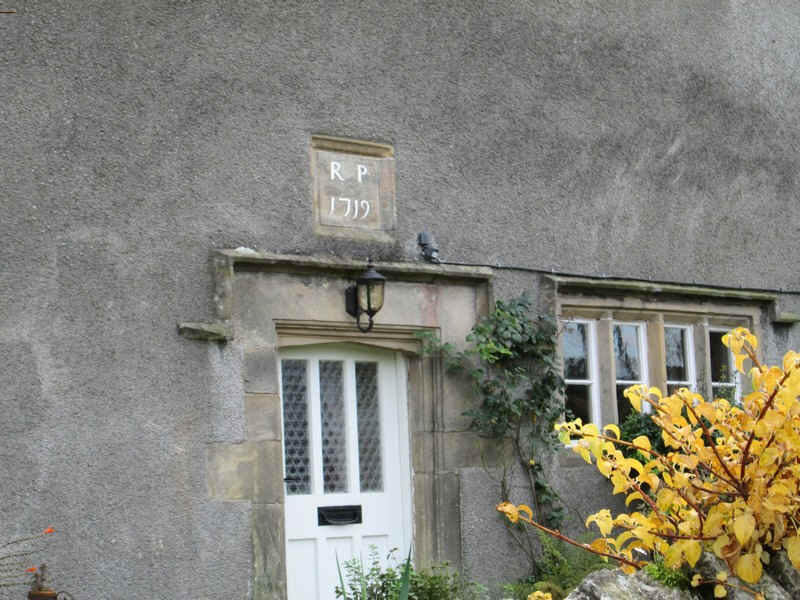 ...complete with one house built in 1706. 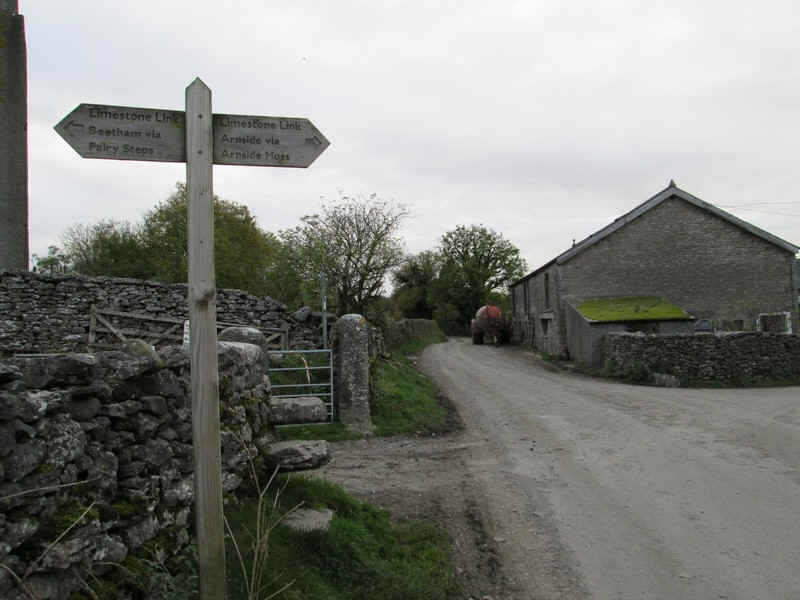 The Dales Way sign is followed through the hamlet..
....to a stile just up the hill where a signpost points to Killington New Bridge. 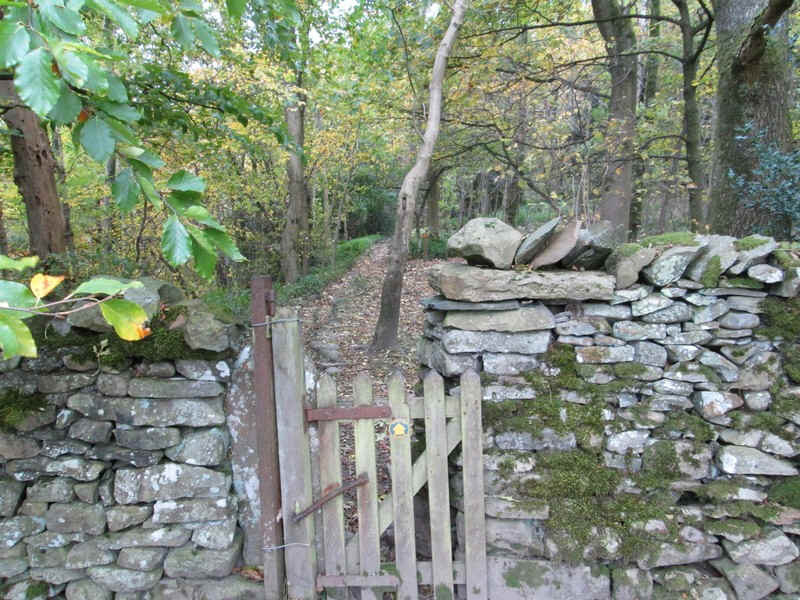 Now leaving the Dales Way my route headed across a succession of ladder stiles. 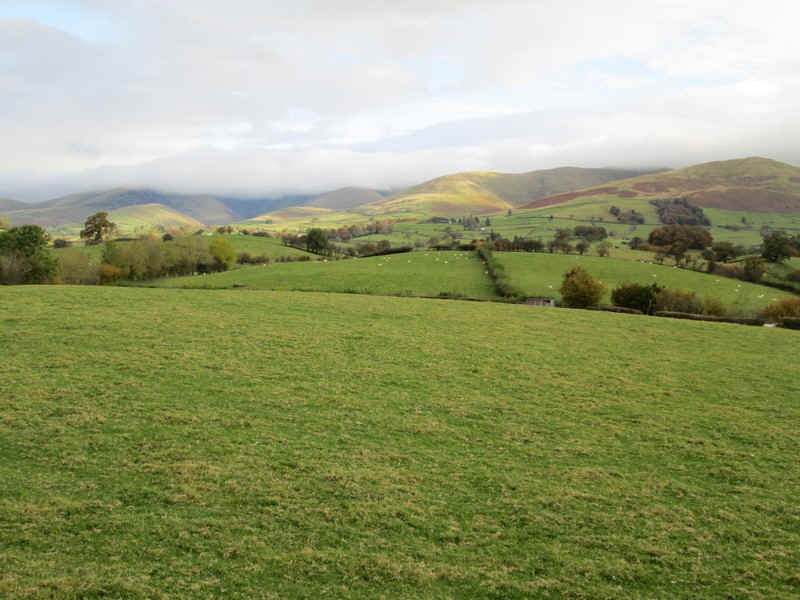 Looking back to the Howgill Fells above Sedbergh. 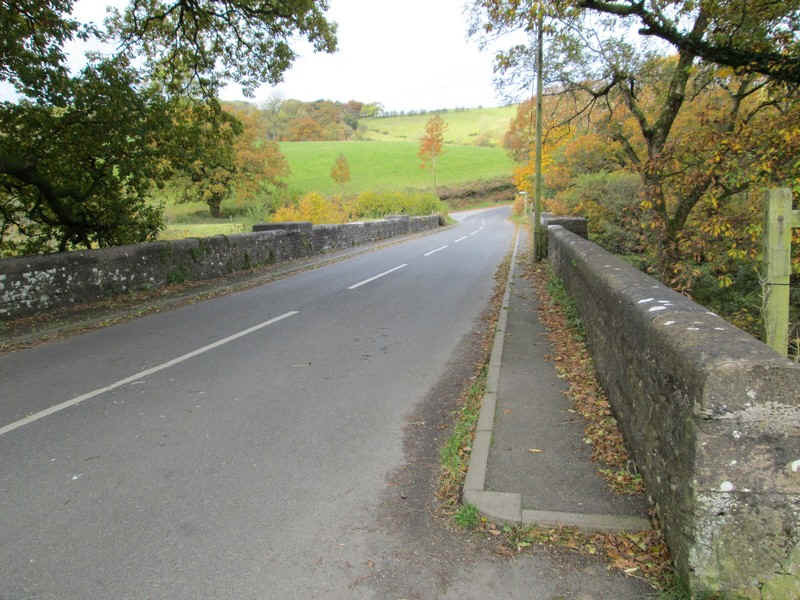 .....along to Killington New Bridge. 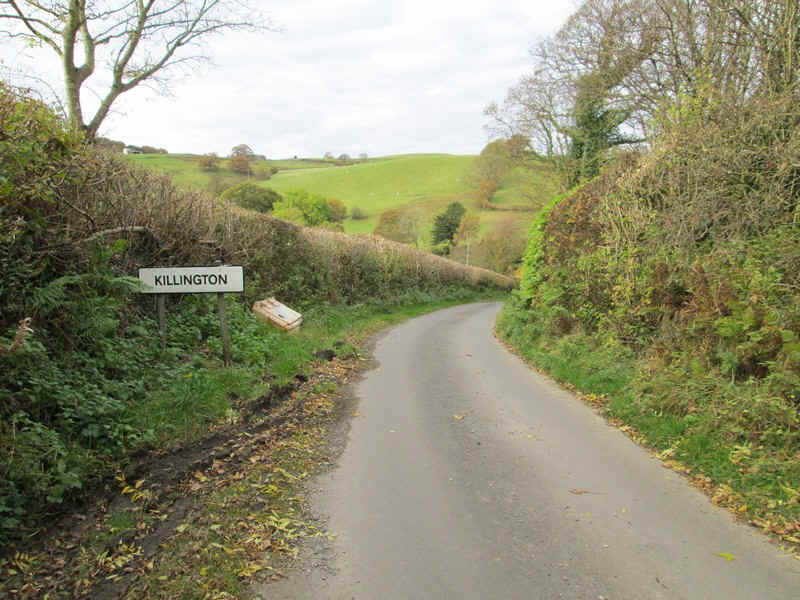 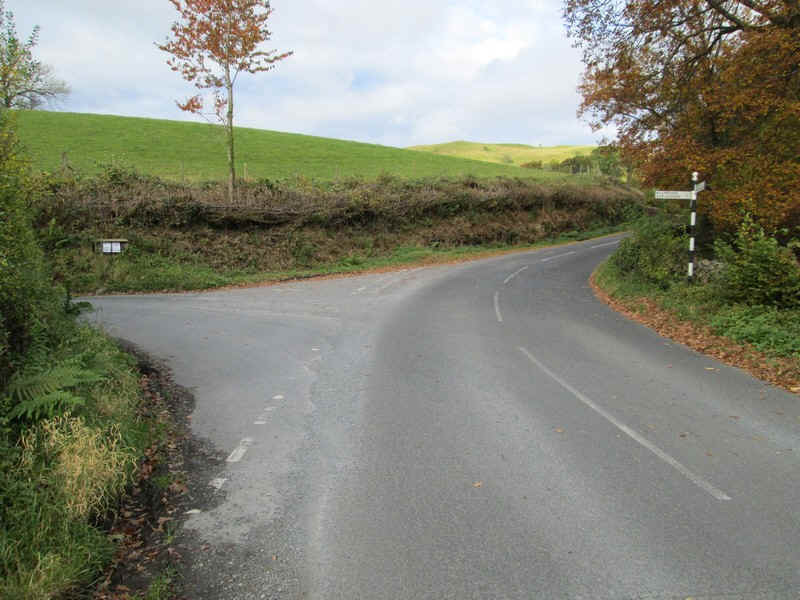 The junction sign points towards Killington..
....which is reached along a narrow lane..
Killington is another delightful hamlet but is particularly interesting because of the hall which includes the remains of a 15th century pele tower. 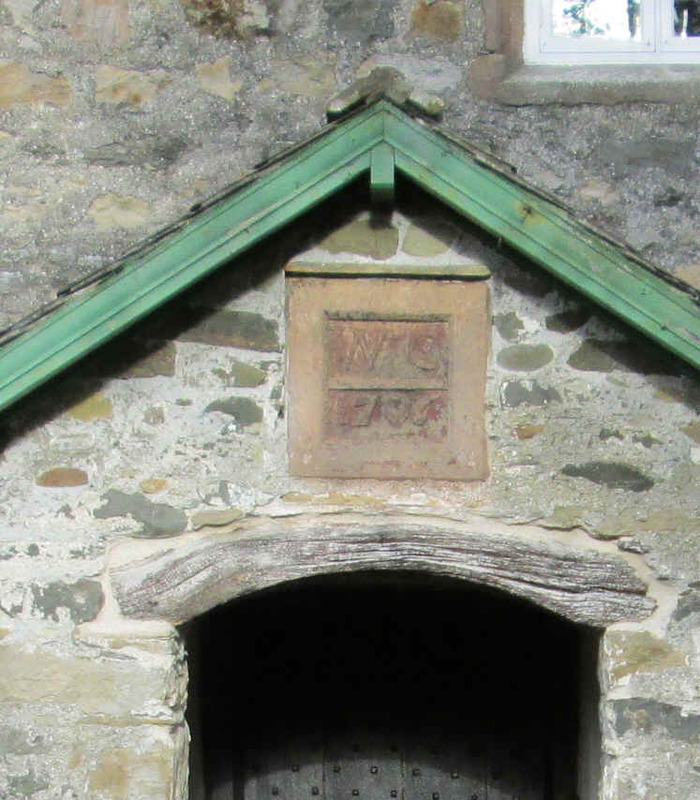 Unfortunately, the building was under renovation so I took no photos. 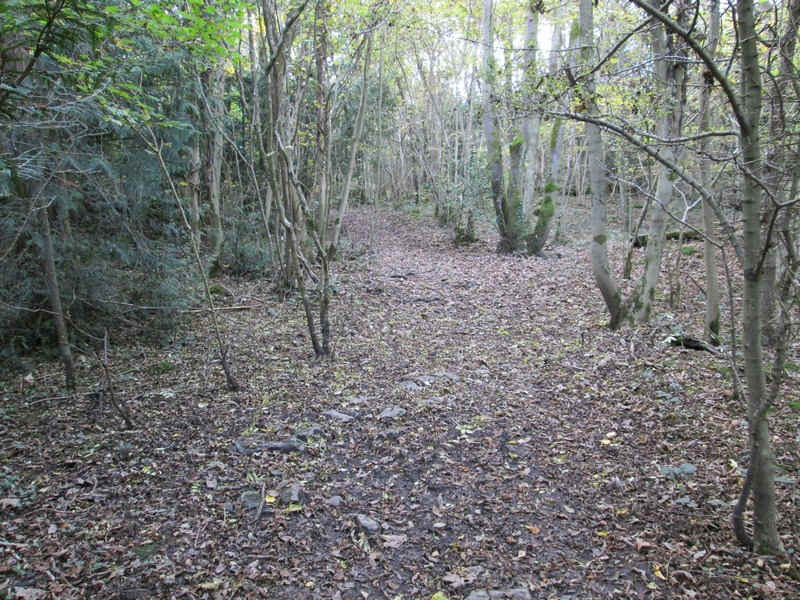 This link takes you to a web page about it. 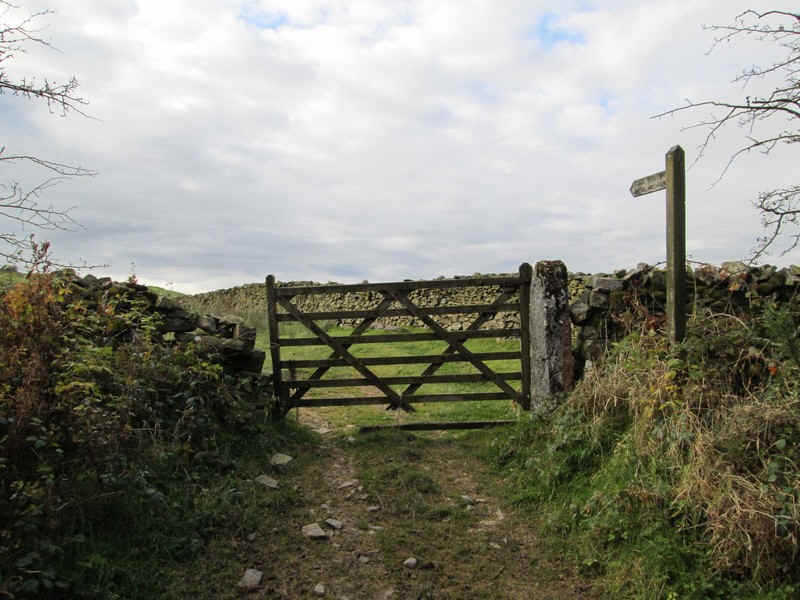 ....to reach a stile signposted to Aikrigg. 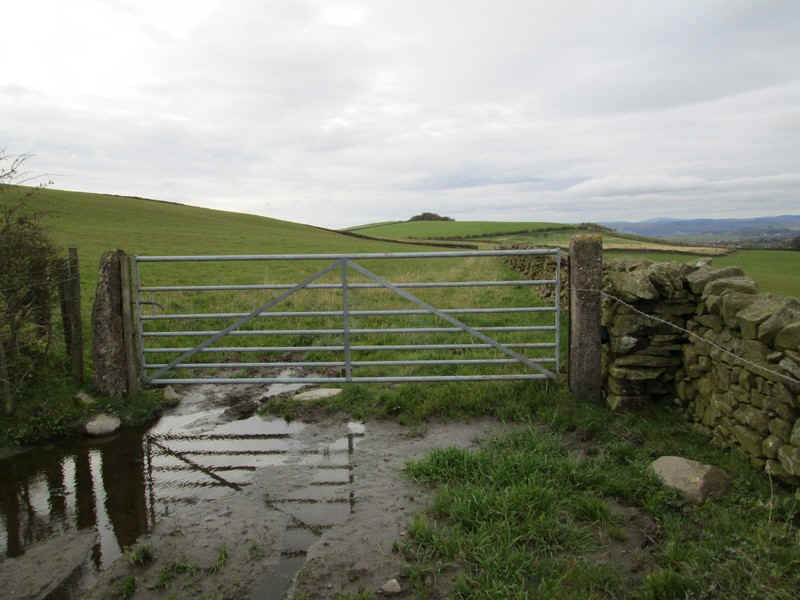 .....before Aikrigg farm becomes visible across the fields. 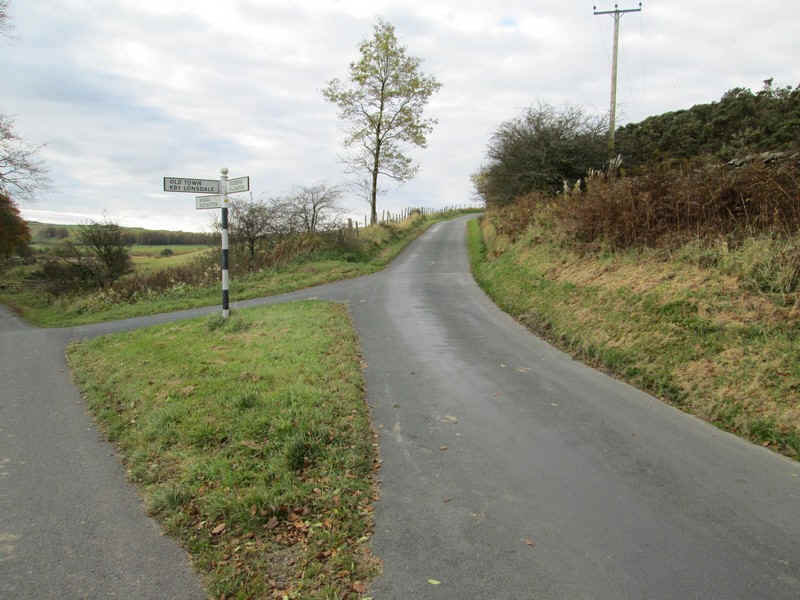 .....towards the junction with another road at Three Mile House. 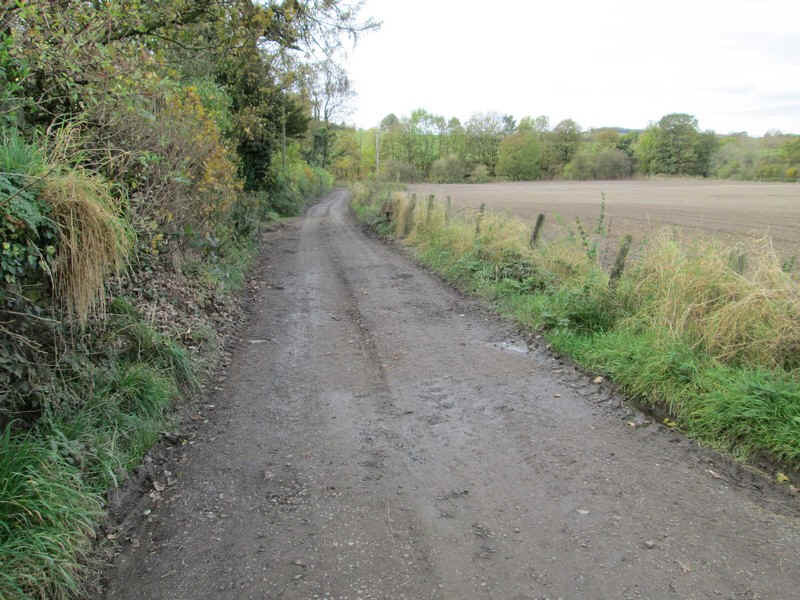 Here the 'Old Scotch Road' is joined. 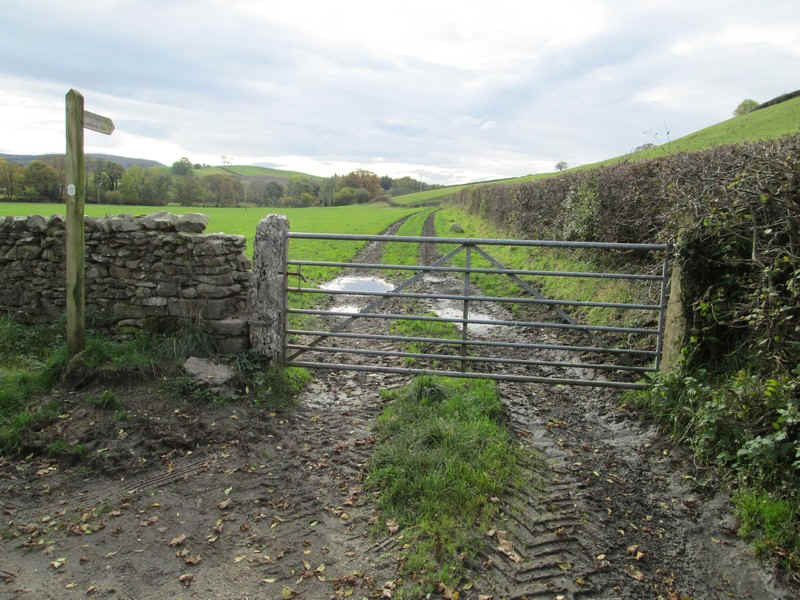 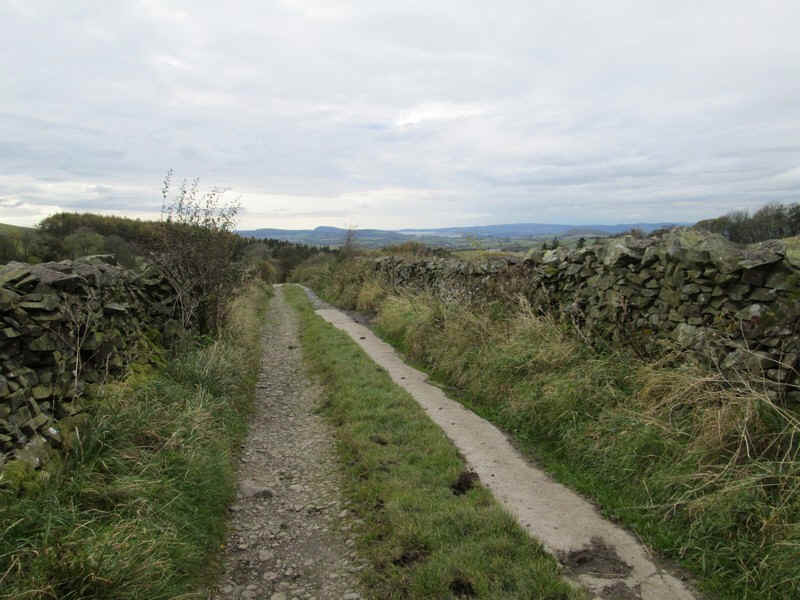 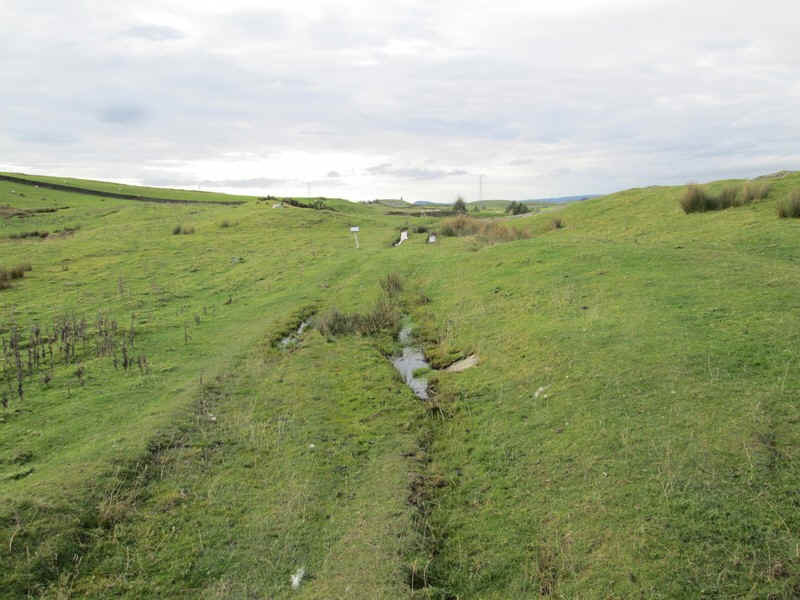 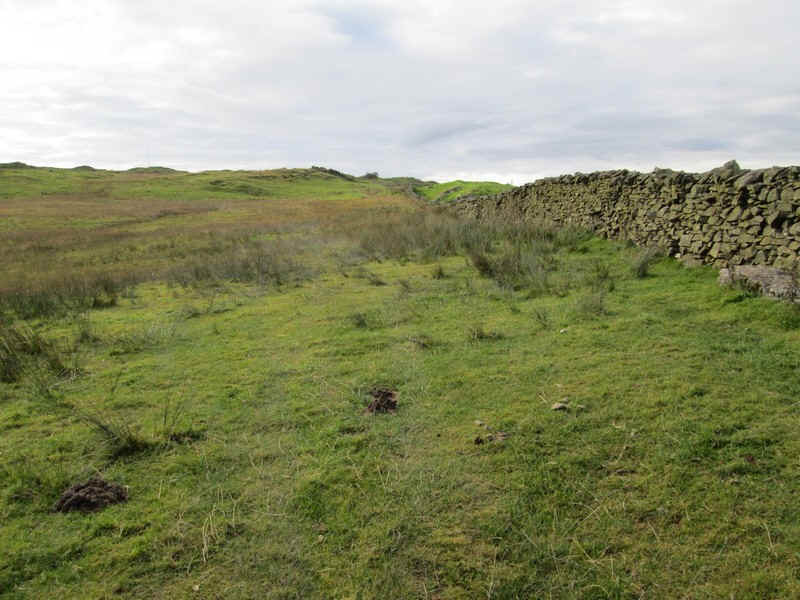 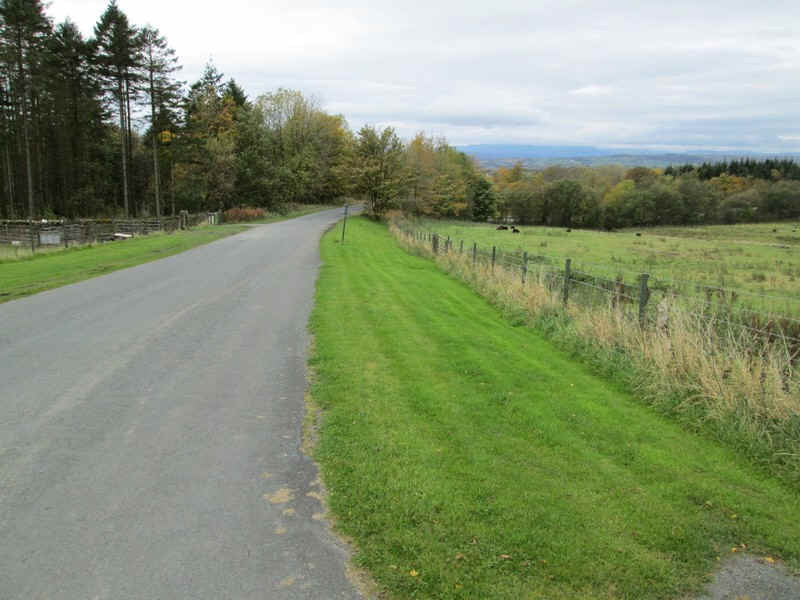 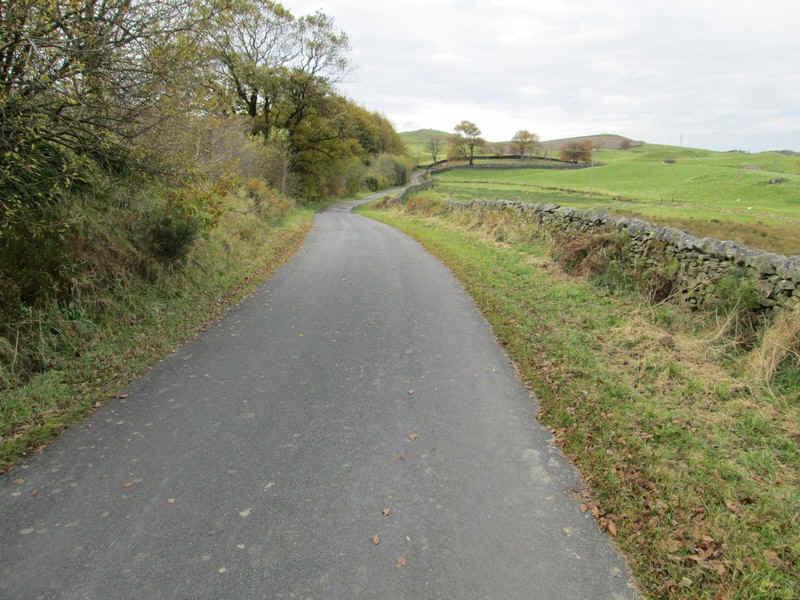 This was an old cattle drovers' road from Kirkby Lonsdale to Tebay. 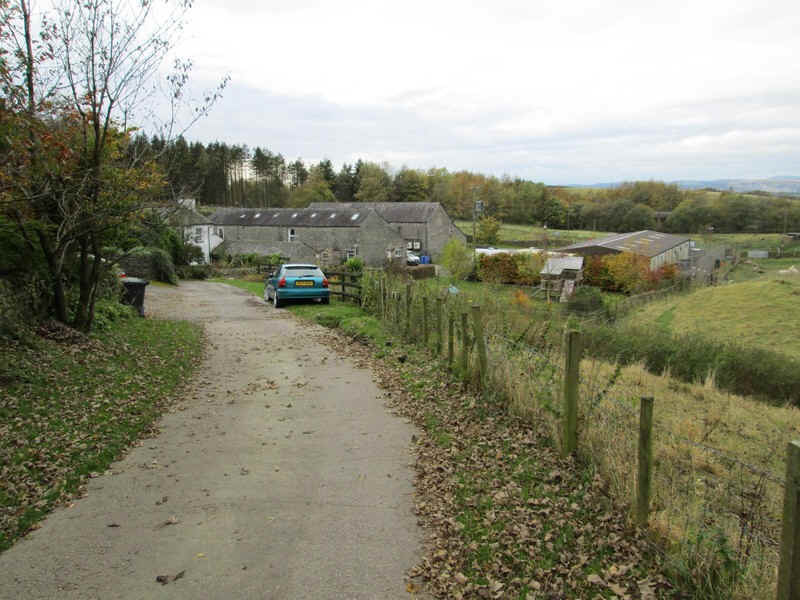 See the link below for further details. 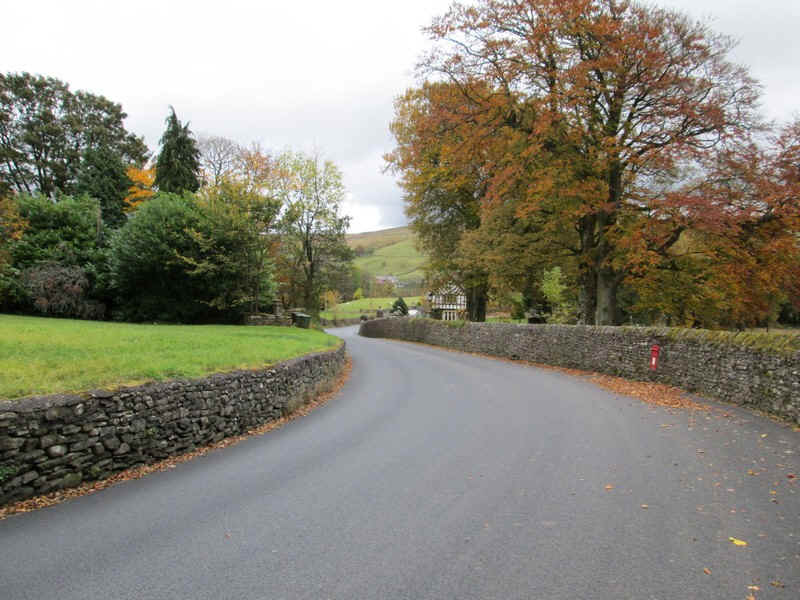 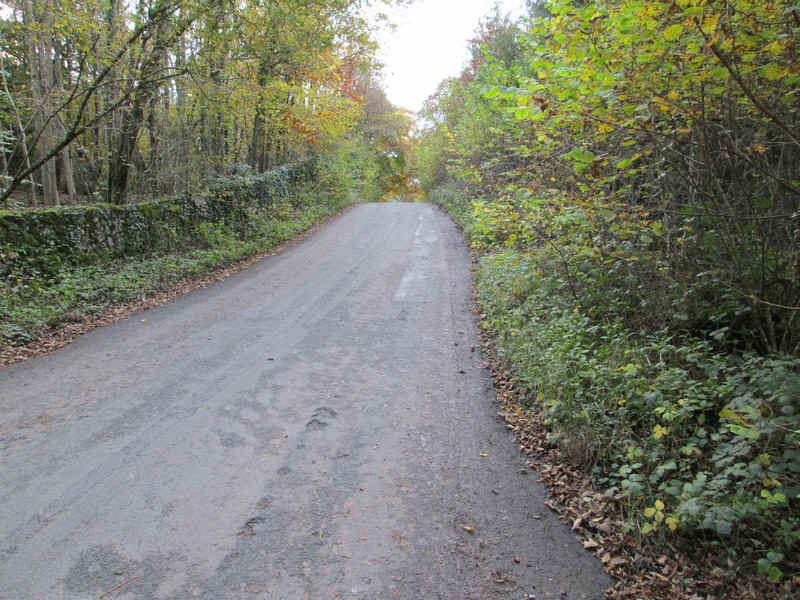 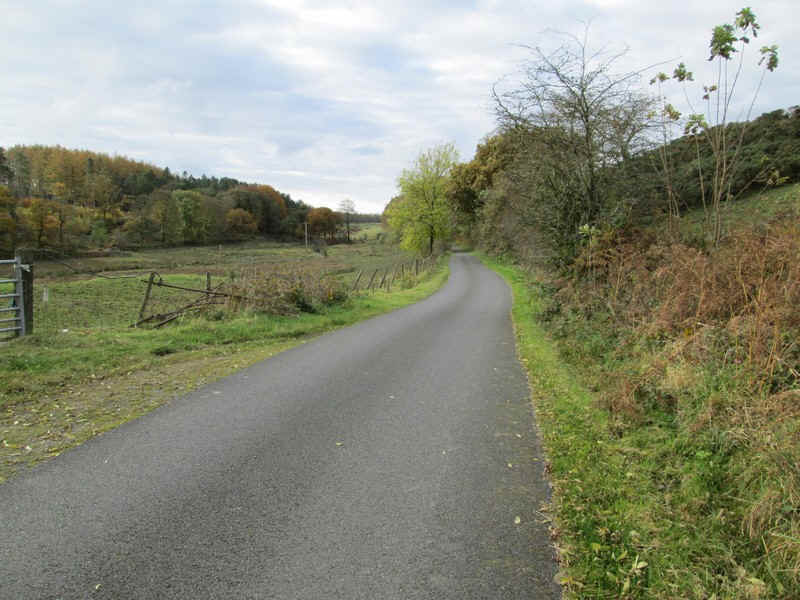 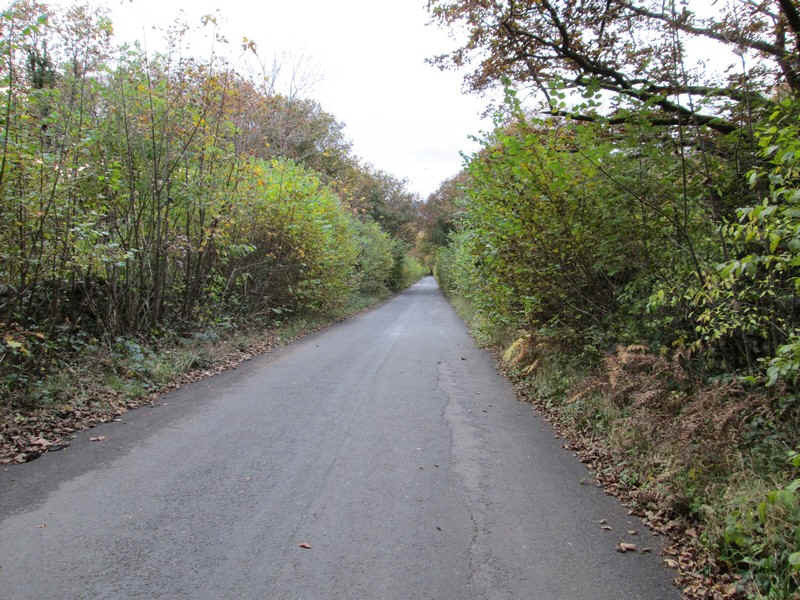 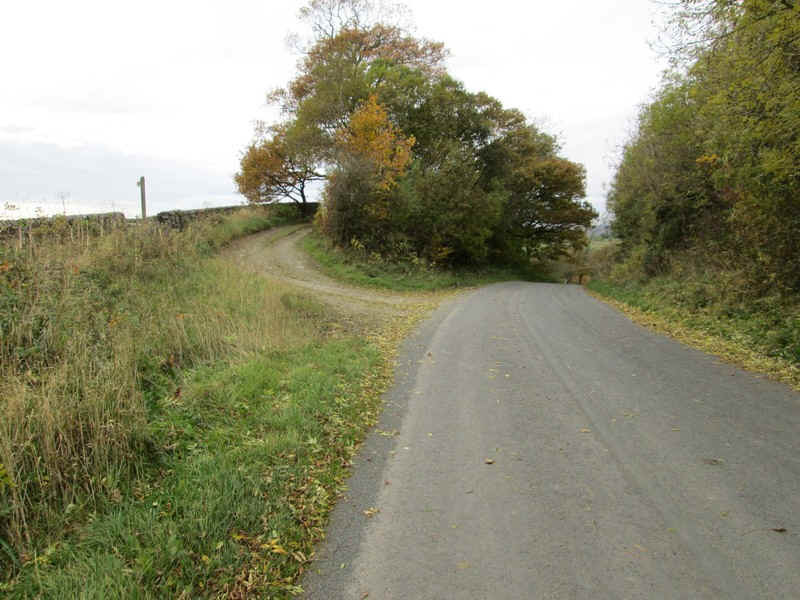 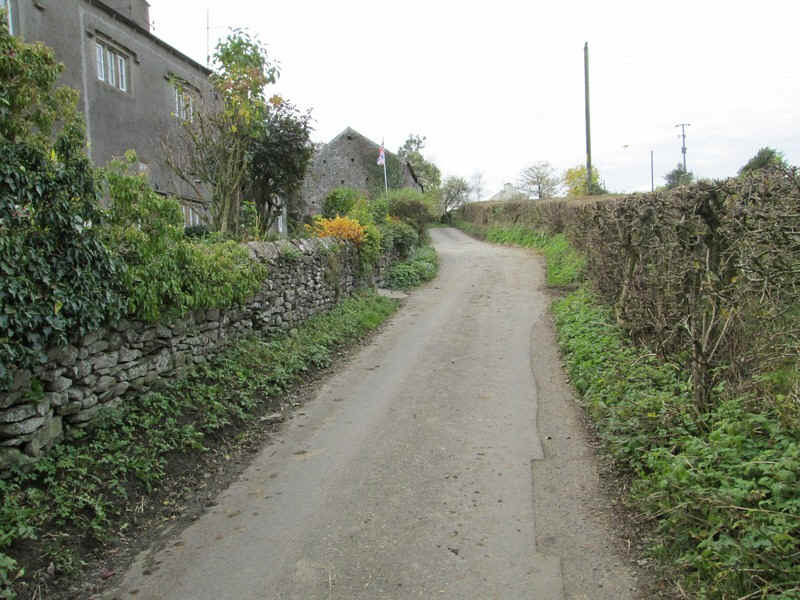 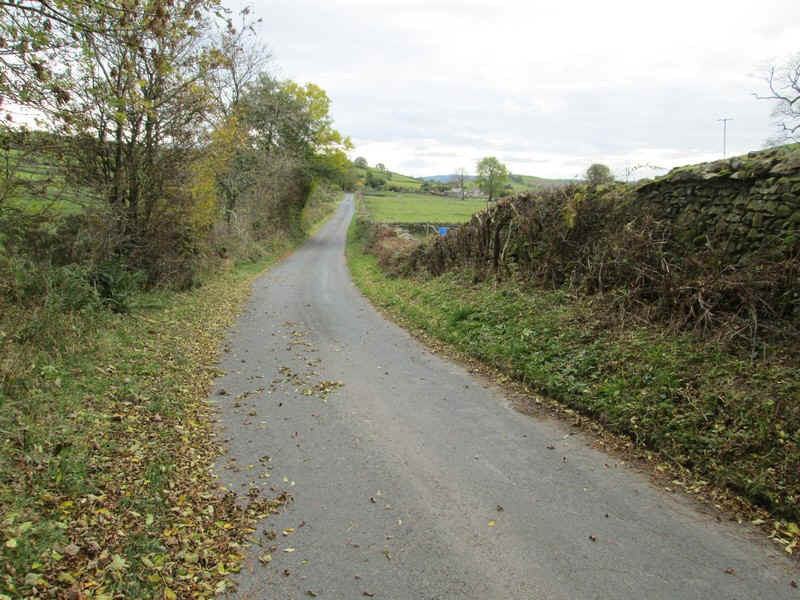 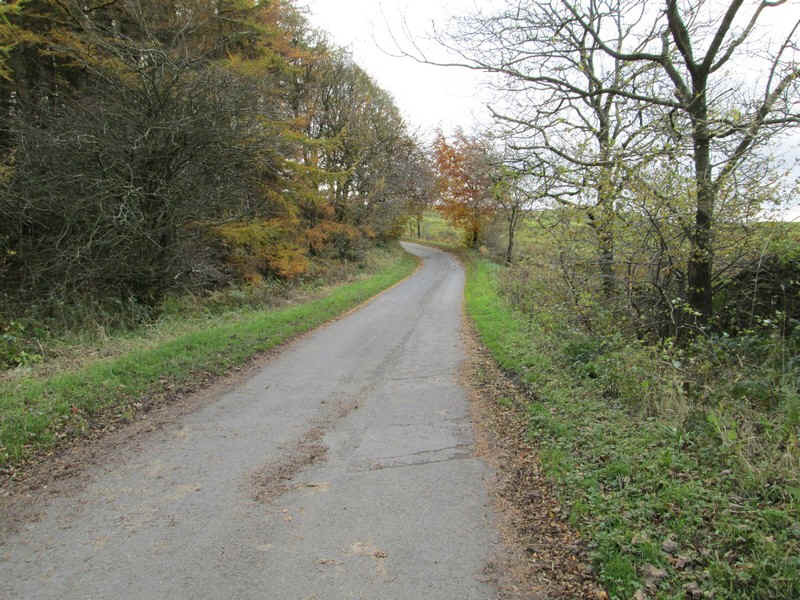 This lane was followed for a short distance before branching uphill on the road to Old Hutton and Kendal. 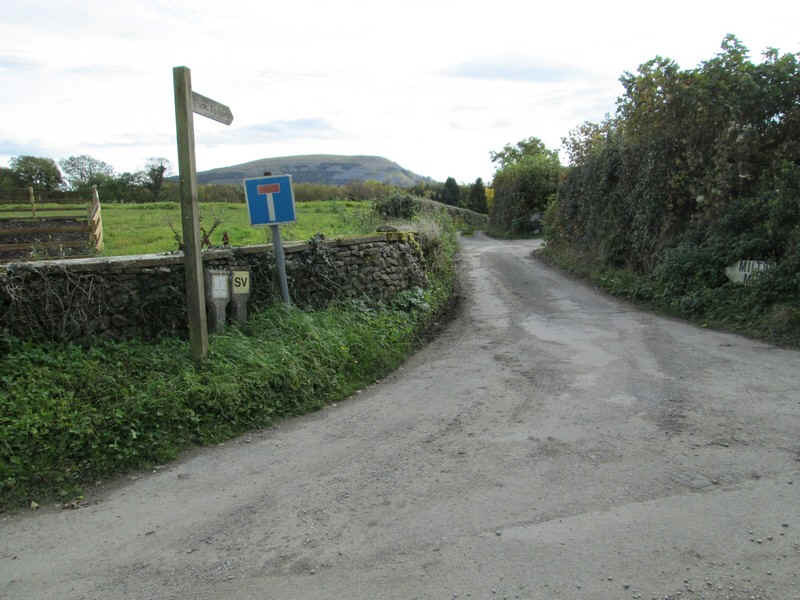 Beware: the signpost is a little confusing as it is set up in a way where the finger posts don't actually point along the roads! 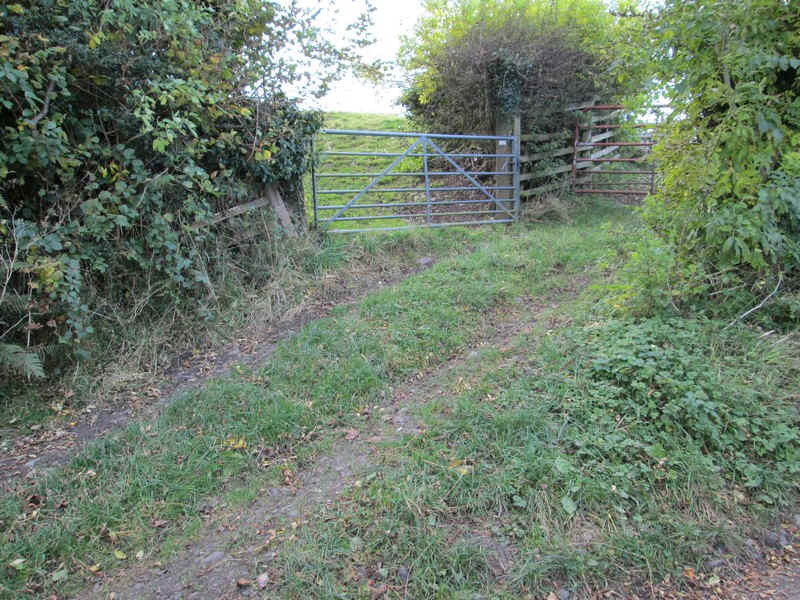 The lane continues to another junction where..
.....to reach a stile marked Crosslands. 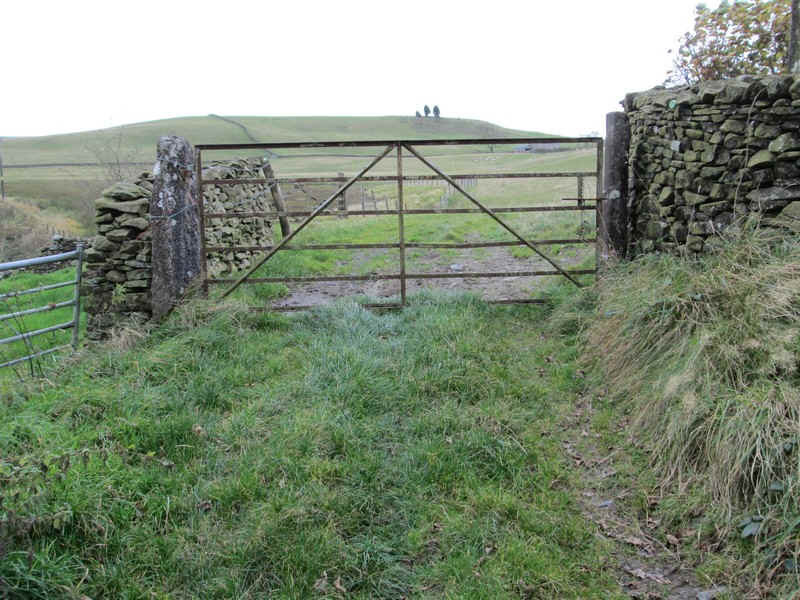 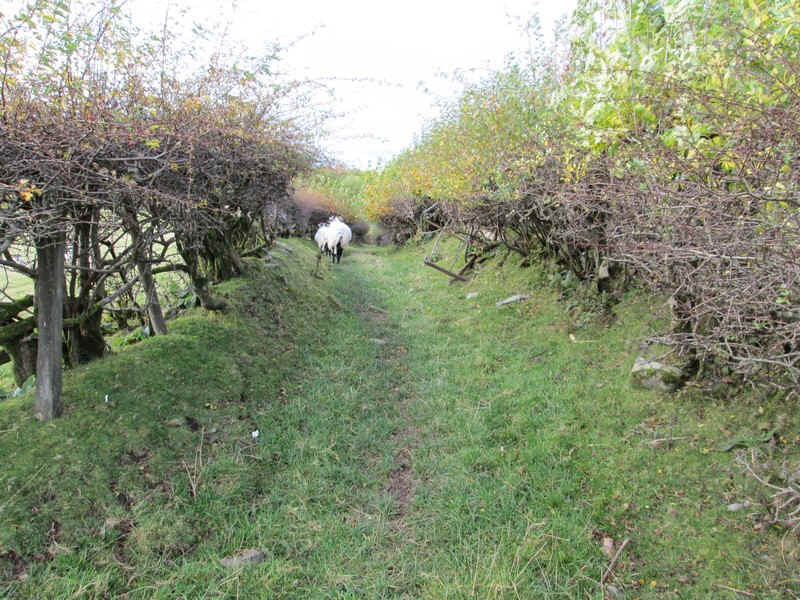 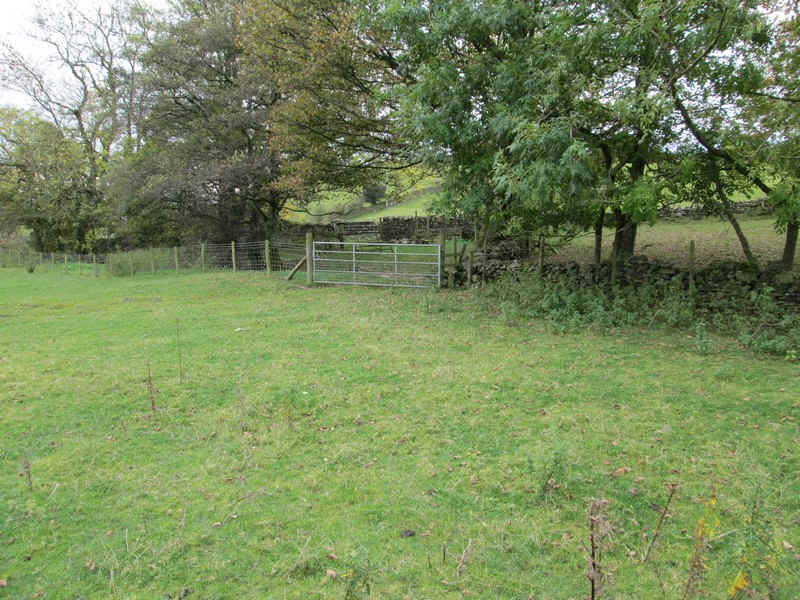 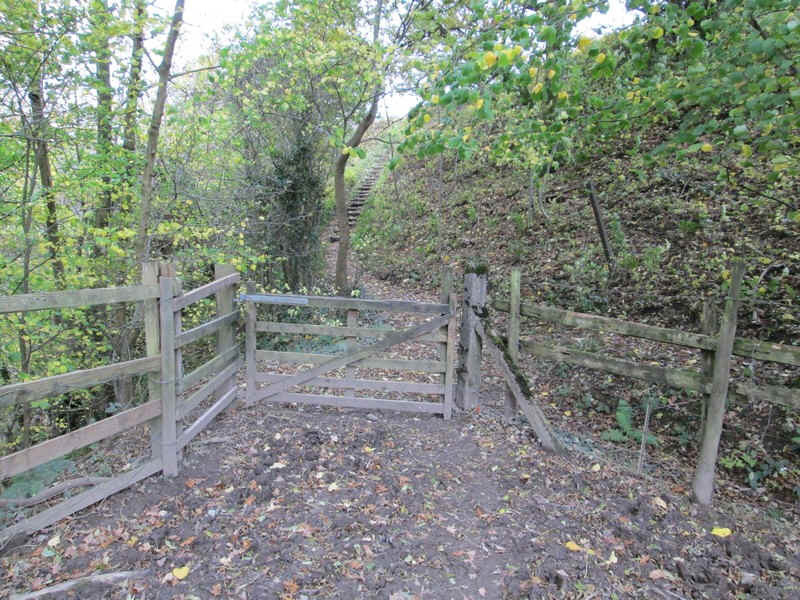 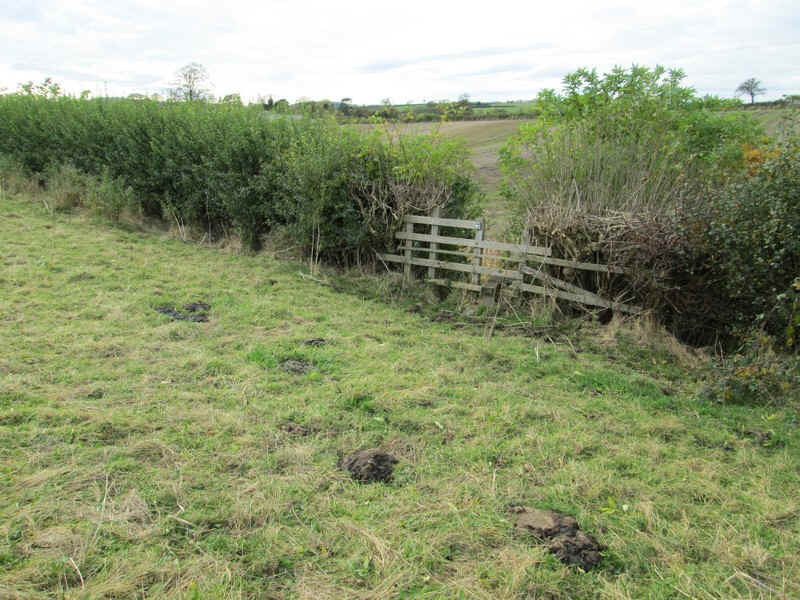 The bridleway goes across rough grazing..
.....until it reaches a wall and overgrown gate. 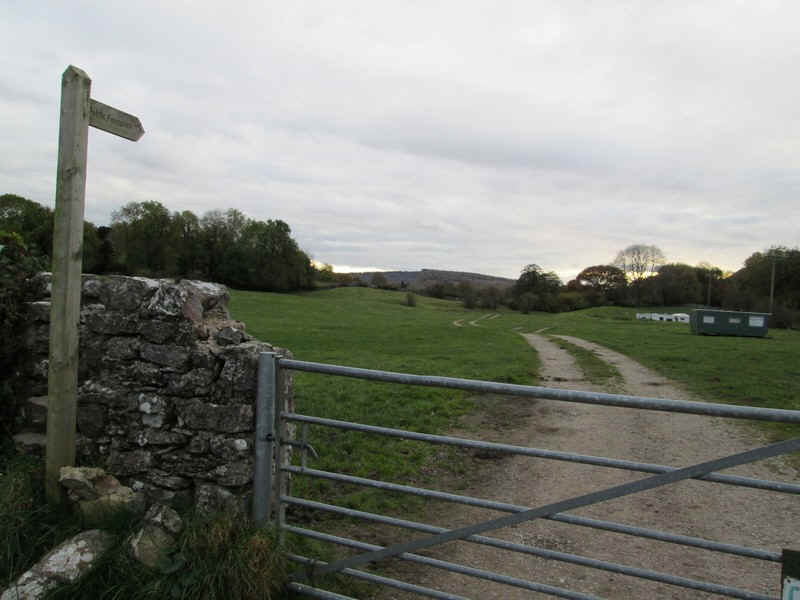 Beyond the 21st century intrudes as these signposts were the first warning I had of the new Armistead wind turbines. 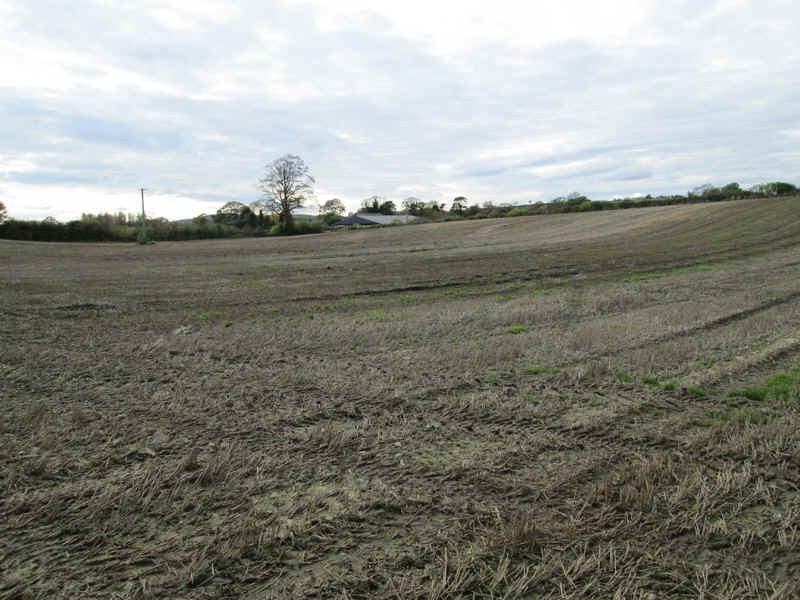 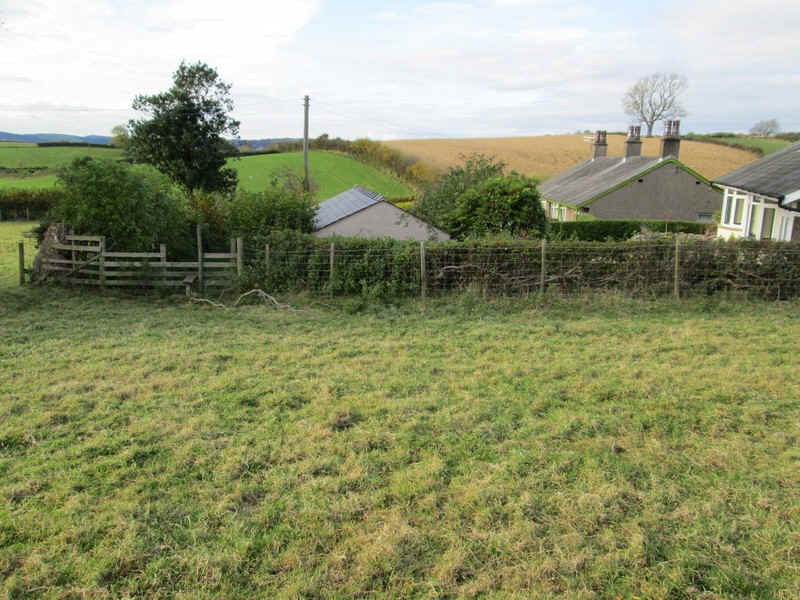 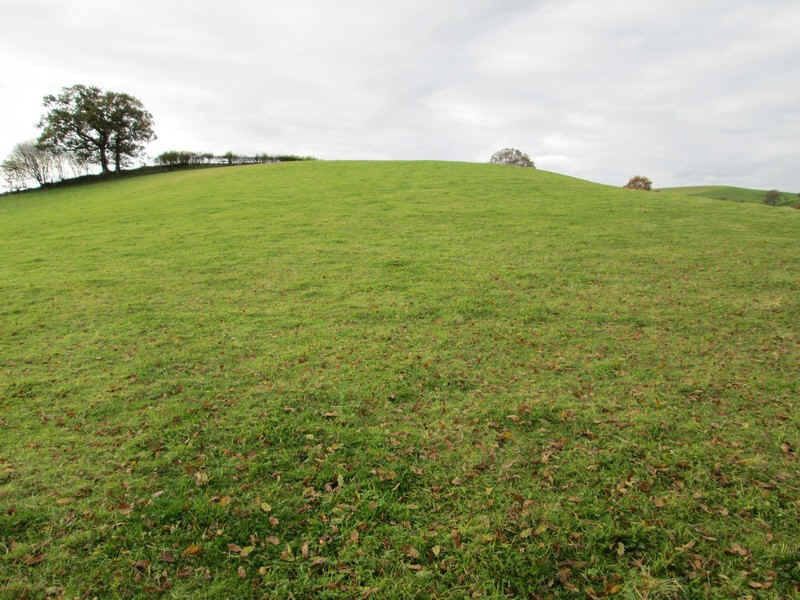 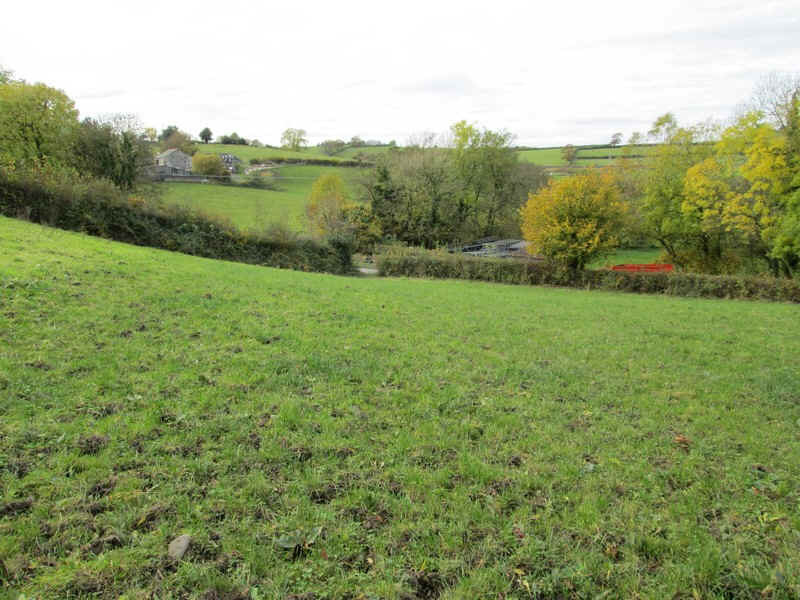 There will shortly be six 120m high turbines here. 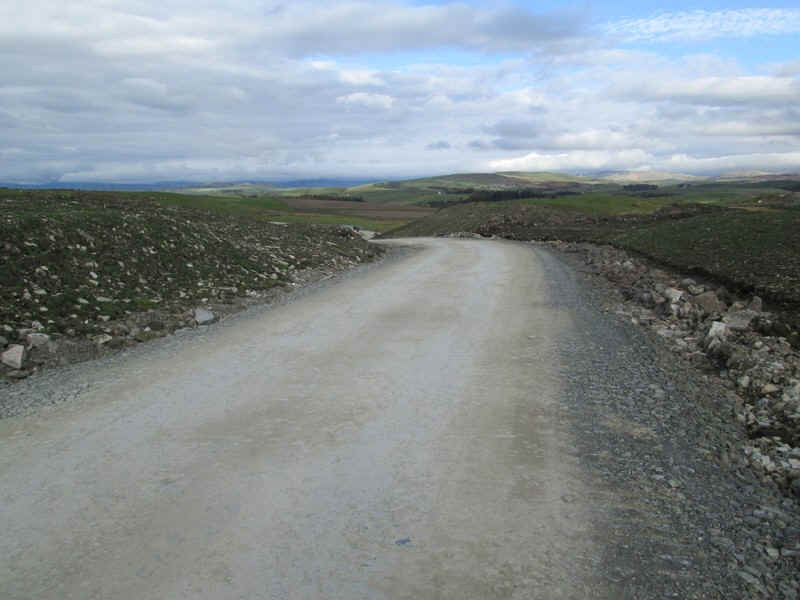 Work on construction was well advanced with access roads, bridges and deep excavations under way. 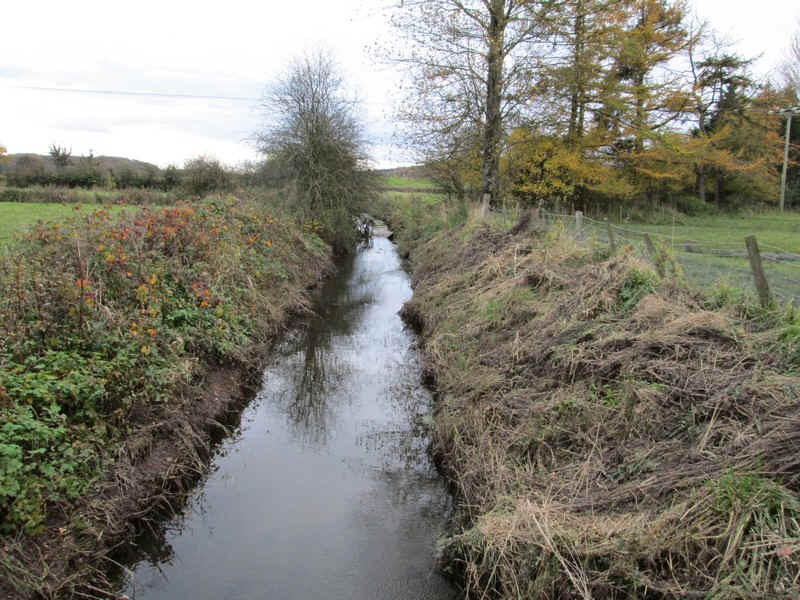 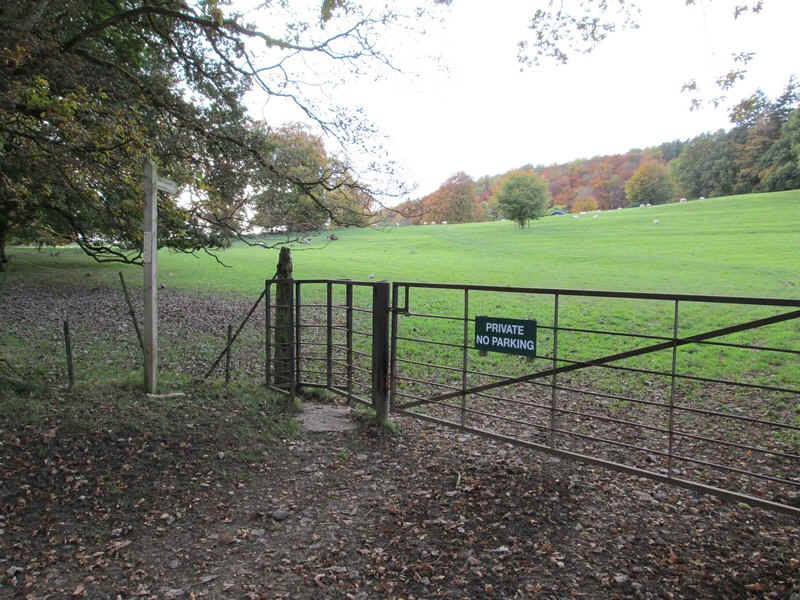 Another part of rural England to be blighted! 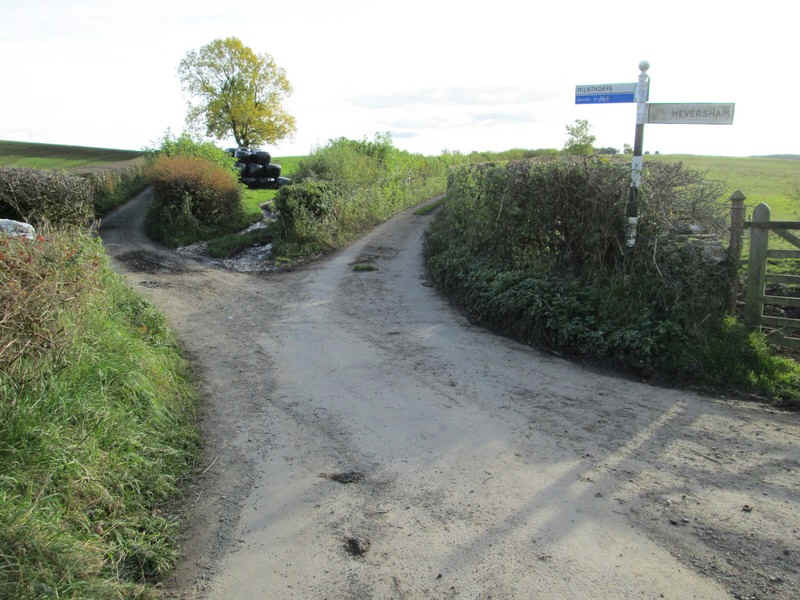 ...which leads to Crosslands Farm. 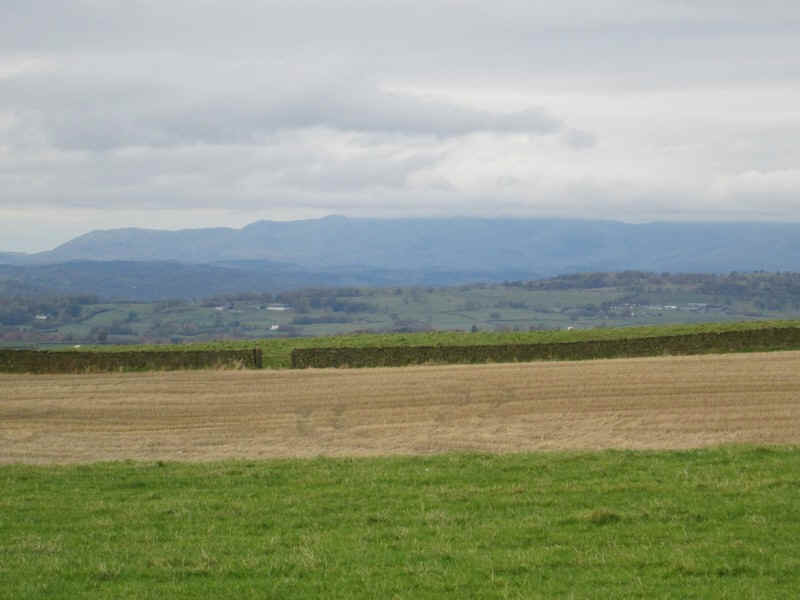 ....with the first views of the lake District fells coming into sight. 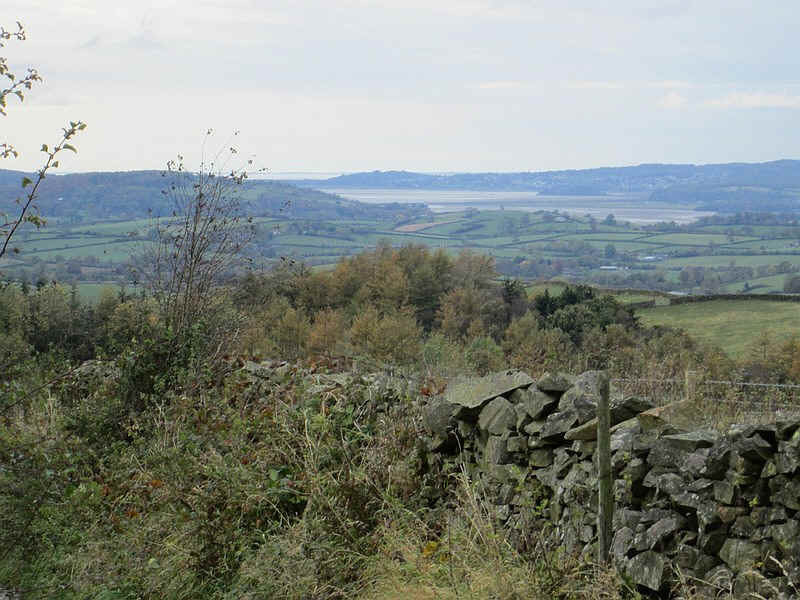 ...with the excitement of the first sighting of Morecambe Bay and the West Coast. 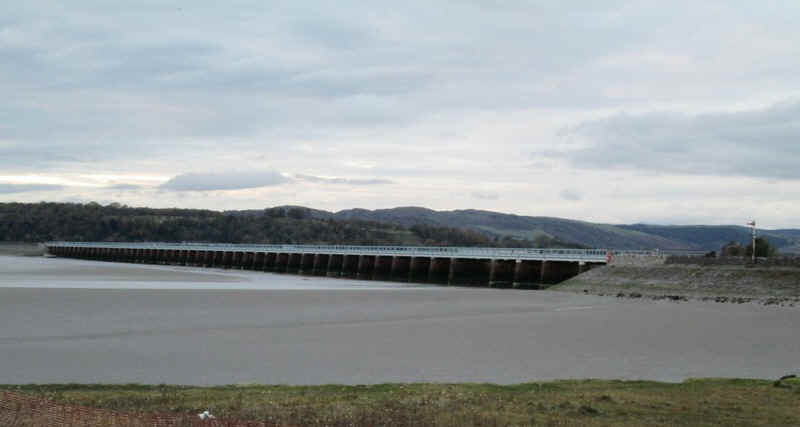 The River Kent estuary is seen in the centre. 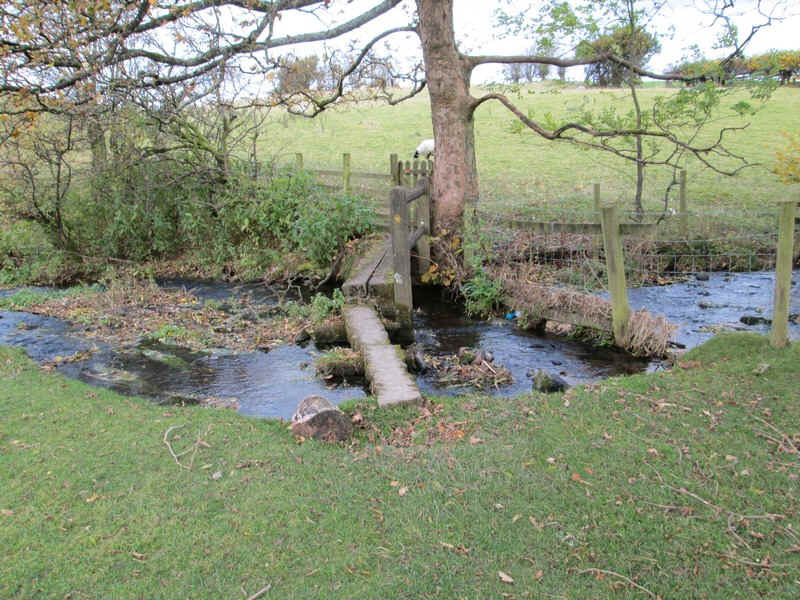 ....and a bridge over the M6. 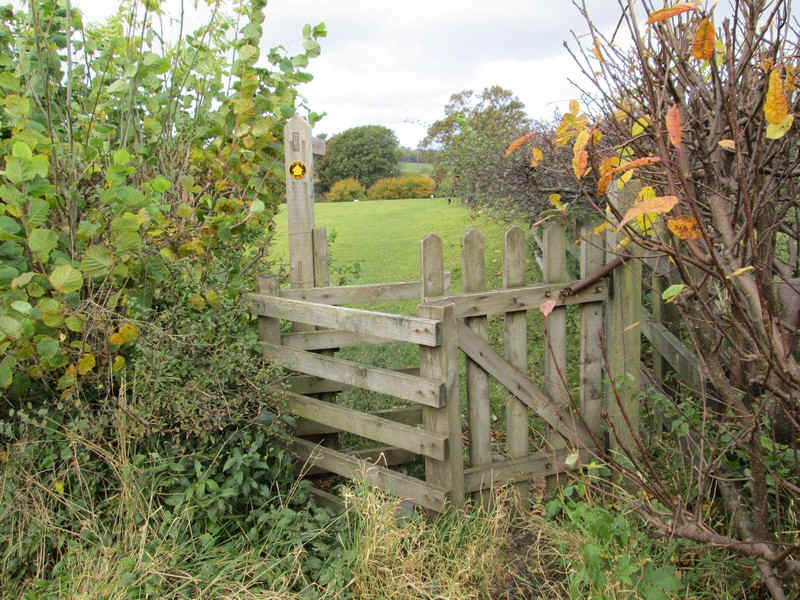 ....with a path across the fields ..
....a gate and a signpost point to the next footpath. 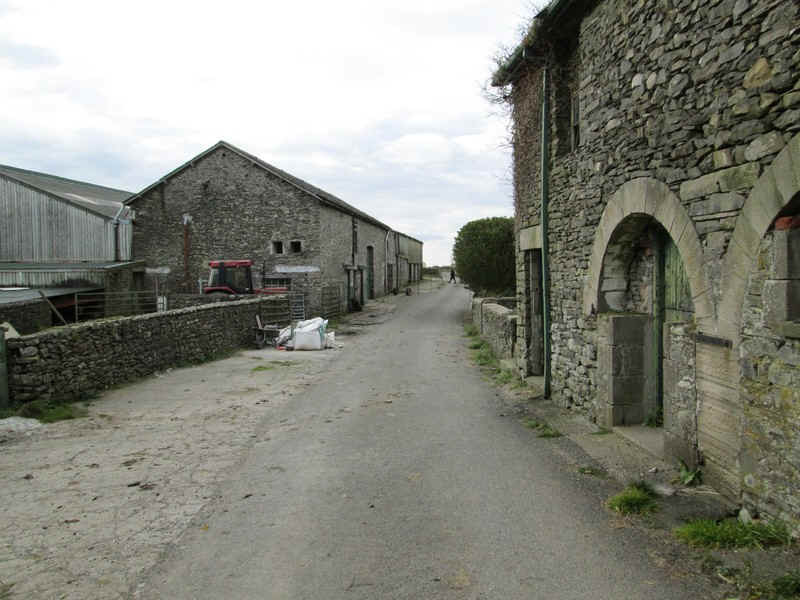 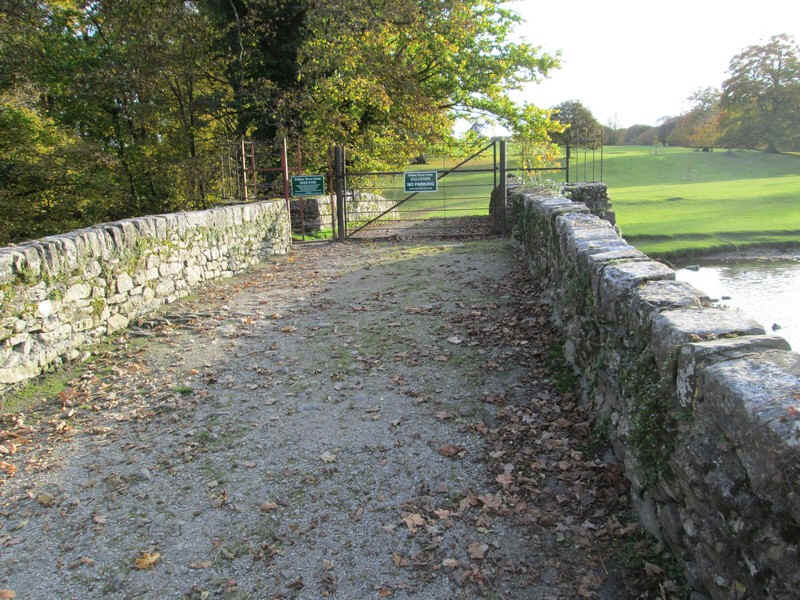 ....where a walled track keeps walkers away form the farm buildings. 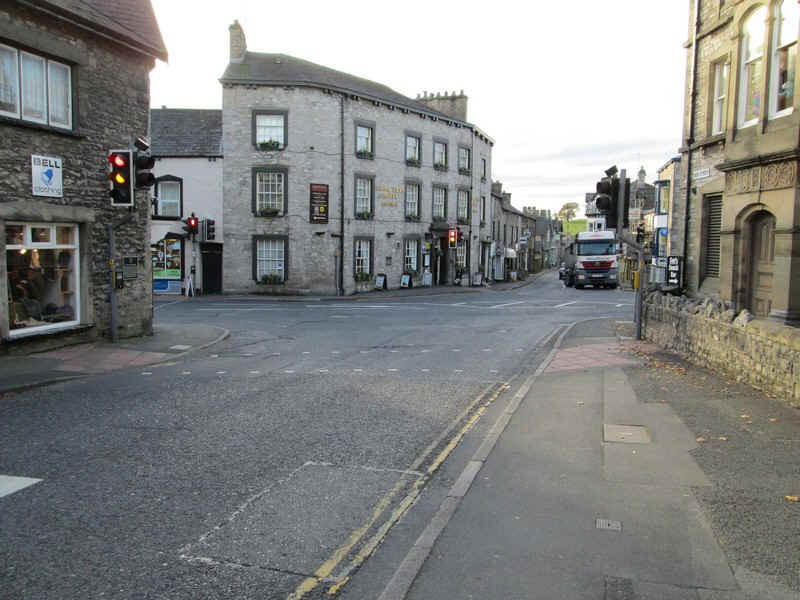 ...and the main A 65 Kendal to Skipton road. 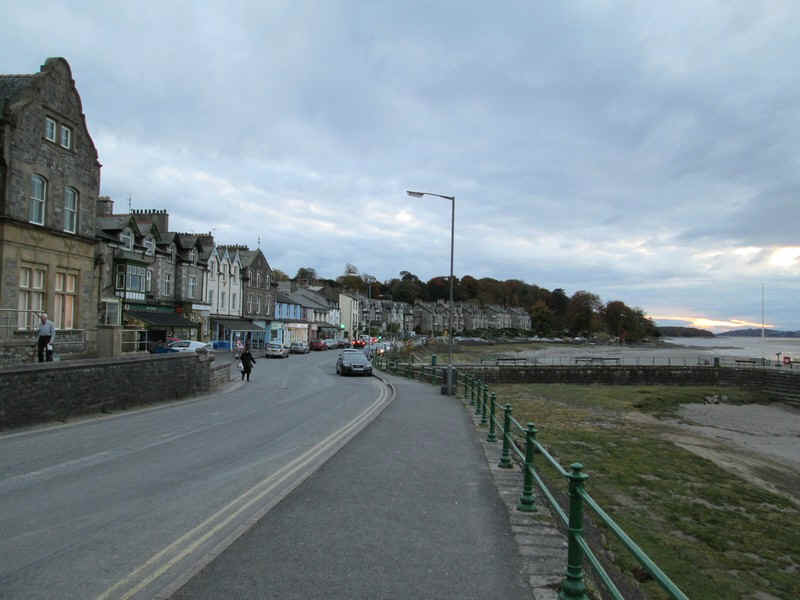 Unfortunately, I hadn't enough time to pop in the pub for a coffee as time was pressing if I was to reach Arnside before dusk. 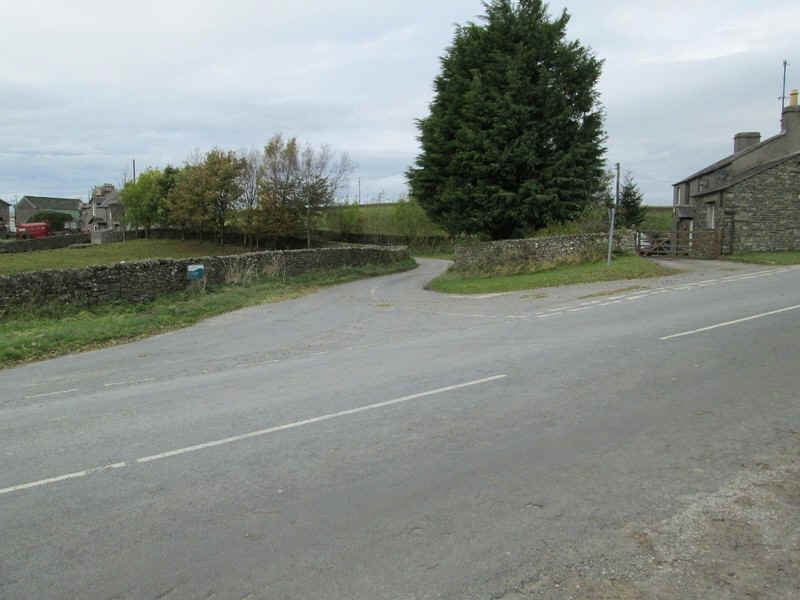 ...where there is this impressive house and..
....followed by a right turn up another lane. 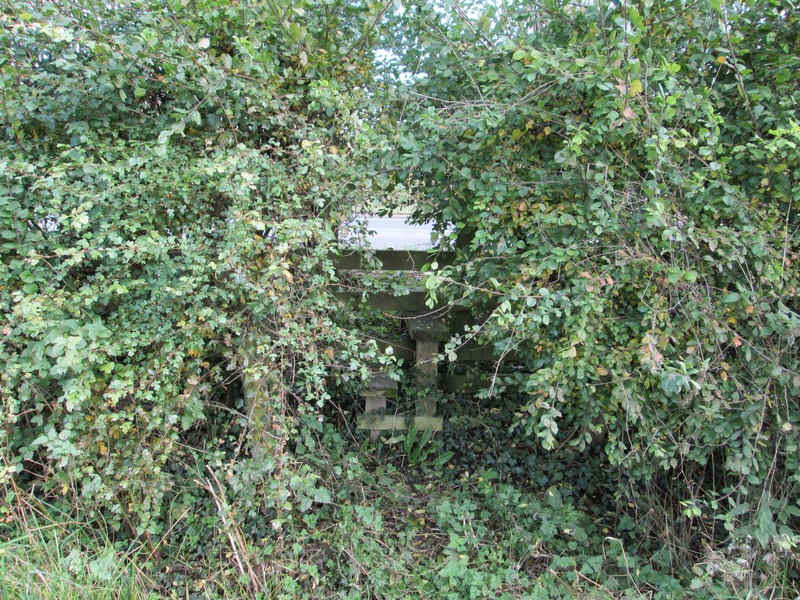 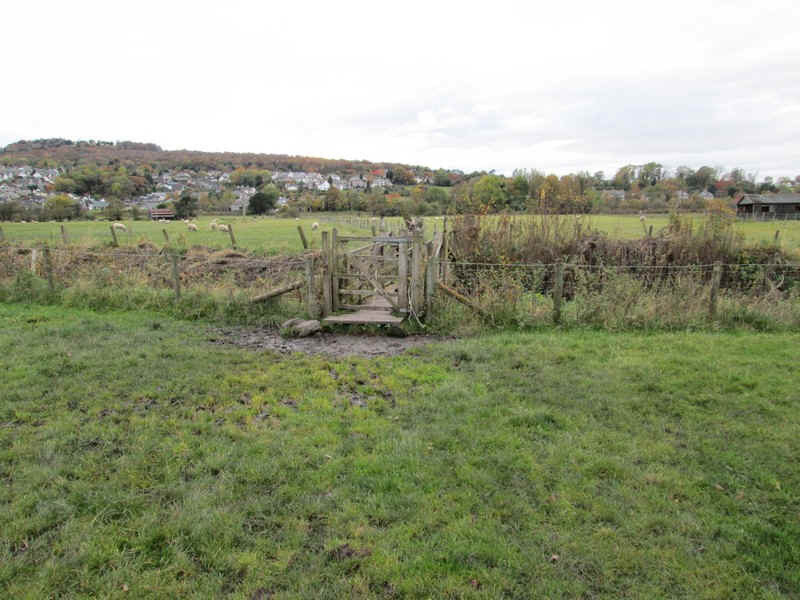 .....that I'd walked past a rather inconspicuous stile at the bottom of the field. 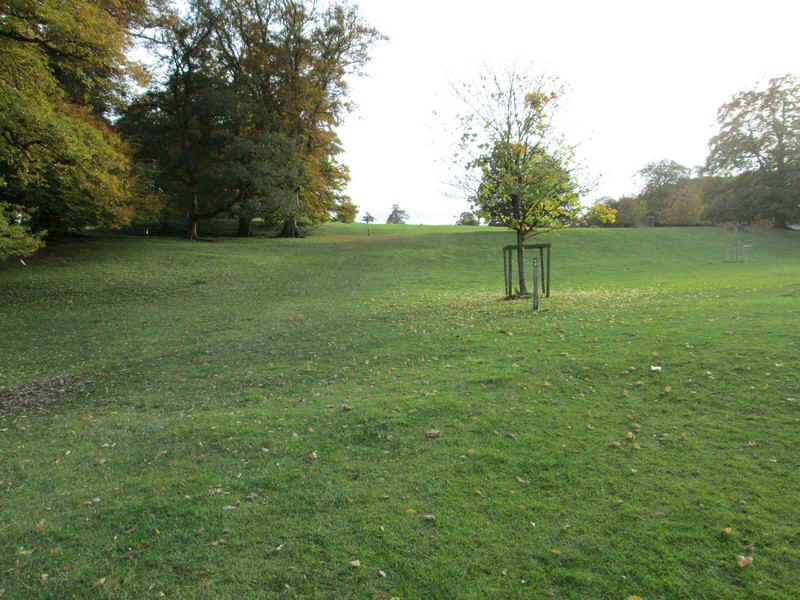 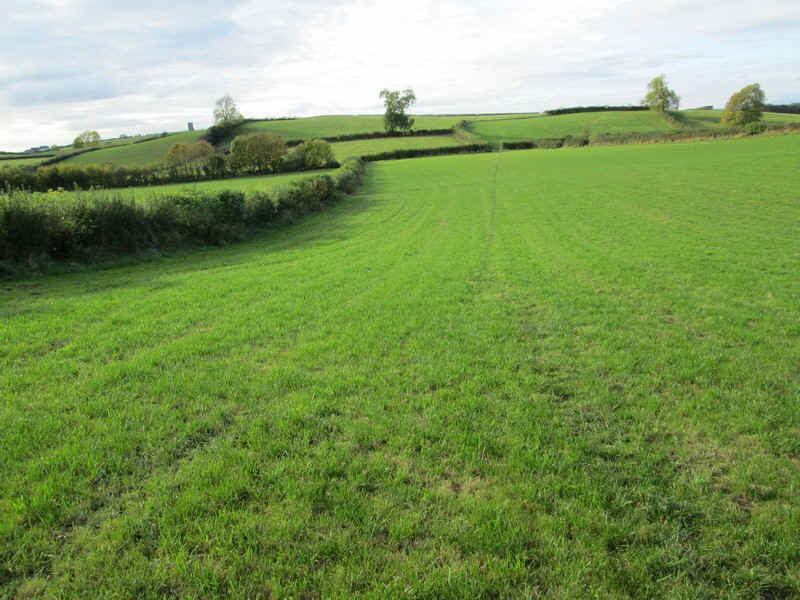 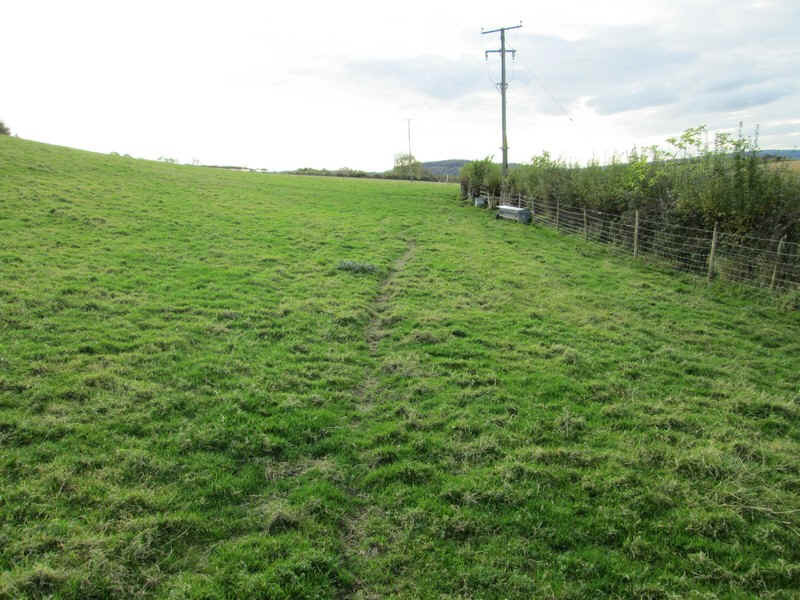 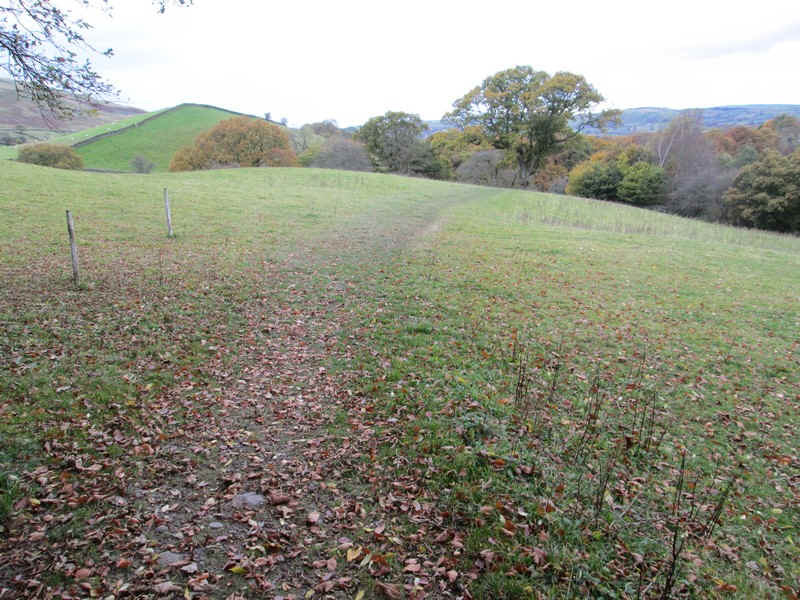 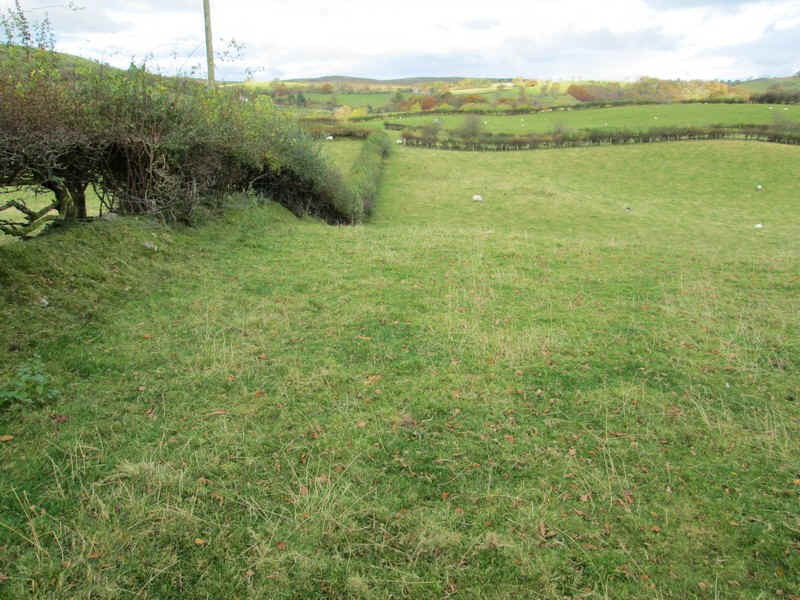 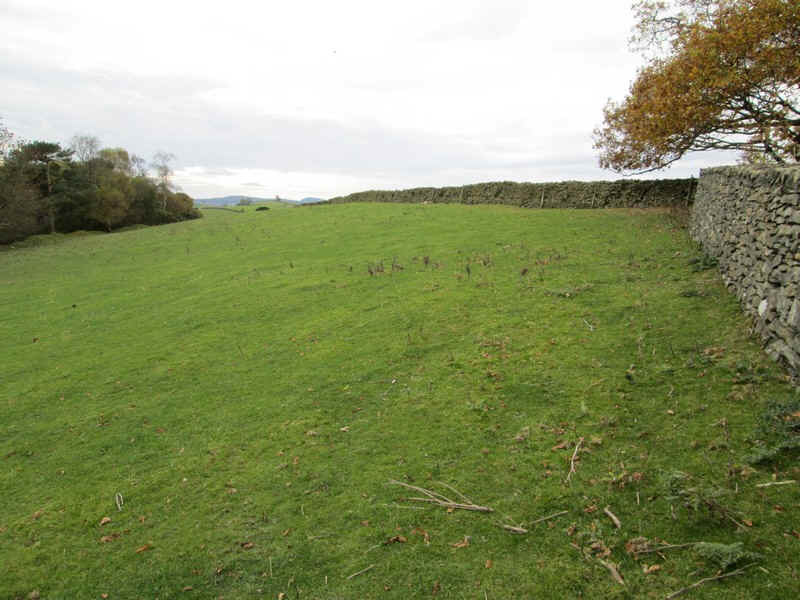 The path, according to the map, goes diagonally across this field so that's what I did - probably not easy in summer. 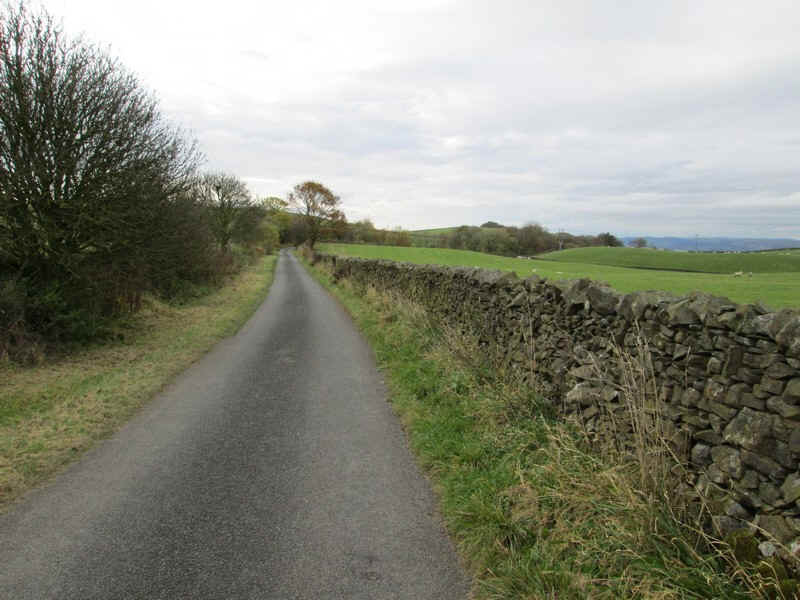 .....down to the Crooklands to Milnthorpe road. 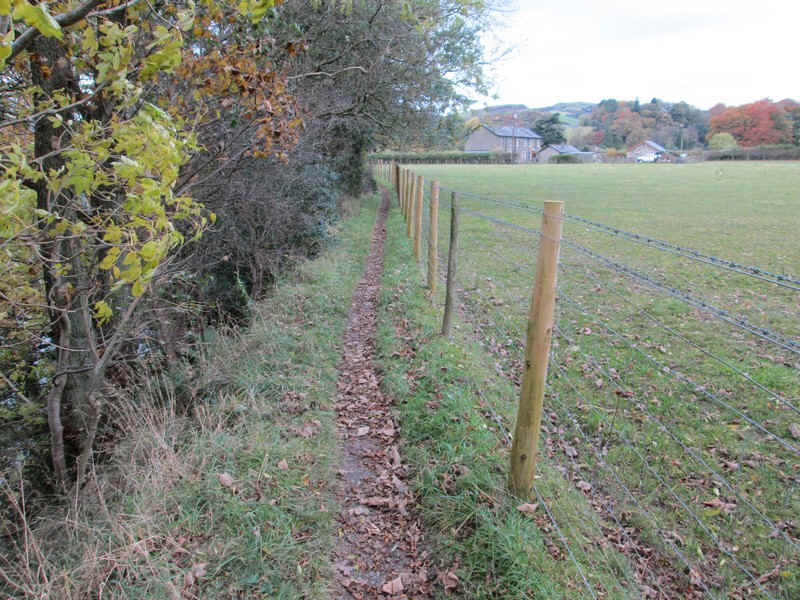 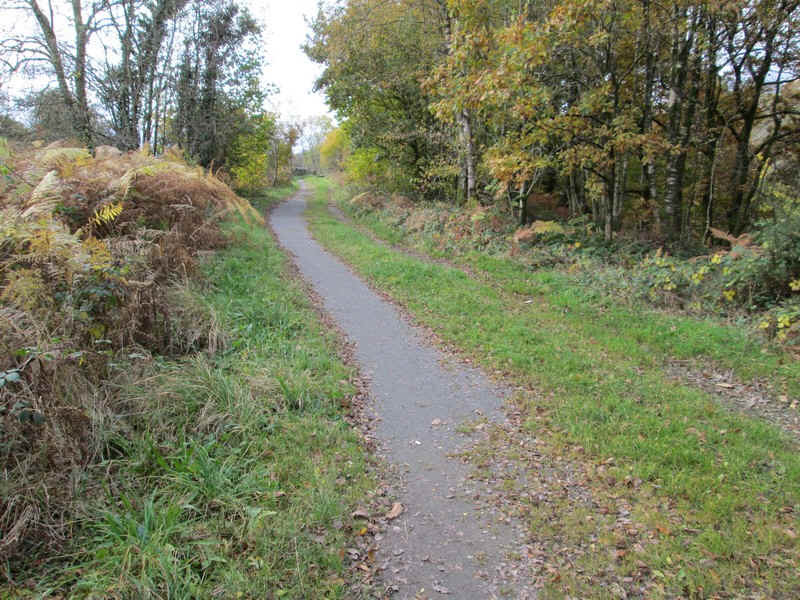 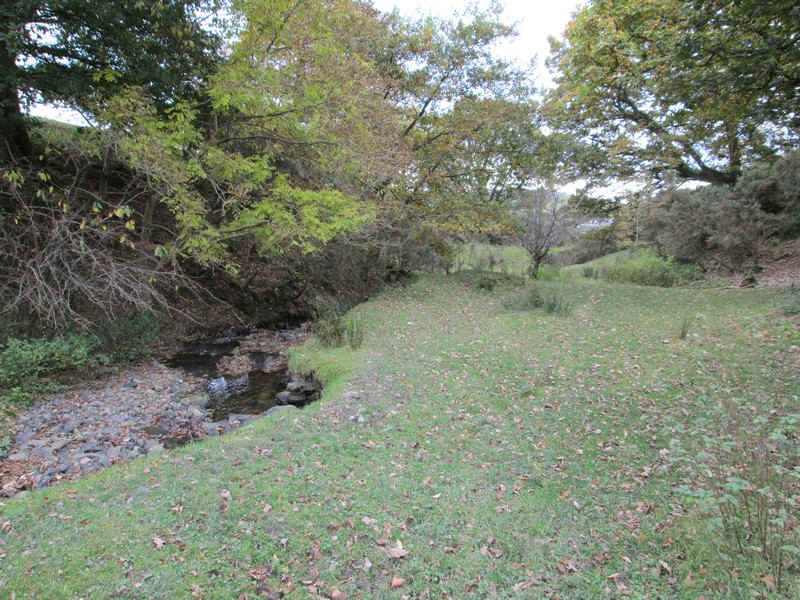 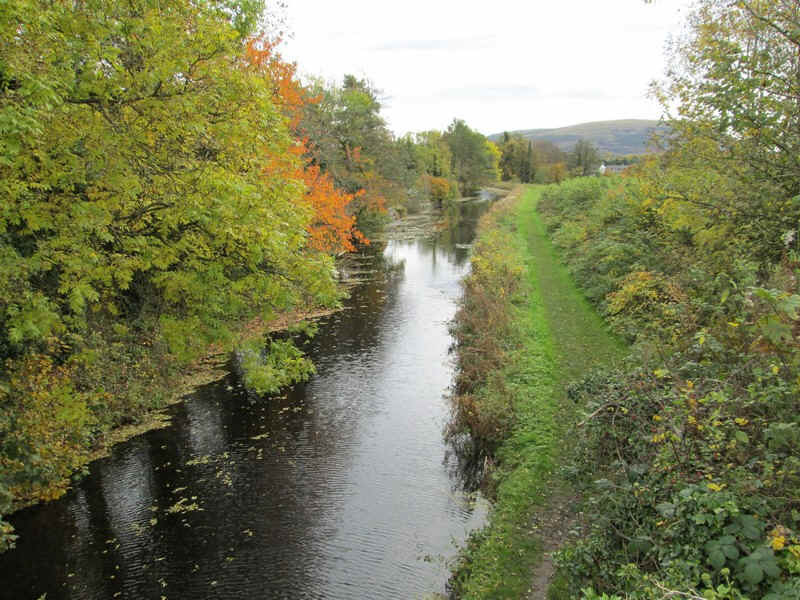 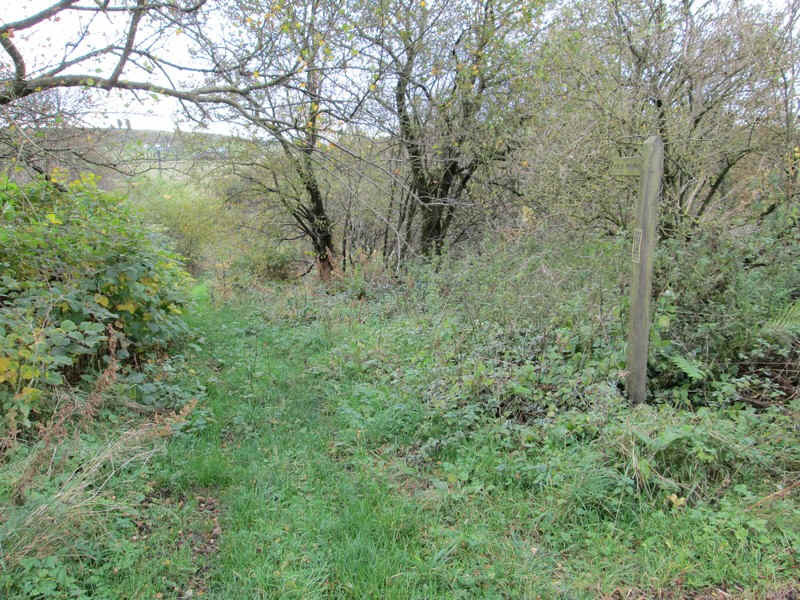 According to the OS map there should be a path directly opposite but where is it? 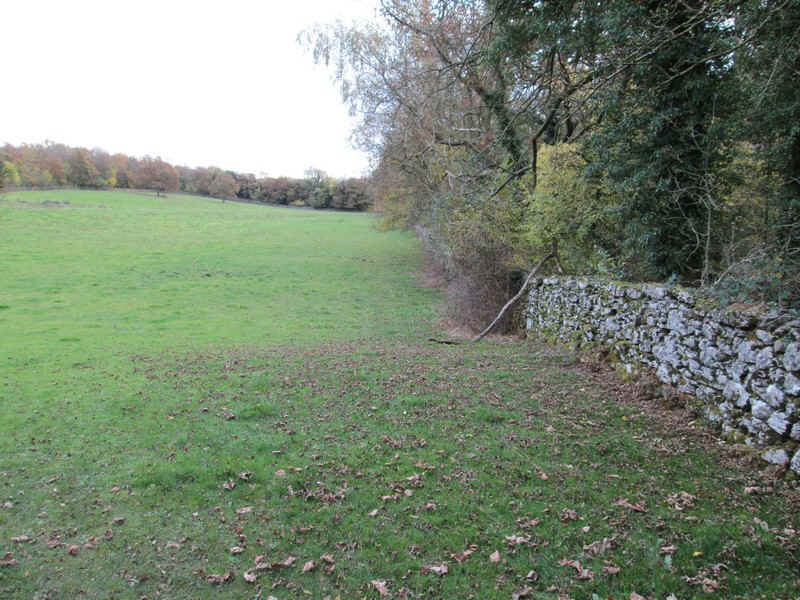 ...then uphill towards that tree on the skyline but again where was the stile? 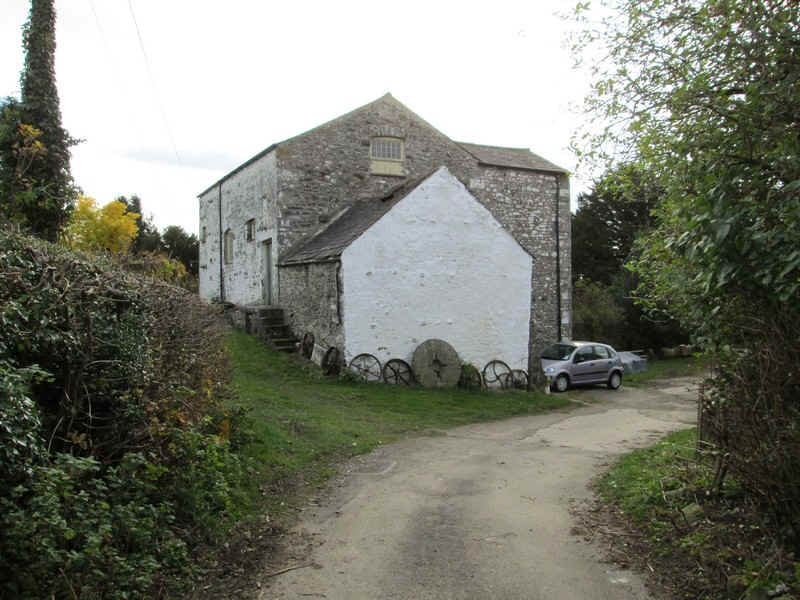 ...yet another group of 18th century houses and farm buildings. 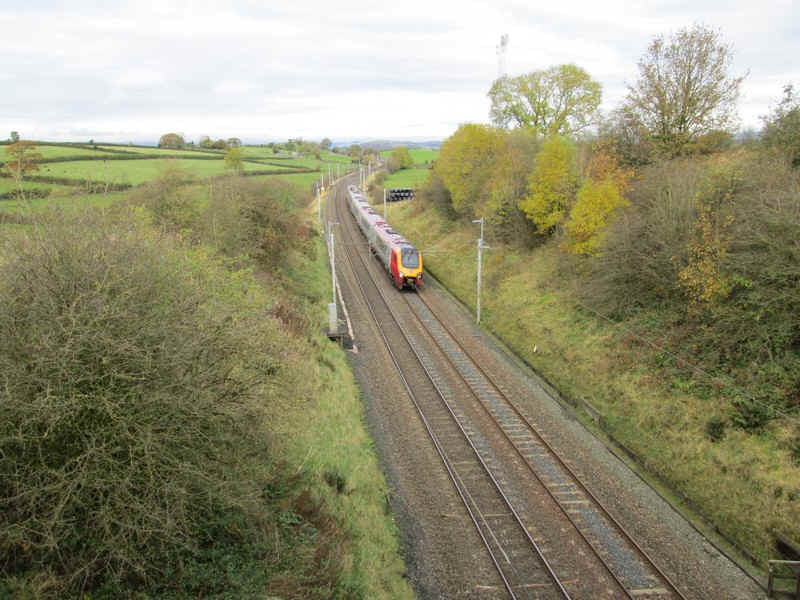 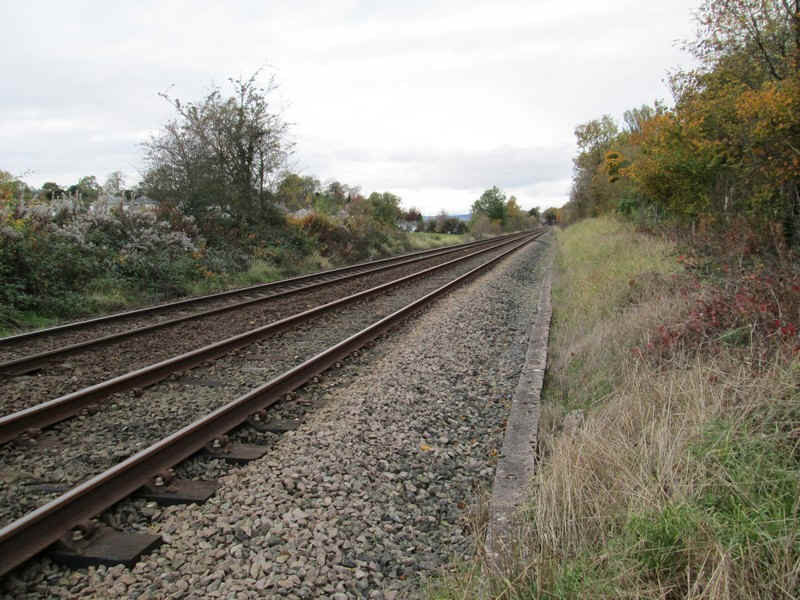 The West Coast Main Line is crossed just beyond the hamlet so I decided to have a brief rest in the hope a train came along, which it did - an Edinburgh to Birmingham service travelling at about 110 mph. 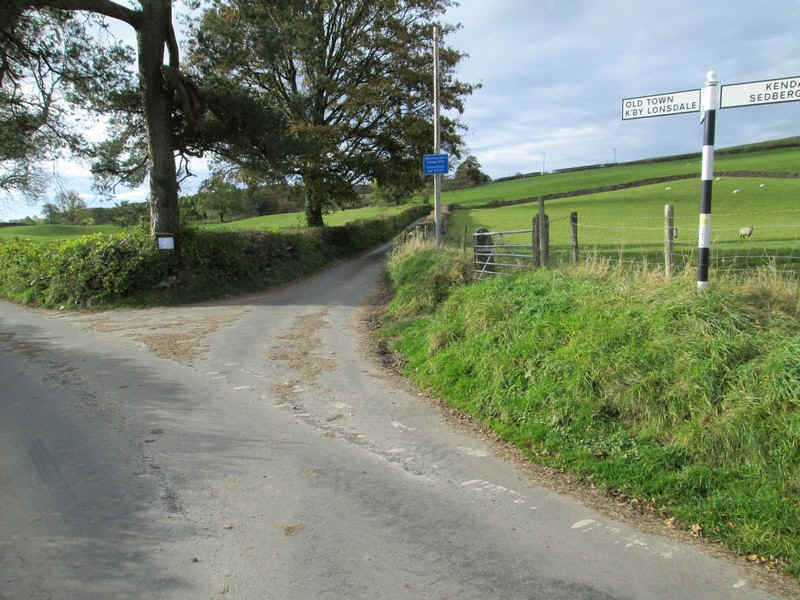 A few hundred yards along the lane this signpost points towards Haverflatts Lane. 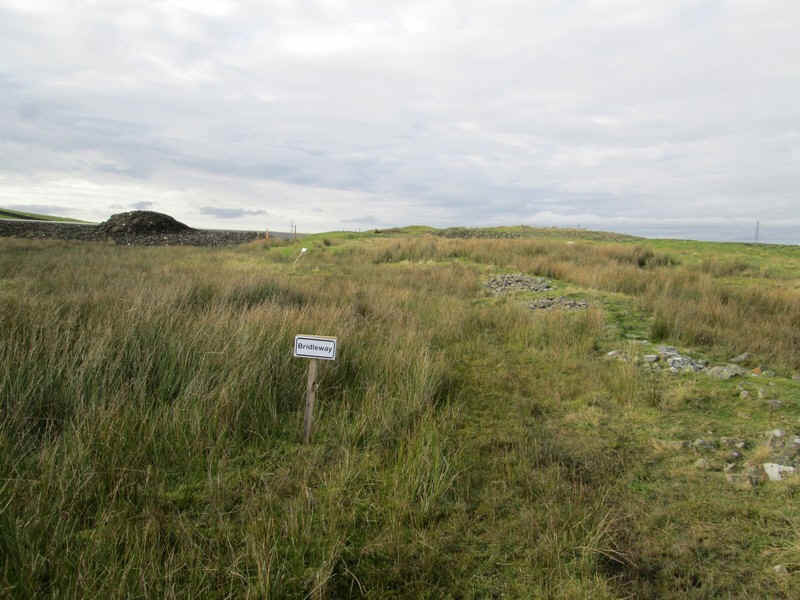 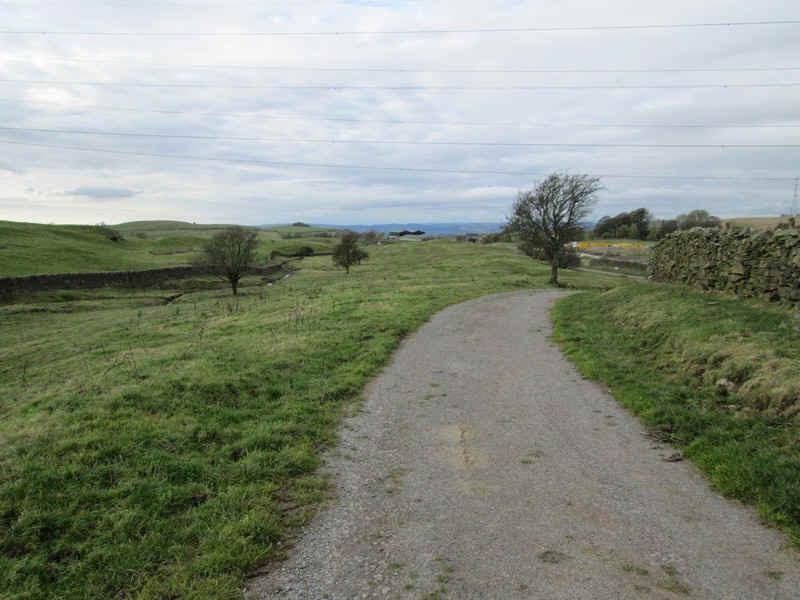 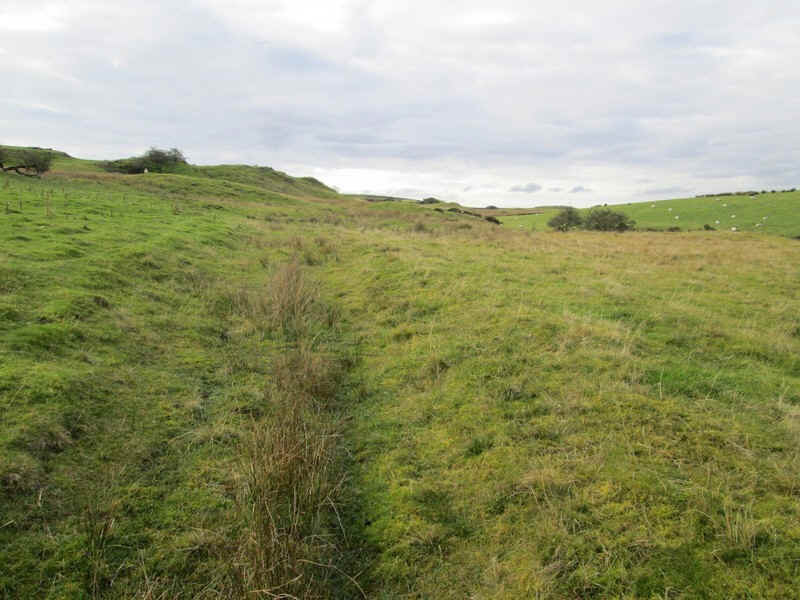 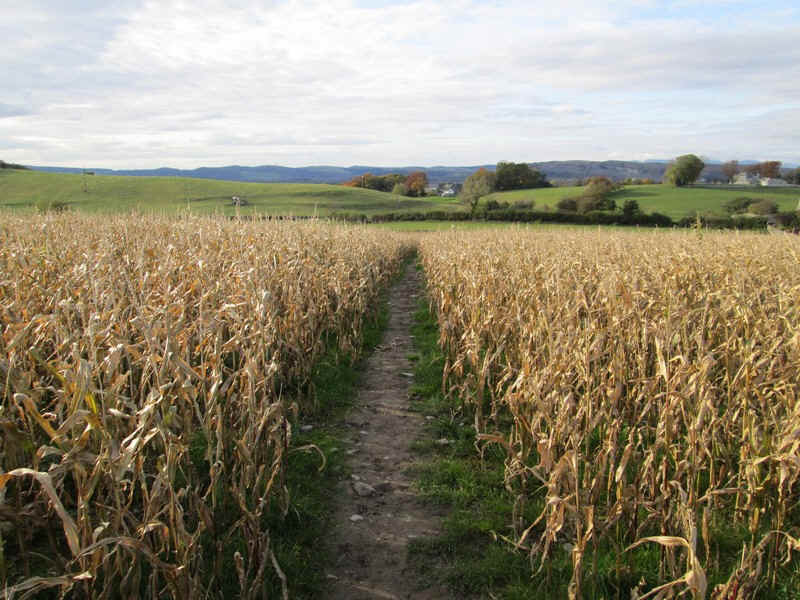 The path can be seen clearly going through the fields to the skyline. 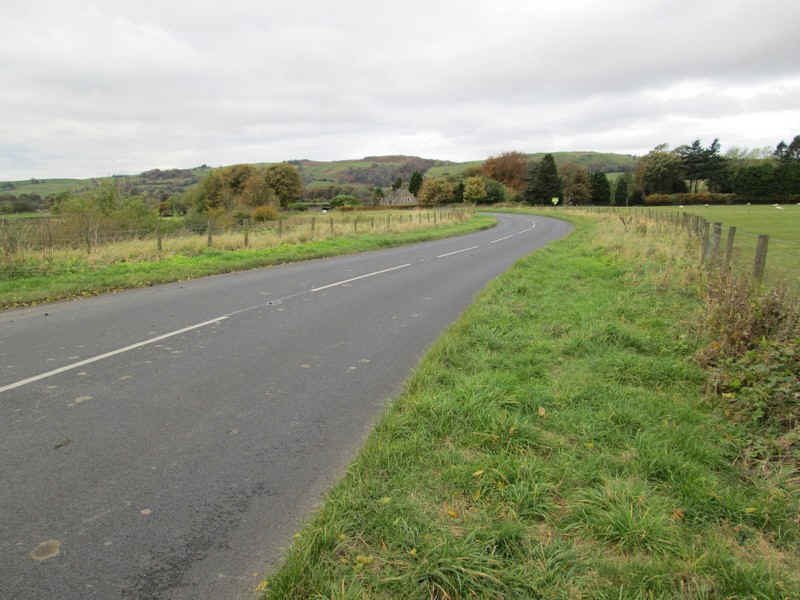 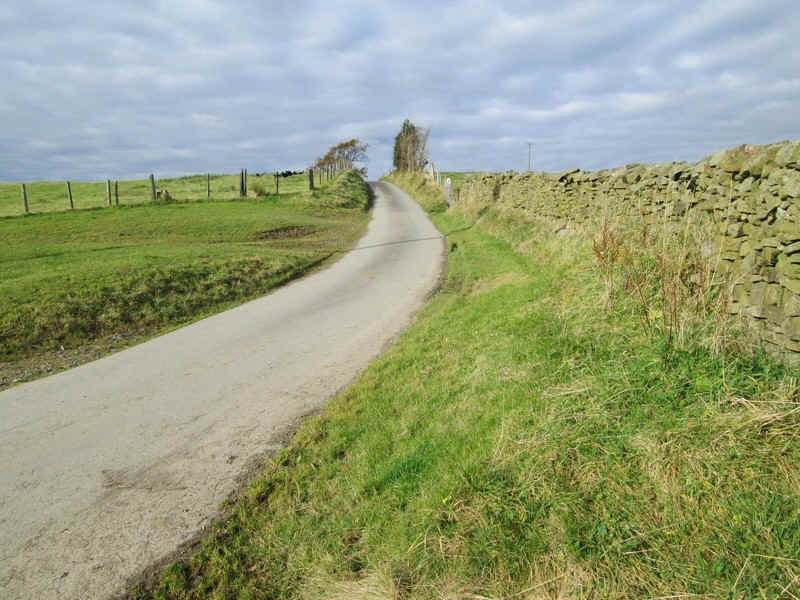 The way forward is now down Haverflatts Lane towards Milnthorpe. 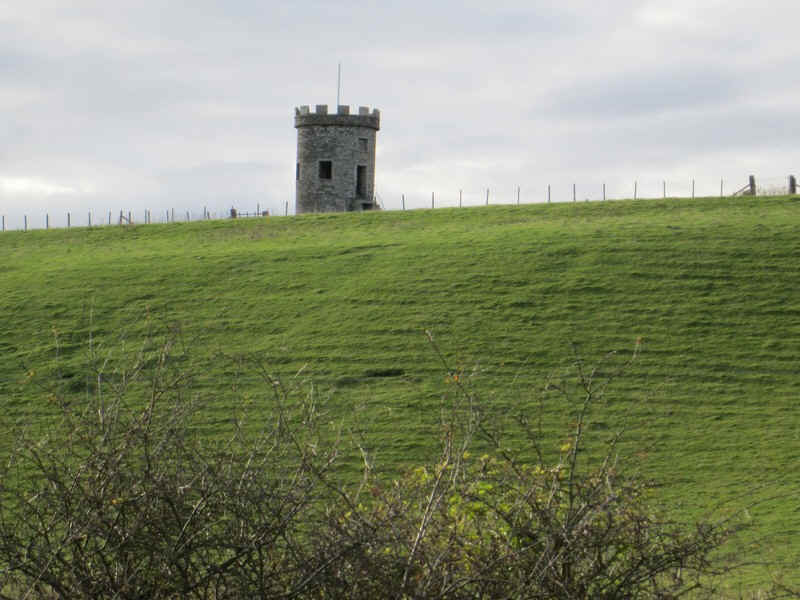 Over to the west is St Anthony's Tower, built in 1832 to celebrate the passing of the Reform Bill. 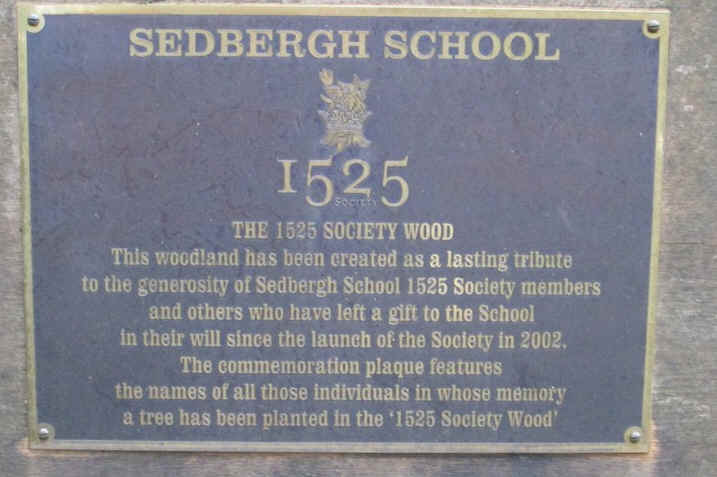 More details can be found at this link. 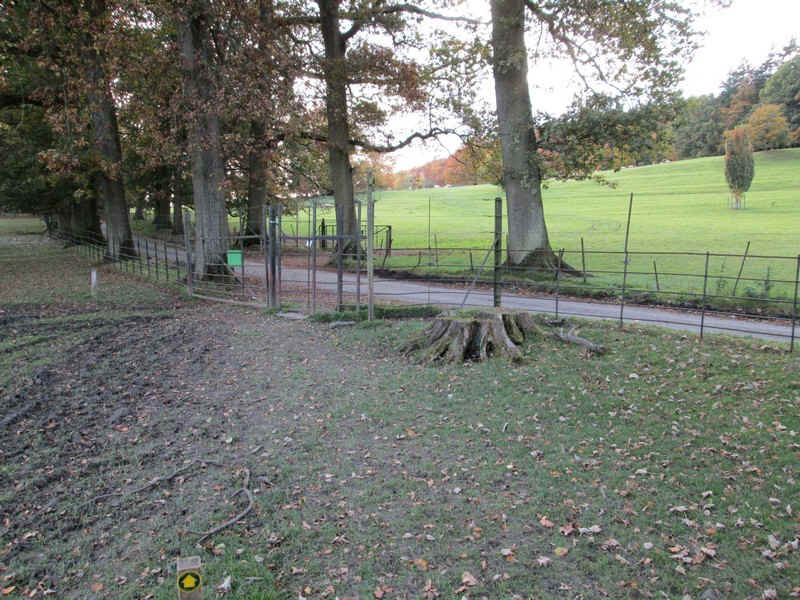 ....and through the gates to The Milnthorpe deer park. 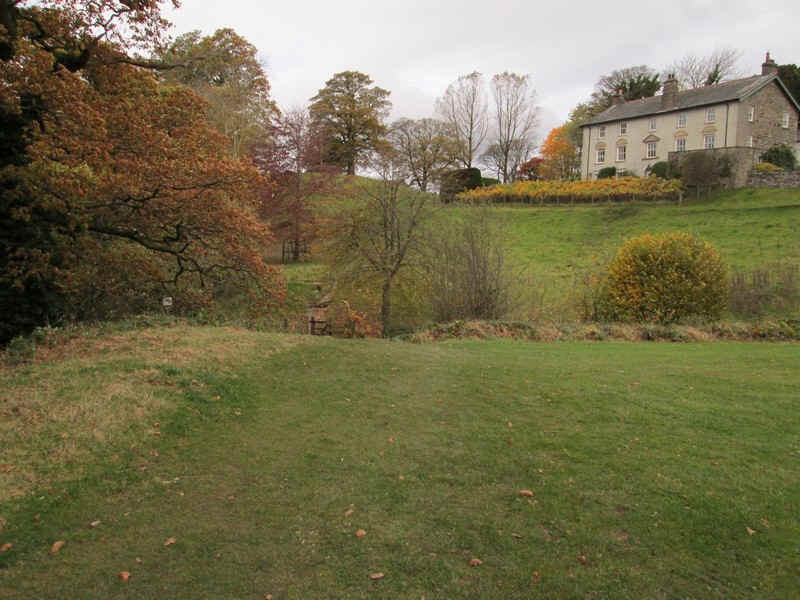 .....rising above the country house of Dallam Tower. 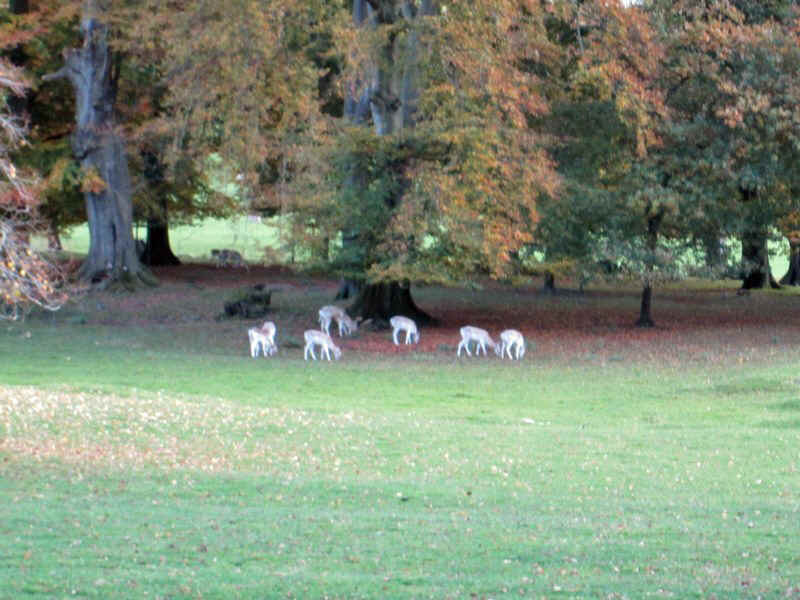 Herds of deer could be seen scattered across the park. 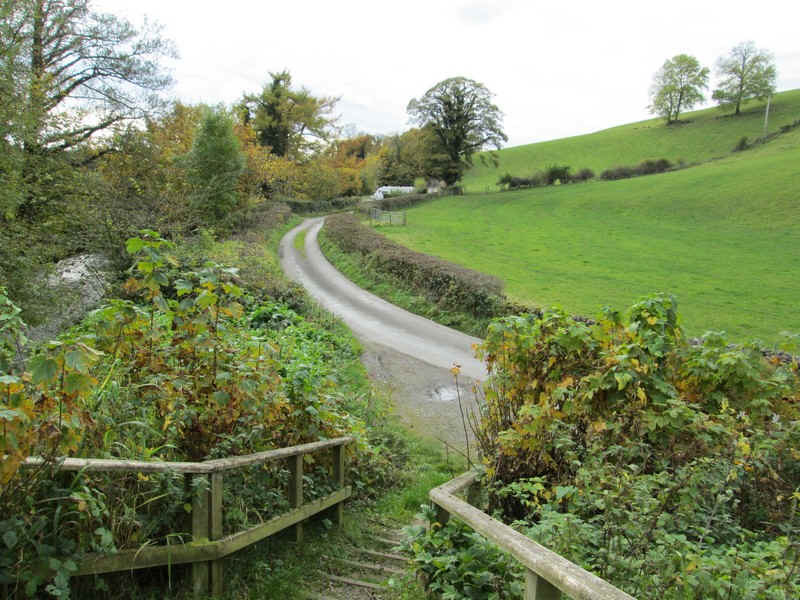 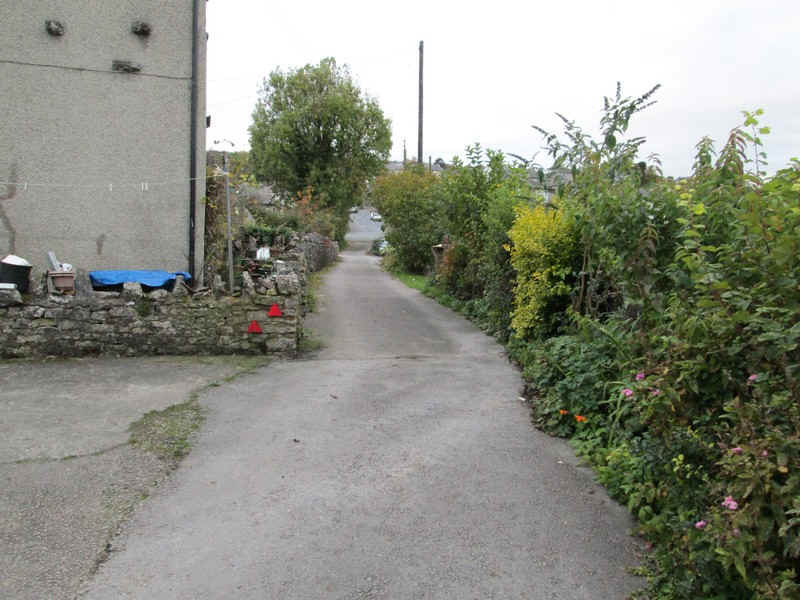 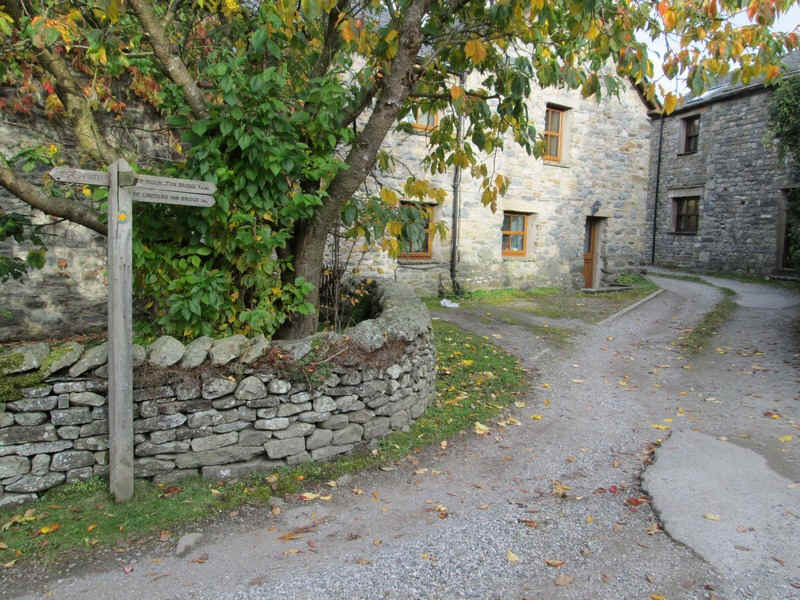 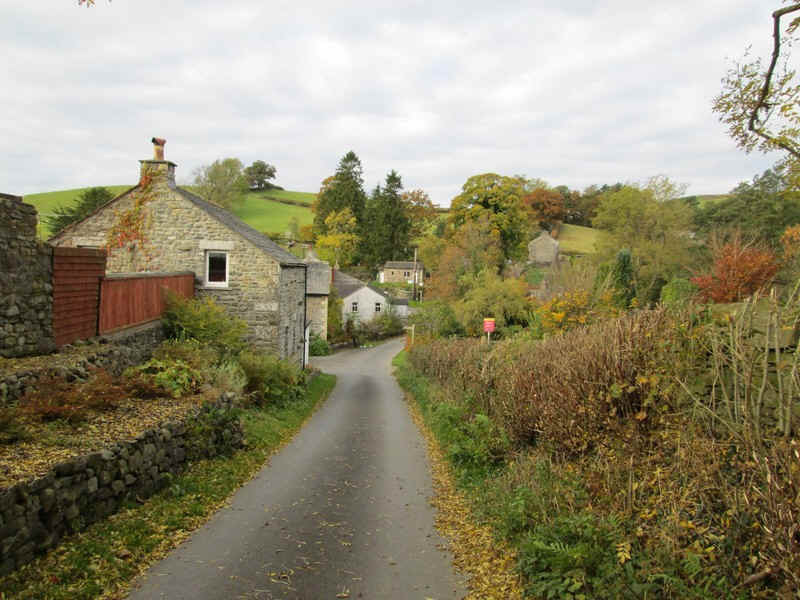 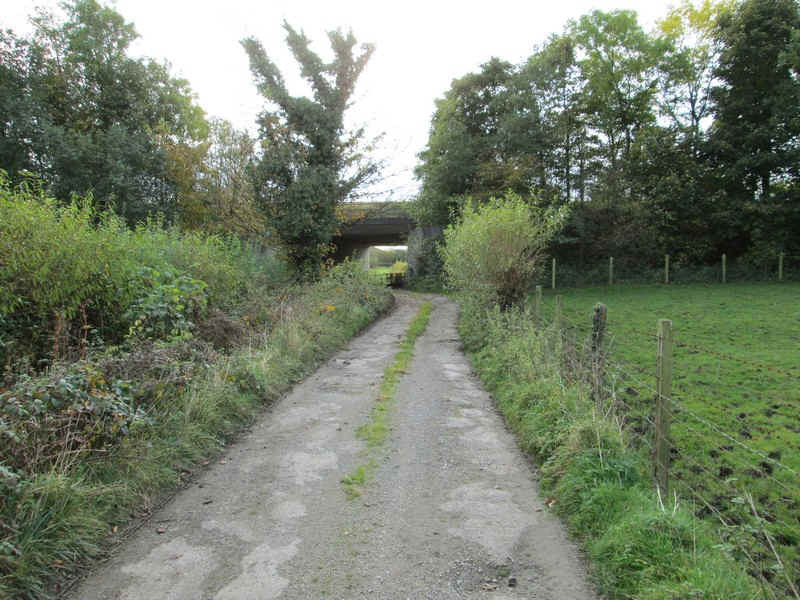 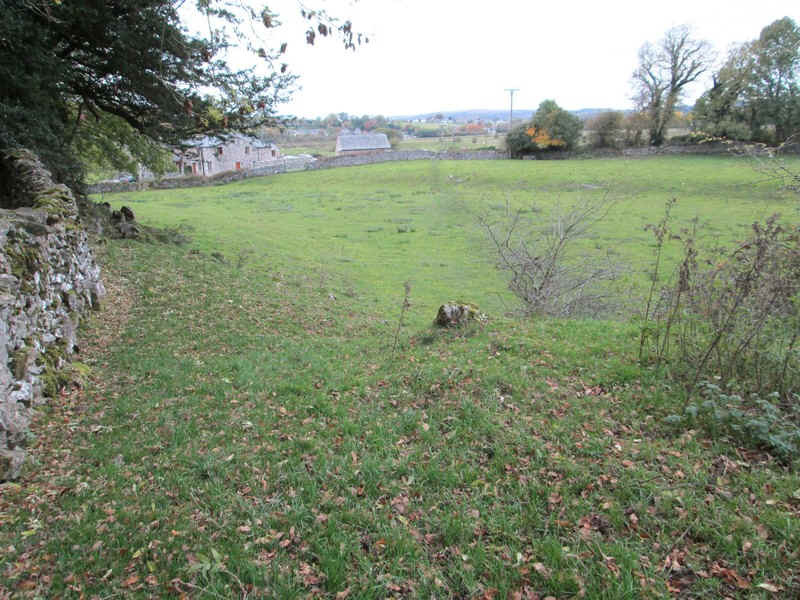 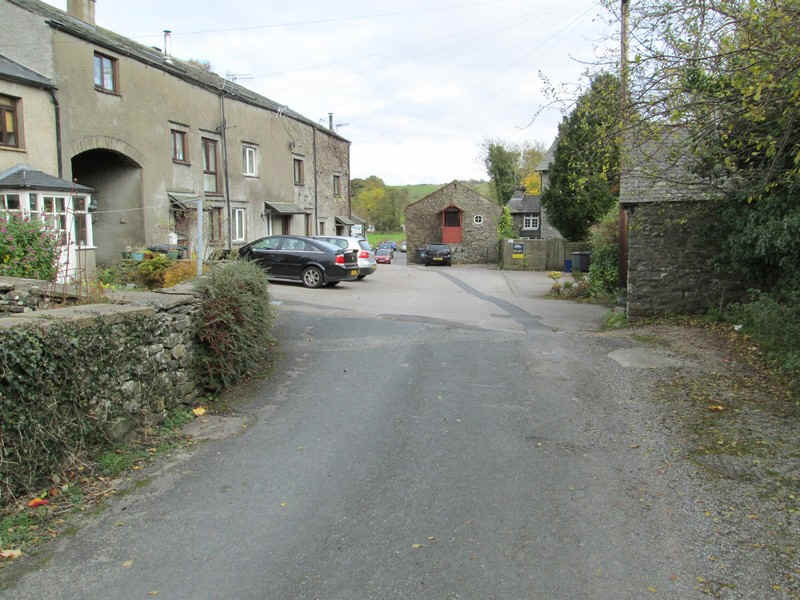 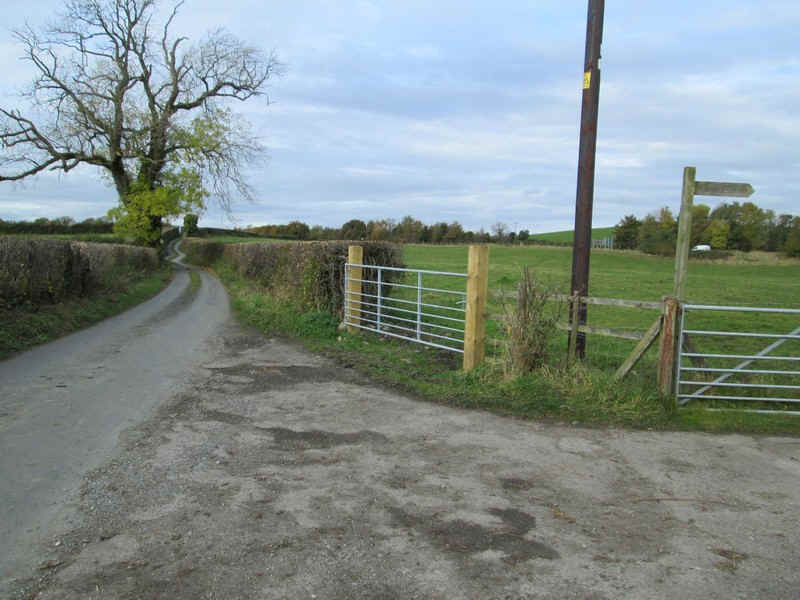 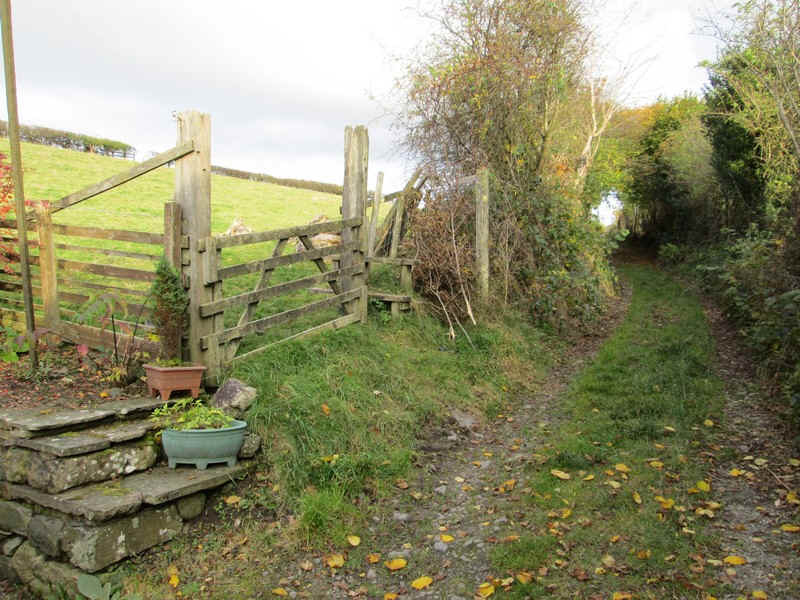 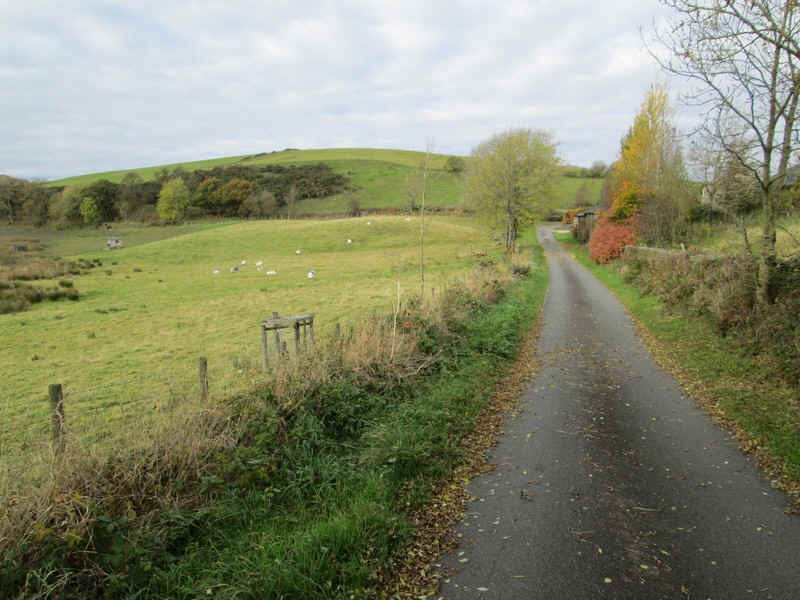 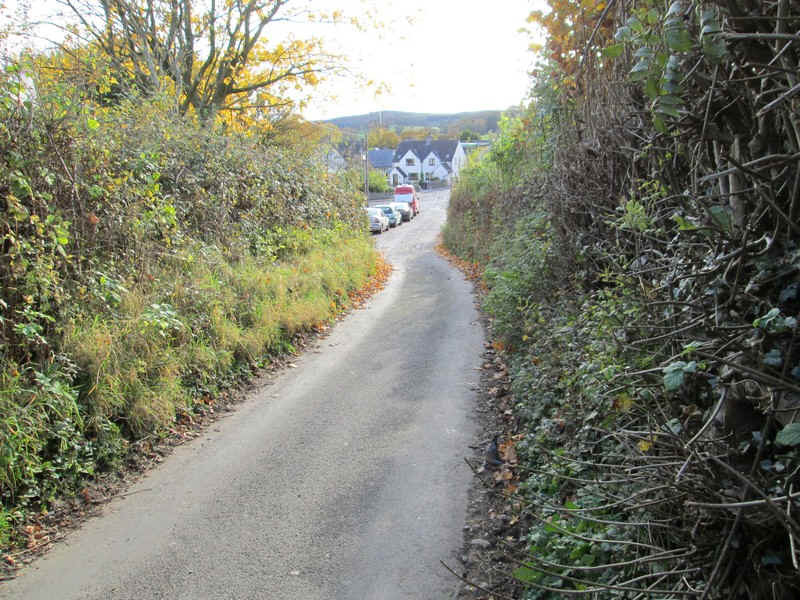 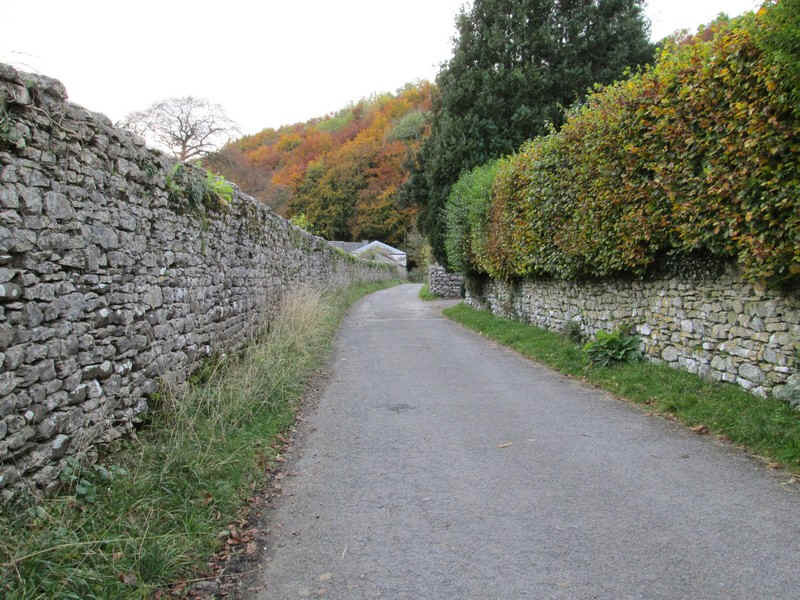 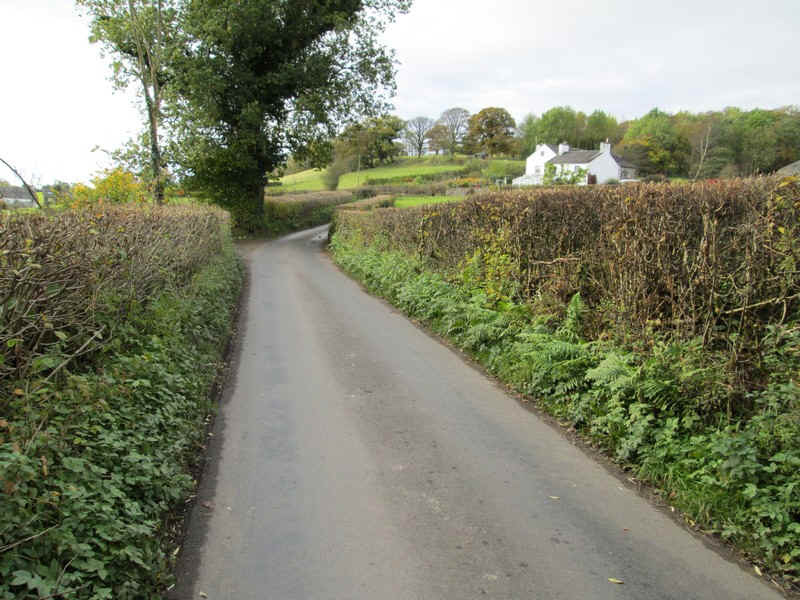 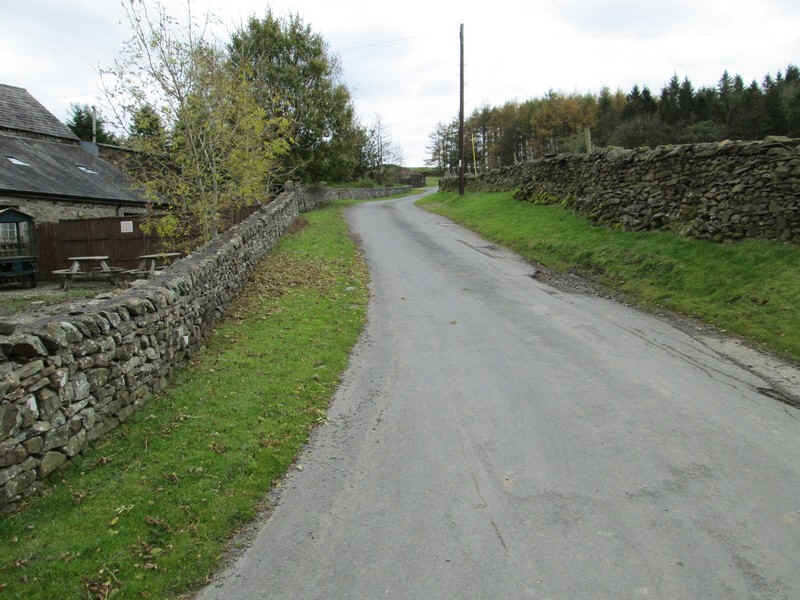 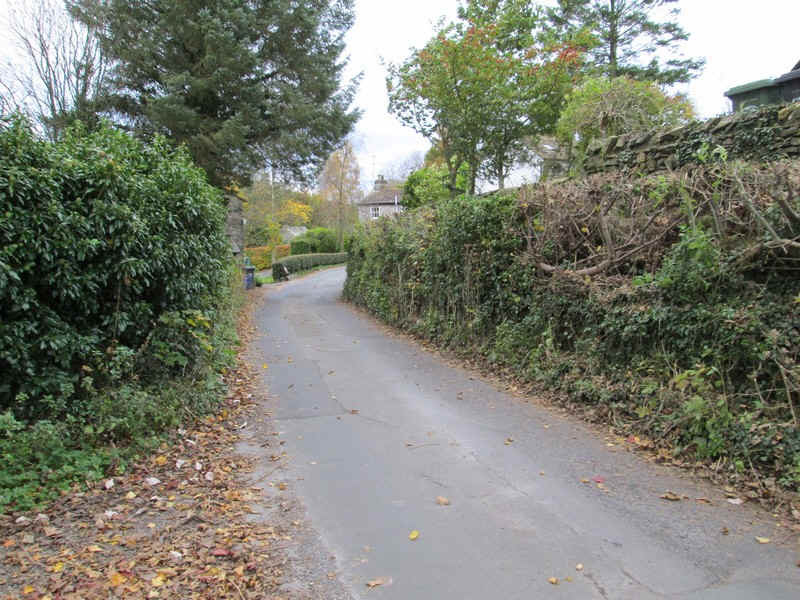 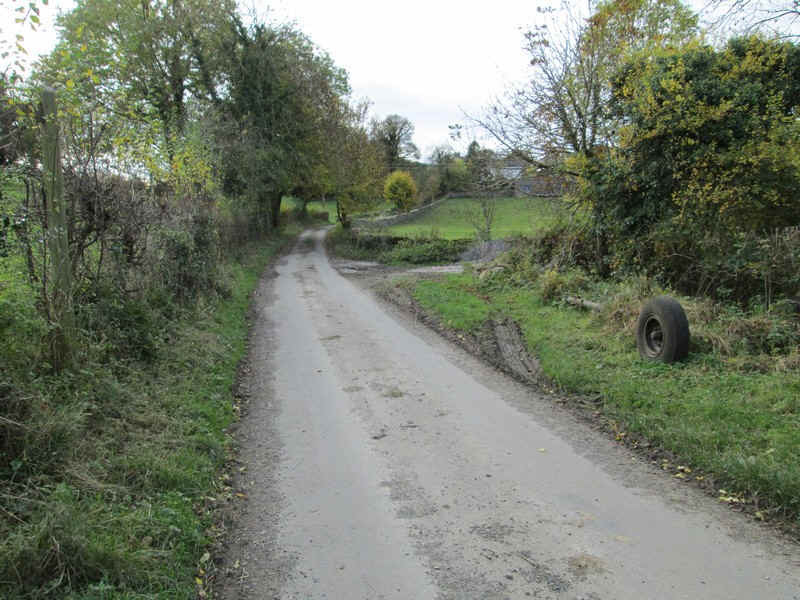 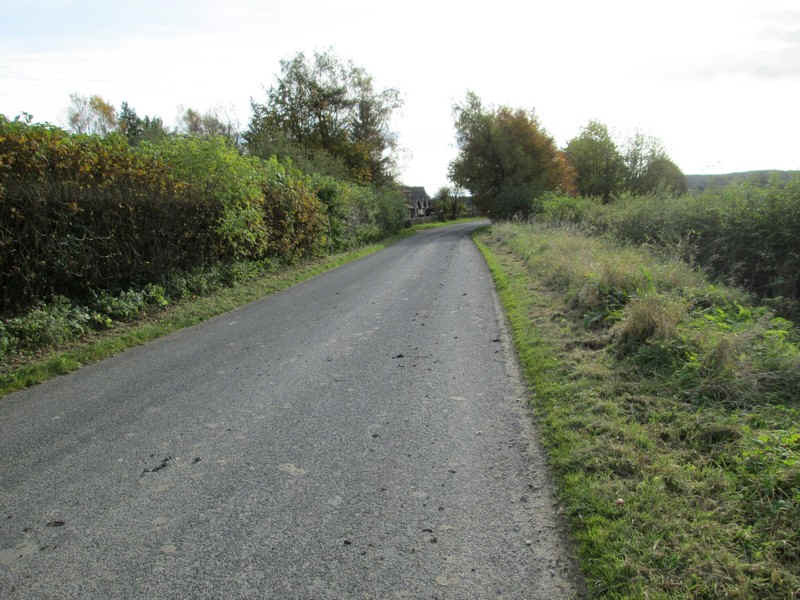 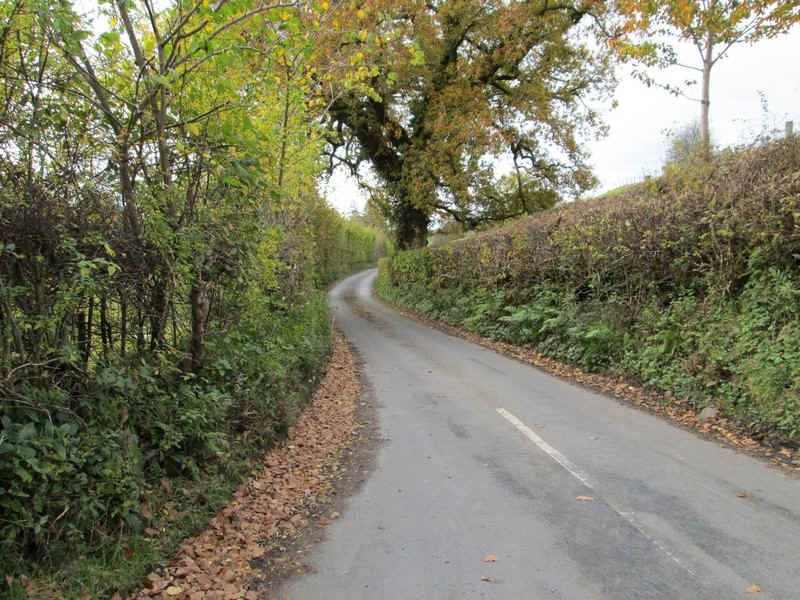 ....and then along a walled lane towards Wray Cottage, where there is a choice of routes. 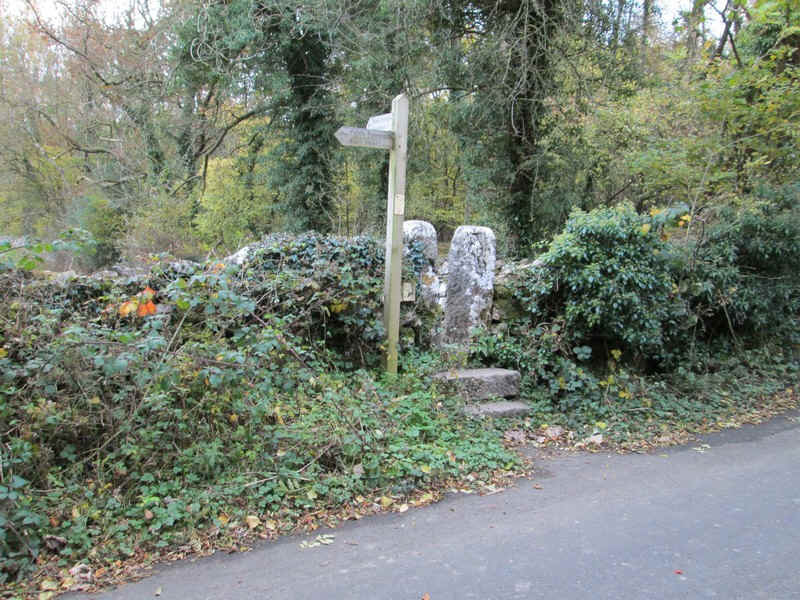 ....and past a typically detailed signpost. 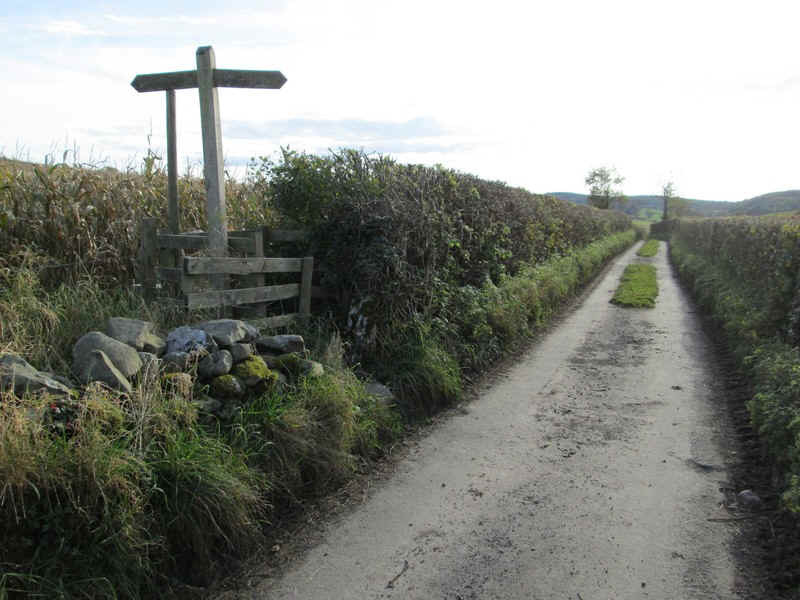 The signpost throughout this part of Cumbria almost all have precise details of where the path is heading. 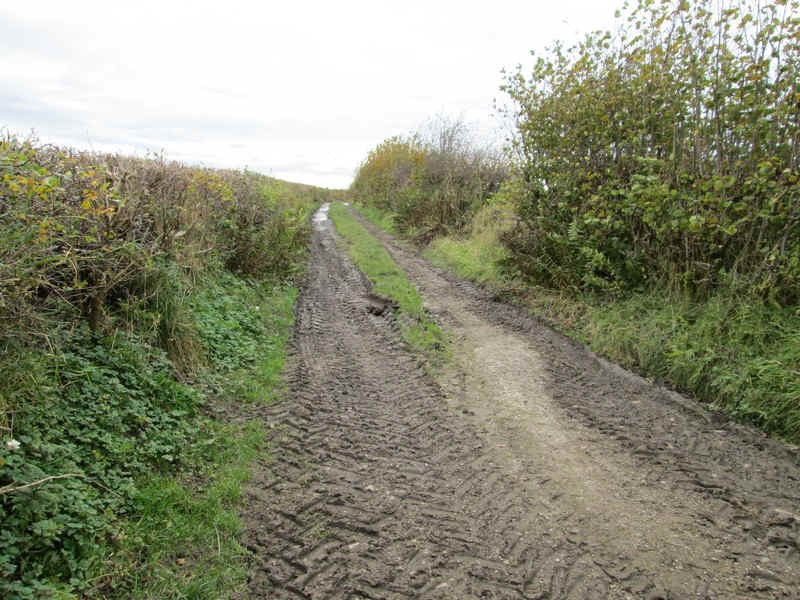 There's some extremely boggy ground before..
....just before the lane to Hazelslack is reached. 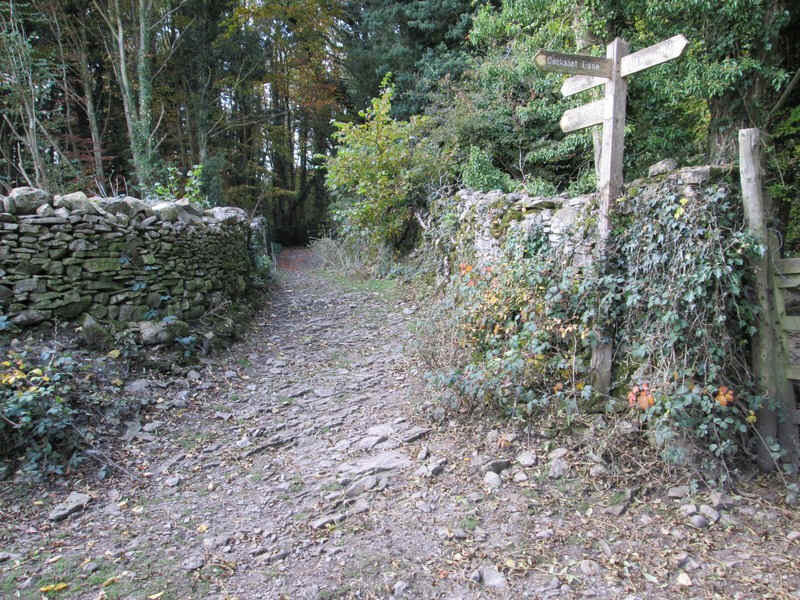 At Hazelslack the first signpost to Arnside appears - nearly at journey's end. 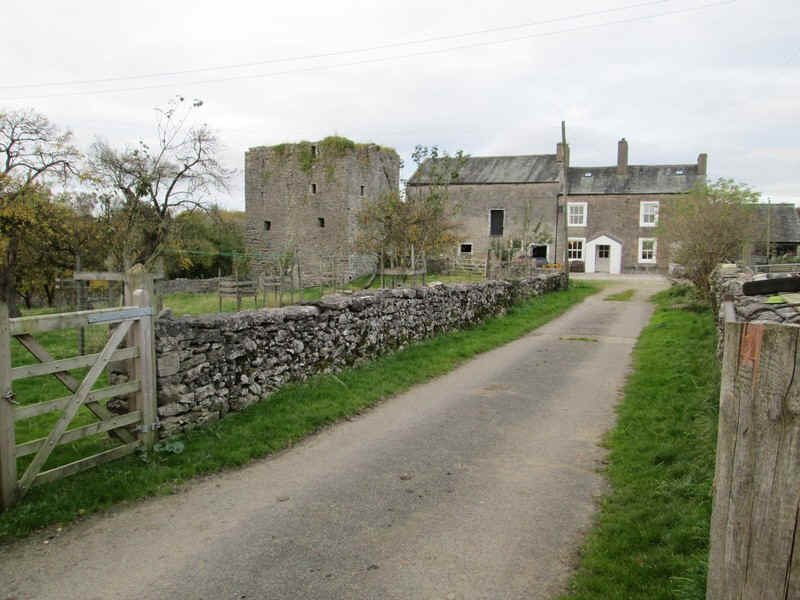 Hazelslack Tower is a ruined pele tower probably from late 14th century. 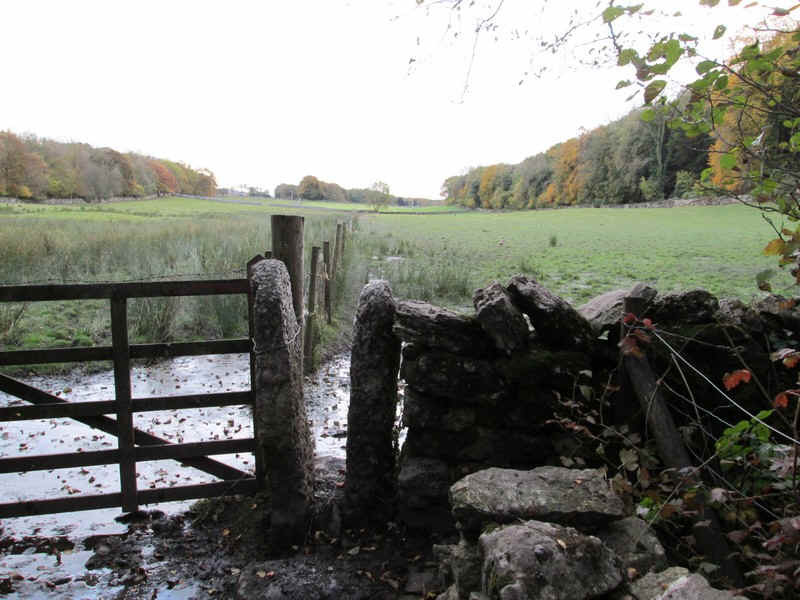 ....heading straight across Arnside Moss. 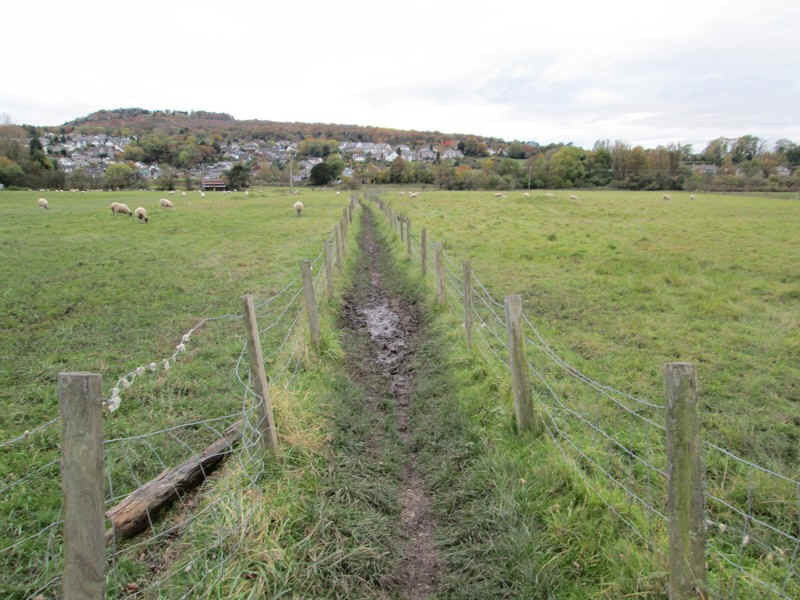 ....one of the drainage channels..
.....the viaduct over the Kent estuary. 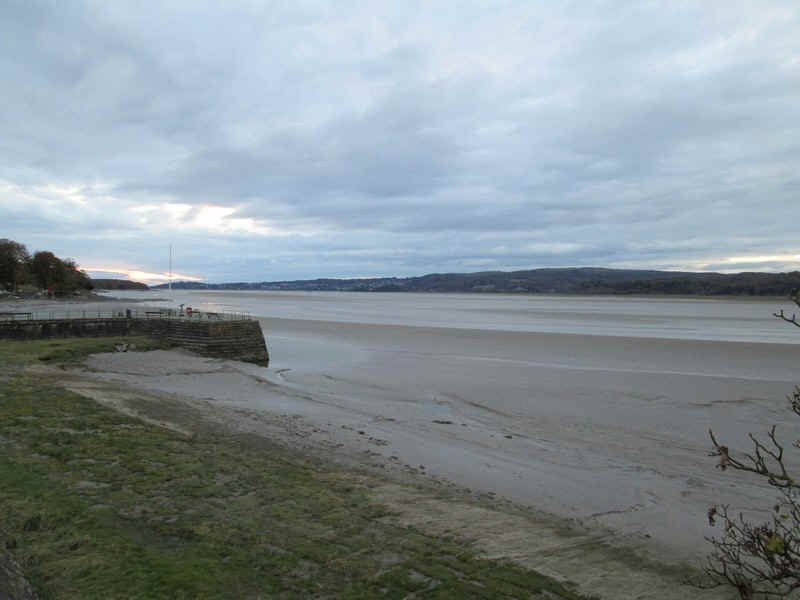 When I arrived it was almost low tide so Morecambe Bay's quicksands were exposed. 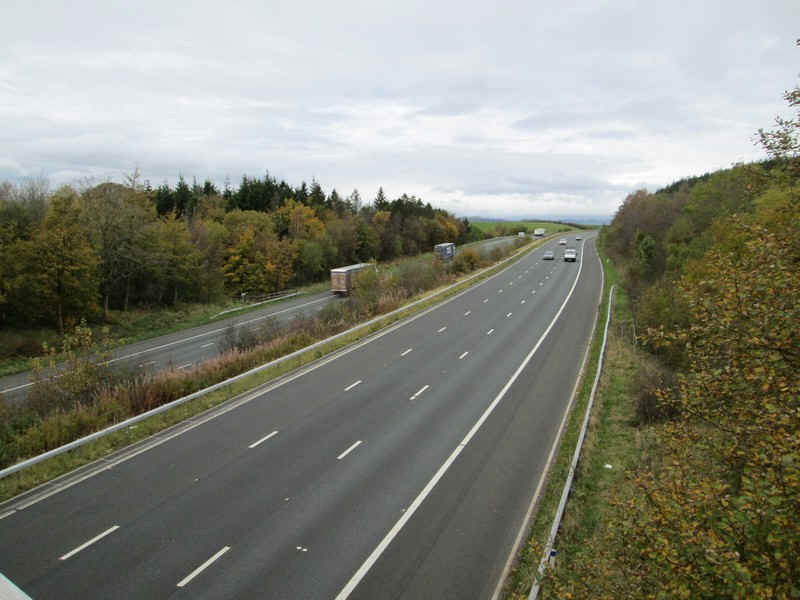 Journey's end is approximately 117 miles (202km) from Teesmouth. 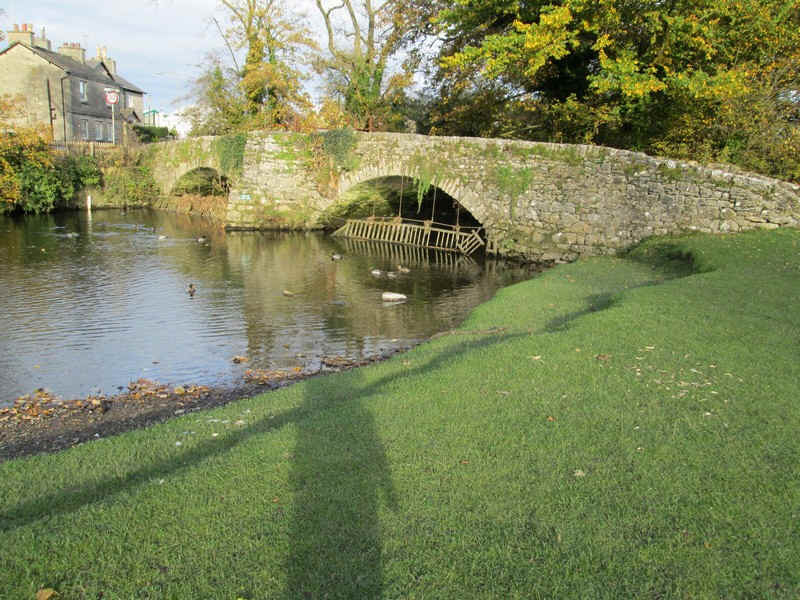 Next day the tide was in and the estuary looked much more like the sea. 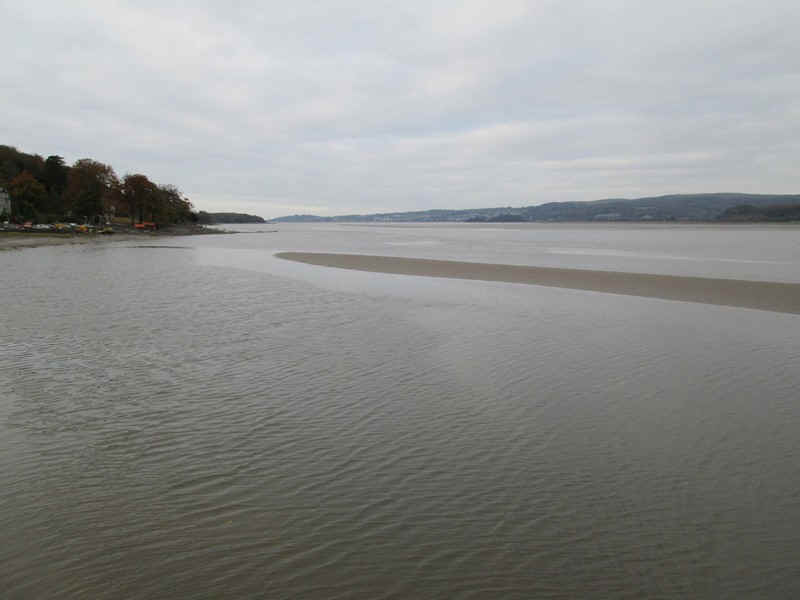 Beyond the water on the far side of the estuary is Grange over Sands.